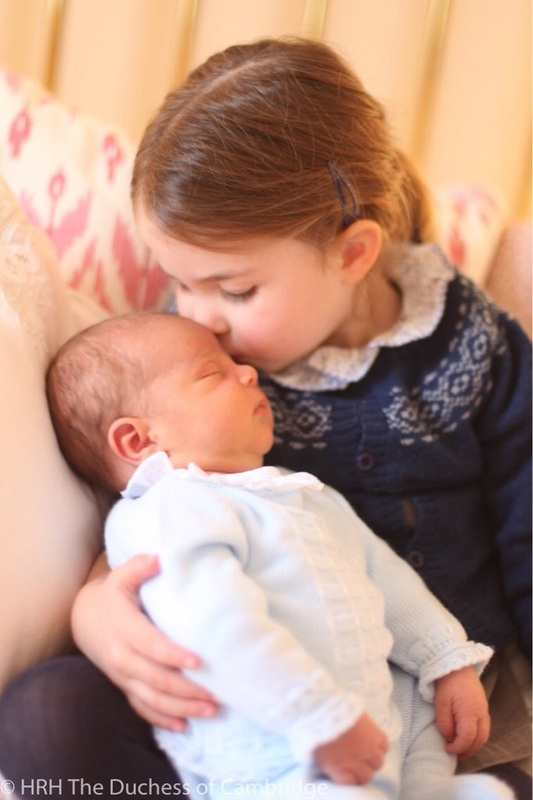 In response to a number of requests we have decided to create a page dedicated to Their Royal Highness Prince George and Princess Charlotte of Cambridge. It will include the latest photos, with details on apparel and other items, including strollers and reported purchases for the Prince and Princess. I will be writing this in reverse chronological order to ensure the latest details appear at the top of the page. 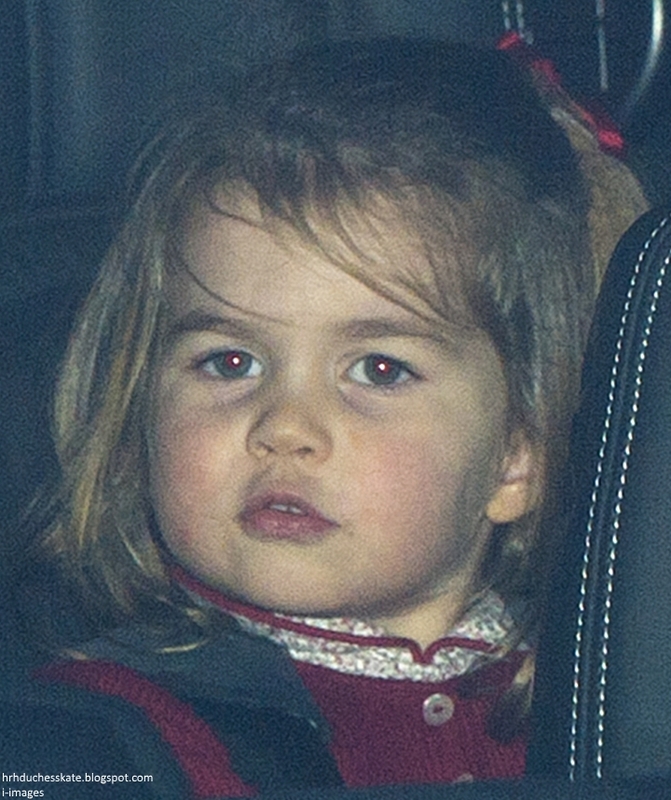 George and Charlotte were photographed arriving with their parents for the Queen's Pre-Christmas luncheon at Buckingham Palace. A little wave from Charlotte. 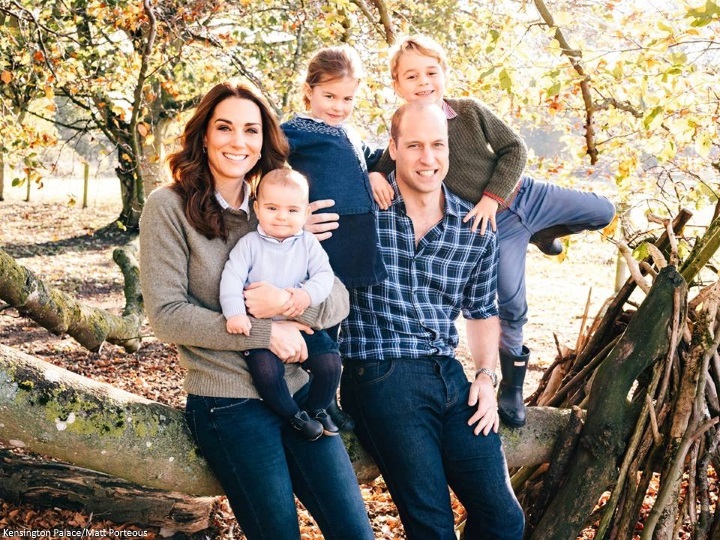 There was a festive royal surprise from Kensington Palace with the release of a gorgeous new family photograph of the Cambridges for their Christmas card. The photo was take in the autumn at their Norfolk bolthole Anmer Hall. The family were casually dressed in blues, earthy greens and jeans for the photoshoot. I imagine images like this from Anmer fill their personal photo albums and take pride of place in frames around their homes. It's a glimpse into their country life. 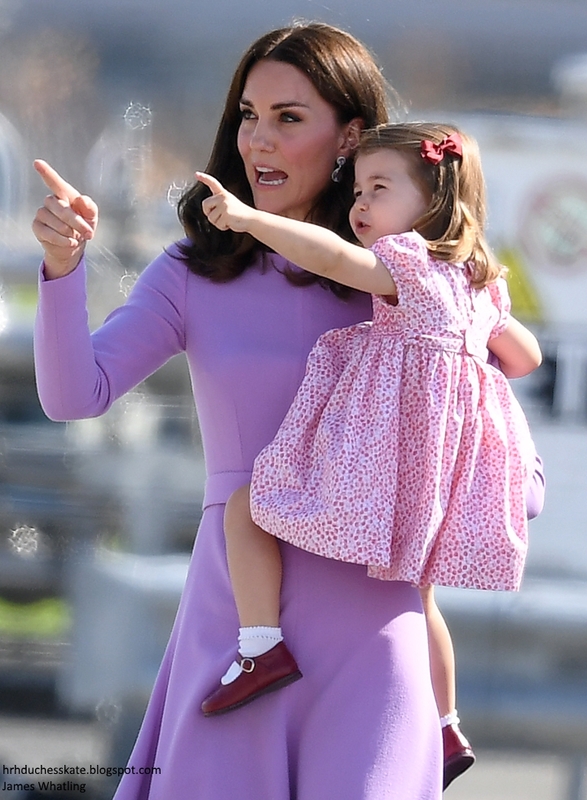 Note, Kate's holding her mini-me Prince Louis. Ahead of Prince Charles' 70th birthday, the Palace released a fantastic pair of photographs to mark the milestone. We very much hoped to see family photographs with George, Charlotte and Louis, and I was delighted to see relaxed portraits of the Wales family to mark the occasion. Official images tend to be largely formal, so the choice of a shot depicting the future king with his family, taken in the gardens of Clarence House in September, made for a delightful choice. A terrific shot of Kate and Louis with grandpa Charles. It was a blustery autumn morning in Windsor for Princess Eugenie and Jack Brooksbank's Windsor wedding. 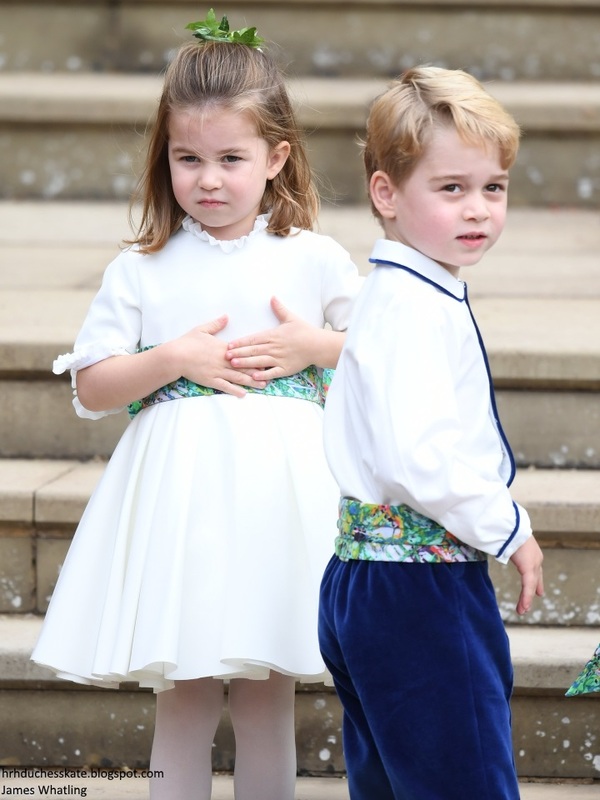 Less than five months after Harry and Meghan's wedding, George and Charlotte once again returned to Windsor for page boy and bridesmaid duties. These two could do this in their sleep by now! 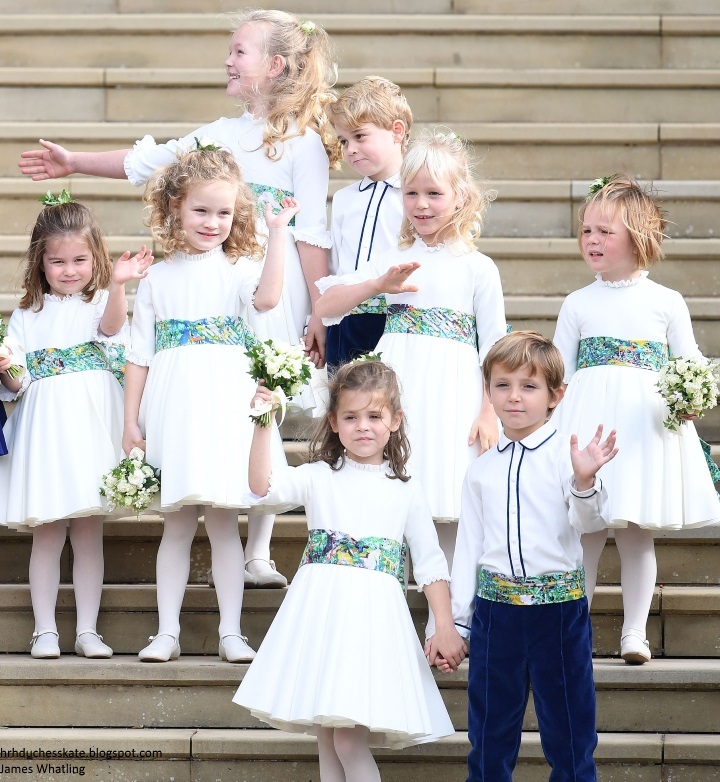 They joined a very royal bridal party, including Savannah and Isla Phillips, Mia Tindall, Maud Windsor (daughter of Freddie and Sophie Windsor who attends Thomas's Battersea with George), Robbie William's daughter Theodora, and Louis de Givenchy. The Earl and Countess of Wessex's children Louise and James were special attendants. Nanny Maria was on hand to help organise the children after they arrived. The bridesmaids' dresses and pageboys' uniforms by Amaia Arrieta of Amaia Kids. 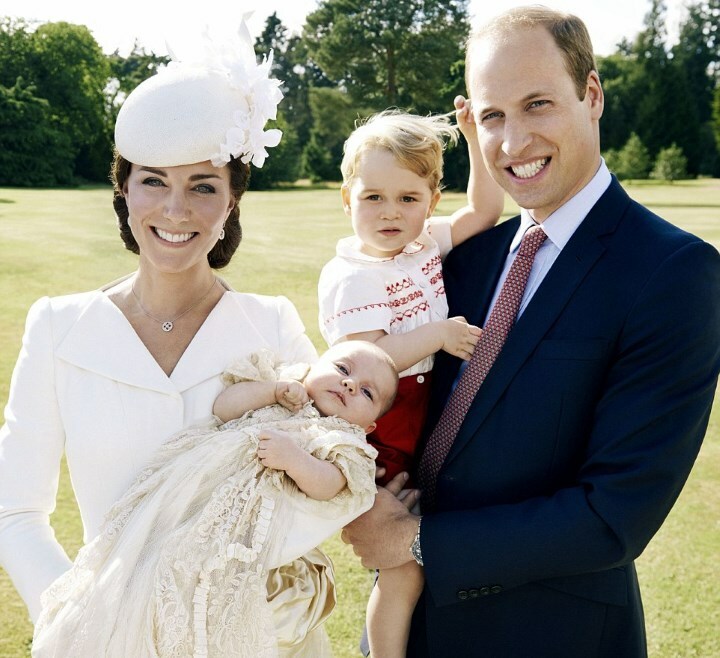 George and Charlotte took centre stage in the wedding portraits. The Cambridges enjoyed a family day out for the Norfolk wedding of Kate's close friend Sophie Carter and Robert Snuggs. 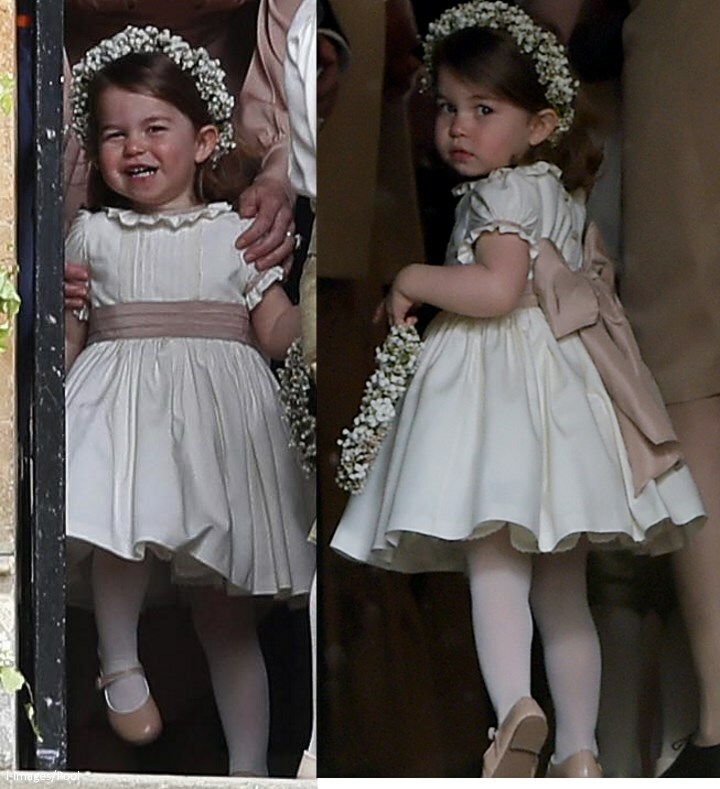 Sophie is Charlotte's godmother and fittingly the Princess and big brother Prince George were on hand for bridesmaid and page boy duties. 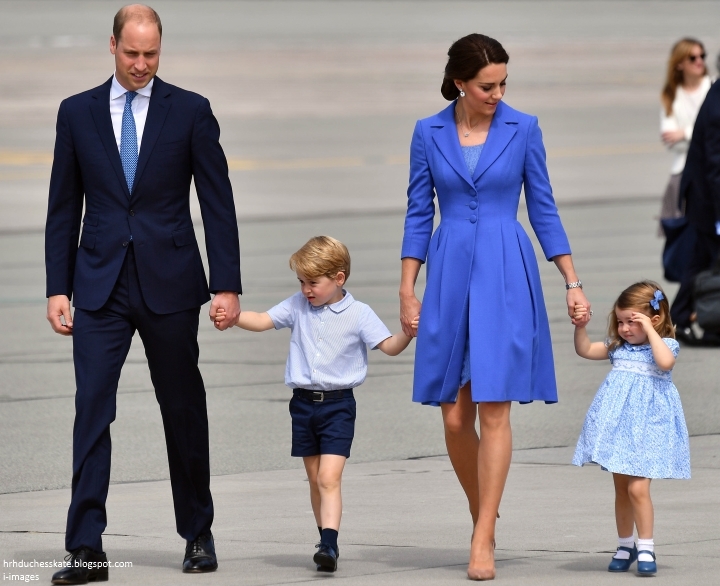 Monique Jessen reports: "Dressed in a traditional tailcoat and vest, 36-year-old William arrived with some friends, while Kate, also 36, arrived in a striking blue dress. She drove to the event with the children in a decorated farmer’s truck, which might usually be used for carrying people to a shoot or hunt." Amaia Kids created the outfits for the page boys and bridesmaids. 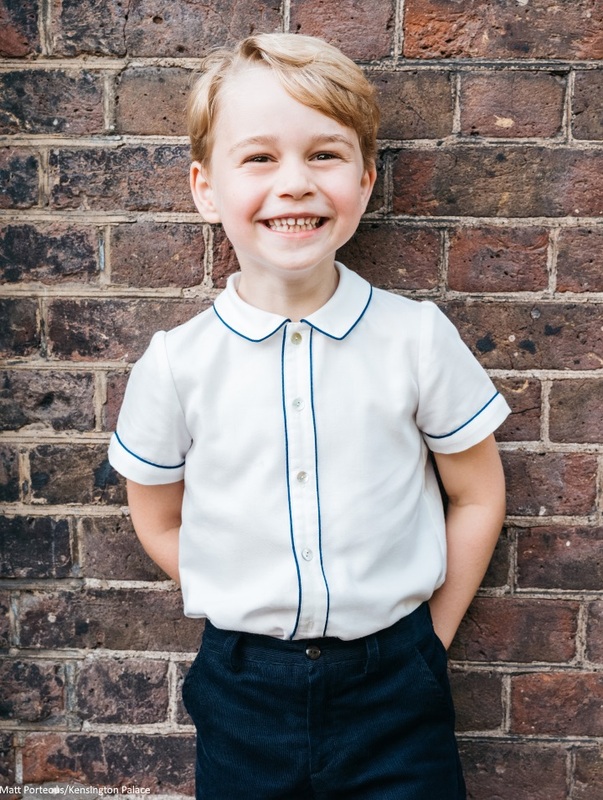 To celebrate Prince George's fifth birthday tomorrow, Kensington Palace released a photo of the future king taken in the Clarence House garden by Matt Porteous after Louis' christening. 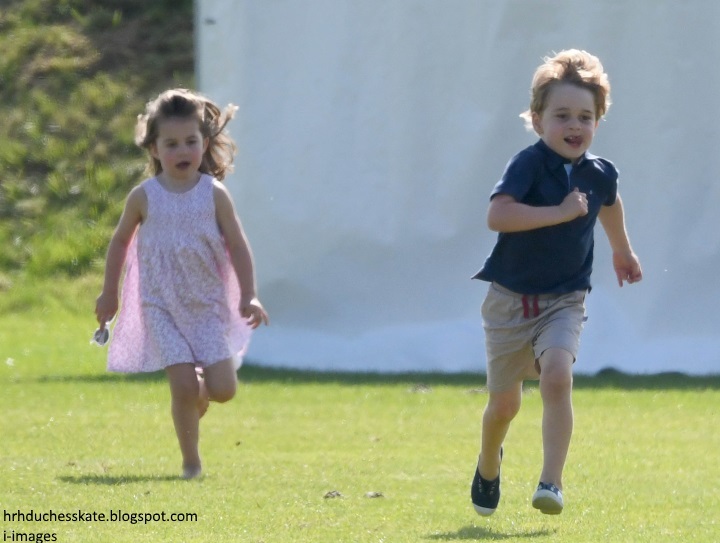 The future King will celebrate his birthday on the paradise island of Mustique where the Cambridges and Middletons are vacationing. 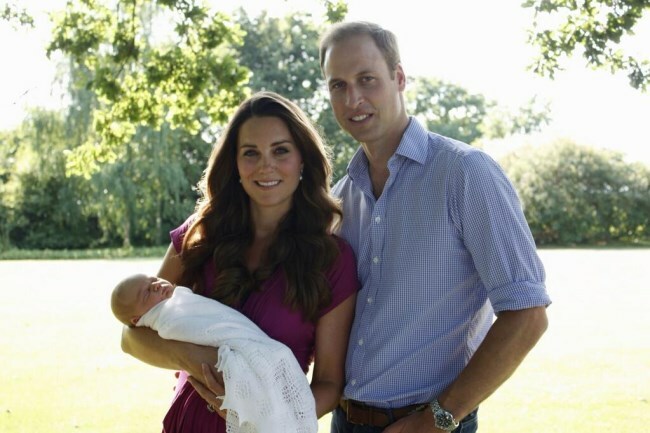 Almost a week after Prince Louis' christening, the eagerly awaited official portraits have been released. 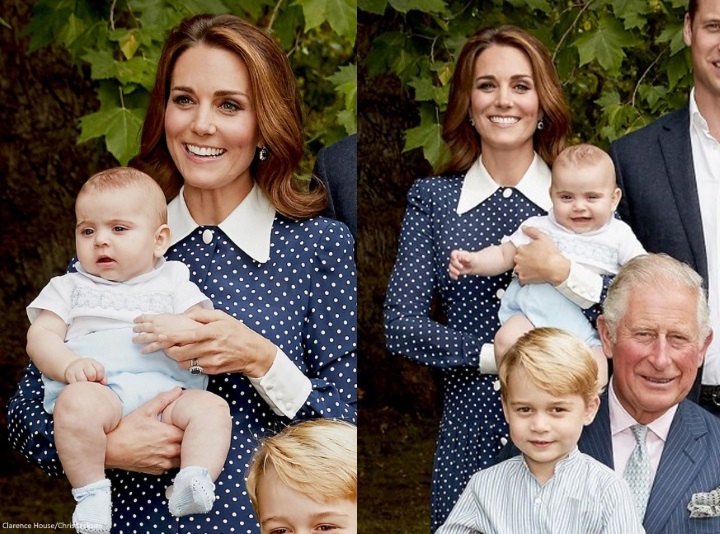 We saw several darling mother-son shots at the christening; it was a treat to see one from the photo session too. 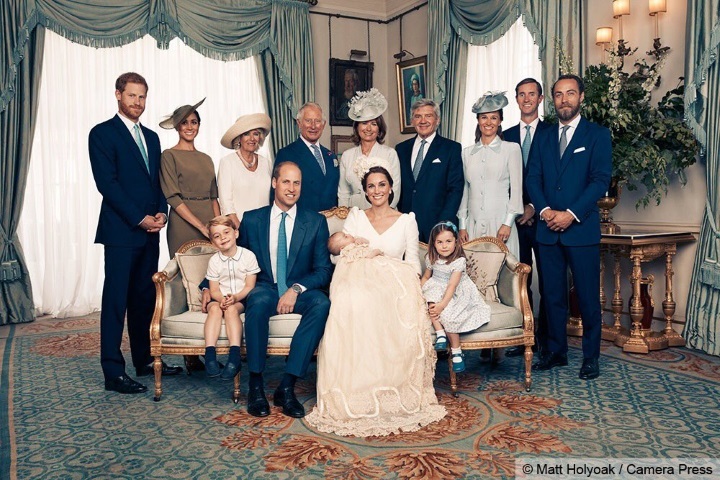 The portraits were taken at Clarence House's Morning Room following the christening at the Chapel Royal, St James's Palace, by renowned photographer Matt Holyoak. 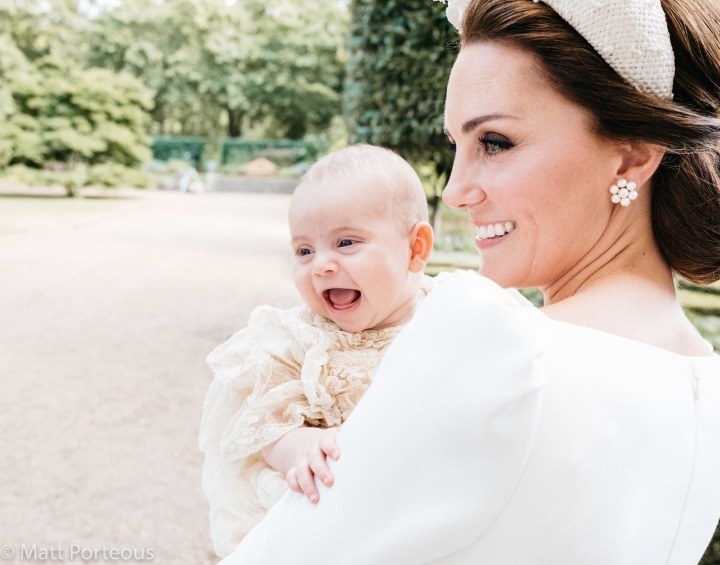 The photographer said "I was truly honoured at being asked to take the official photographs at the christening of Prince Louis, and to witness at first hand such a happy event. Everyone was so relaxed and in such good spirits, it was an absolute pleasure. I only hope I have captured some of that joy in my photographs." The Palace released an additional photograph of Kate and Louis with the message "Their Royal Highnesses hope that everyone enjoys this lovely photograph of Prince Louis as much as they do." 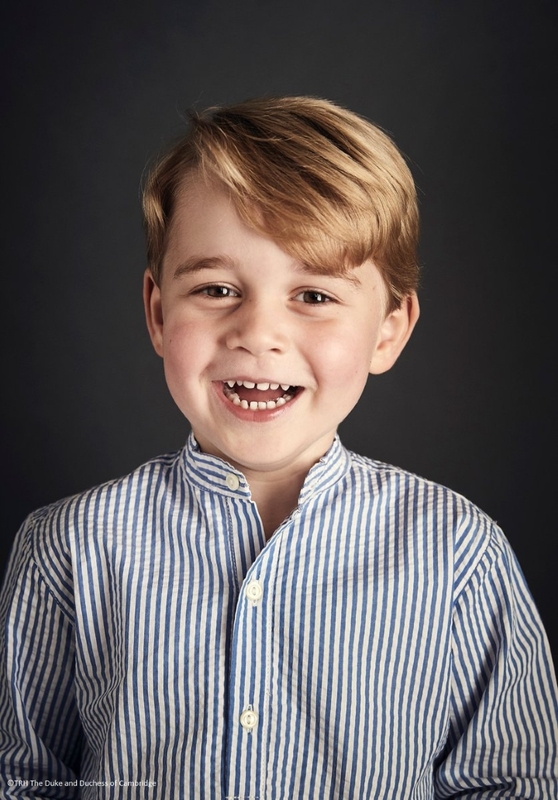 The photo was taken by Matt Porteous, the photographer took George's third birthday portraits. I imagine this is one from their personal album from the day. 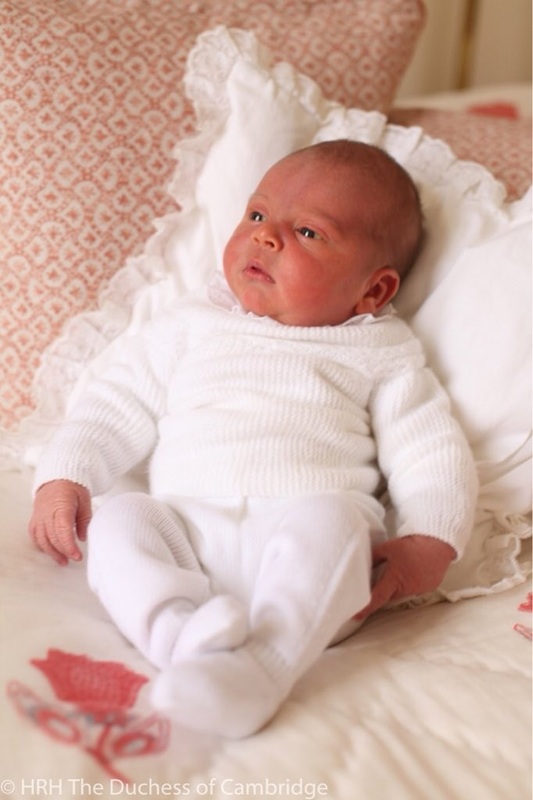 On Monday 9 July, Prince Louis Arthur Charles of Cambridge was baptised at The Chapel Royal, St James’s Palace. 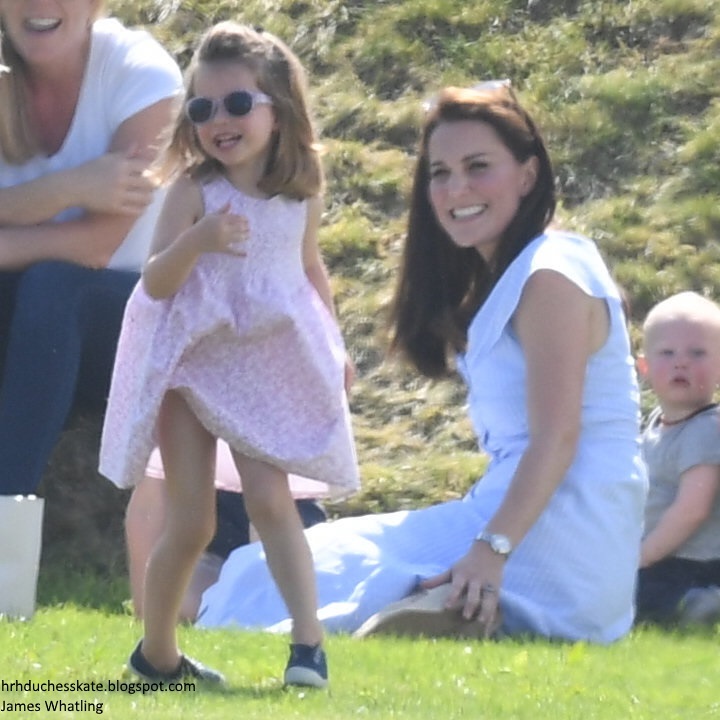 Following Trooping The Colour yesterday, Kate, George and Charlotte cheered on Prince William as he participated in the Maserati Royal Charity Polo Trophy at the Beaufort Polo Club in Tetbury. Charlotte was in great spirits for her first polo outing. George makes a run for it. 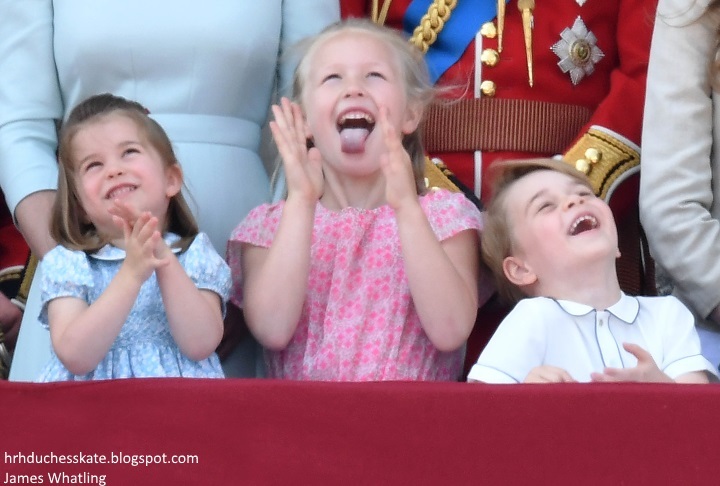 The Cambridge children had a ball. 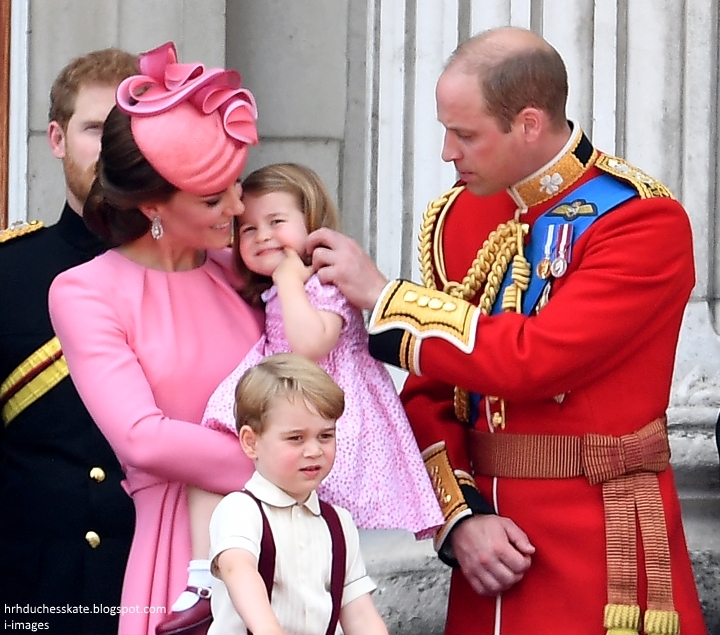 George and Charlotte joined their parents on the balcony of Buckingham Palace once again for this year's Trooping The Colour. The pair enjoyed spending time with their cousin Savannah Phillips. 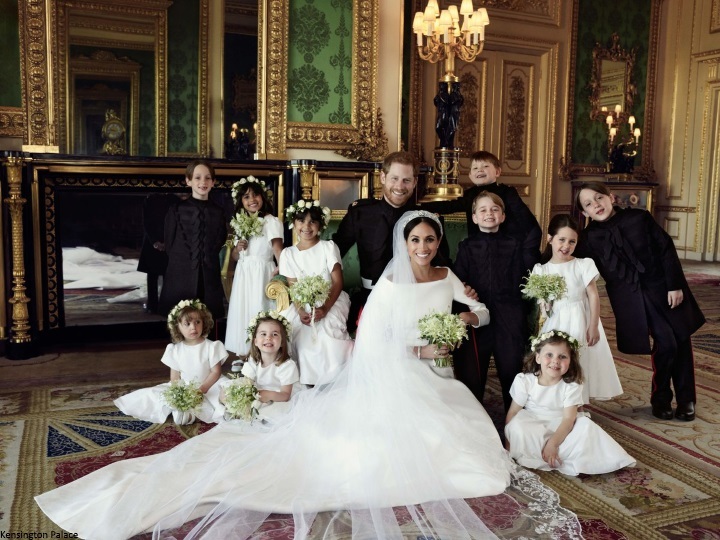 The official wedding portraits, taken by Alexi Lubomirski, were released by the Palace. 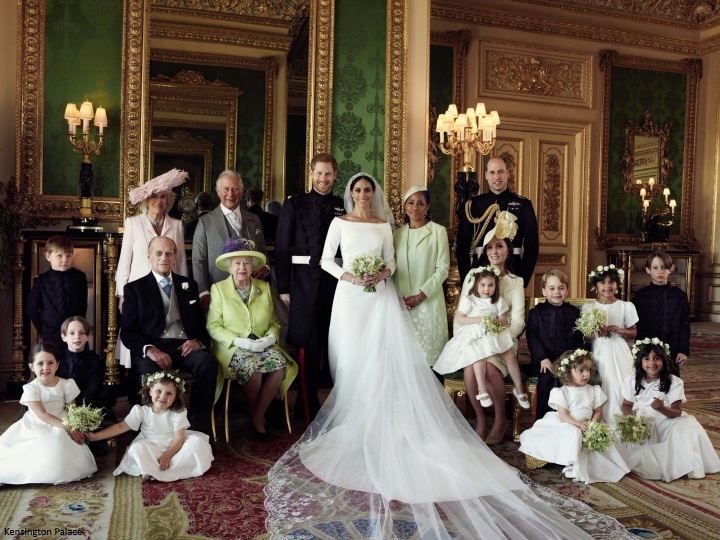 The family photo featuring the bride and groom with the Queen, Prince Philip, Prince Charles, the Duchess of Cornwall, Meghan's mother Doria Ragland, the Cambridges and the page boys and bridesmaids in the Green Drawing Room at Windsor Castle is just fabulous. The mixtures of whites, creams, green and black makes for a striking colour scheme against the vivid backdrop. 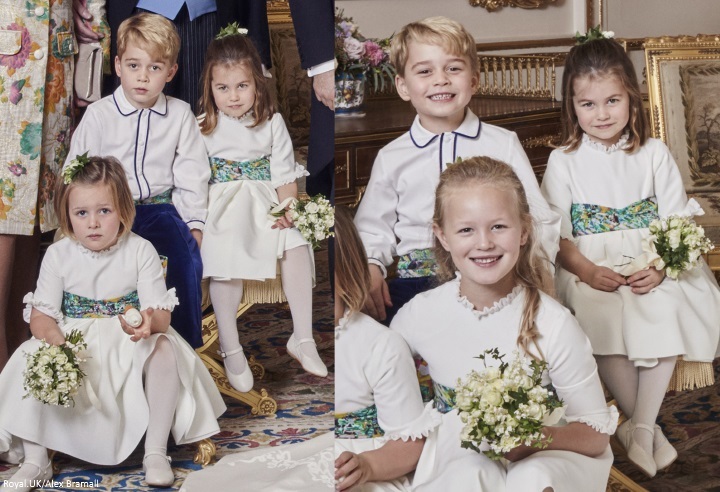 George and Charlotte featured in a second portrait with the other children in the bridal party. In the back row: Brian Mulroney, Remi Litt, Rylan Litt, Jasper Dyer, Prince George, Ivy Mulroney and John Mulroney. In the front row it's Zalie Warren, Princess Charlotte and Florence van Cutsem. 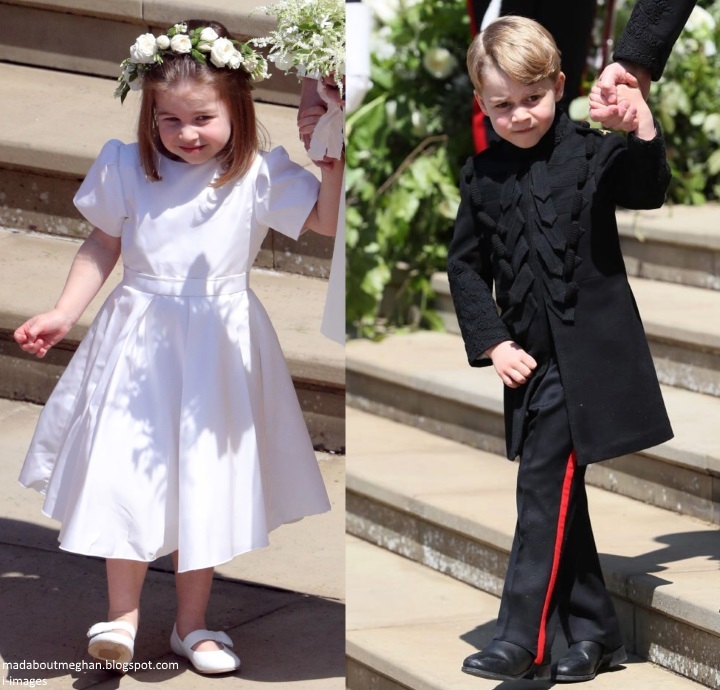 Prince George and Princess Charlotte did an outstanding job as page boy and bridesmaid at Prince Harry and Meghan Markle's Windsor wedding. A darling shot of Charlotte. Making their way down the aisle with their companions. 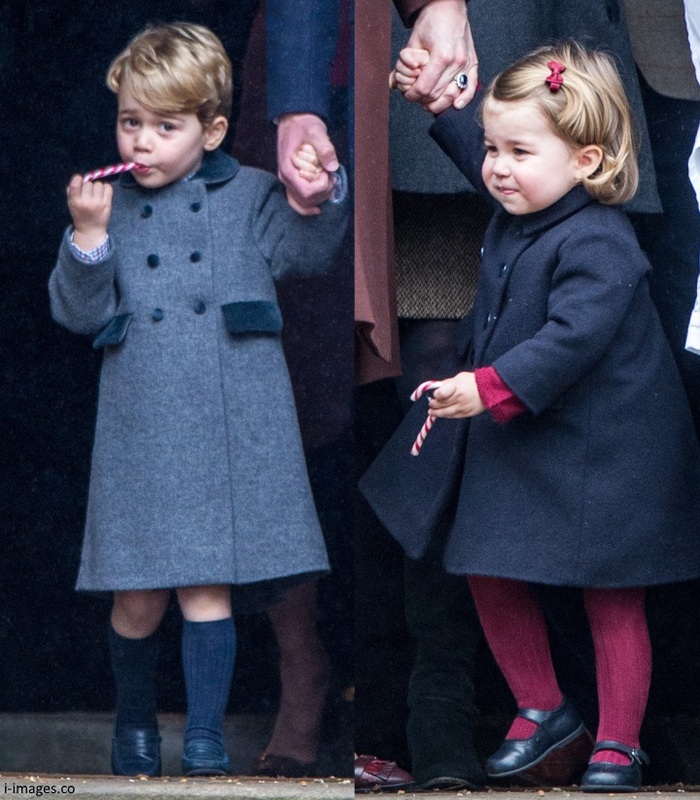 The page boys wore miniature versions of the Blues and Royals frockcoat. The uniform draws its insignia from the Blues and Royals, which is an old regiment of the Duke of Cambridge and Prince Harry. Both wore Blues and Royals frockcoats for the Wedding Day. The frockcoats are made from blue doeskin, single-breasted in style with a stand-up collar and completed with figured braiding of the regimental pattern. The figured braiding was scaled down for the pages, as otherwise it would have gone above their shoulders. As a special memento, each page had their initials embroidered in gold on their shoulder straps. The pages did not wear hats or white waist belts for practical reasons. The bridesmaid dresses were designed to have the same timeless purity as Ms Markle's dress. Each one is sculpted in ivory silk Radzimir, is high-waisted with short puff sleeves, and hand finished with a double silk ribbon detail tied at the back in a bow. The bridesmaids’ dresses include pockets and pleated skirts to create a relaxed and luxurious silhouette. Each also wore white leather Aquazurra shoes, monogrammed with the bridesmaid's initials and the wedding date. The shoes are a gift from Meghan to the young ladies as a keepsake of the special day. In an unexpected treat for royal fans the first official portraits of Prince Louis have been released by Kensington Palace in time for the Sunday papers. Even better, the photos include Charlotte. 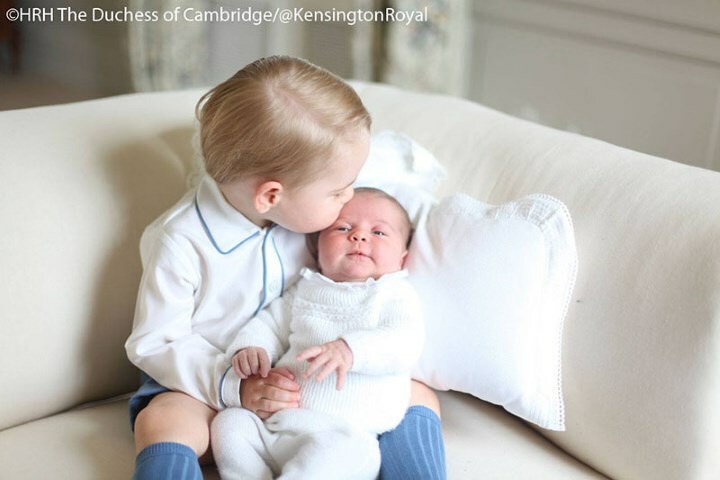 This image of big sister Charlotte, taken on her third birthday last Wednesday, giving the little Prince a kiss proved particularly popular. On a sunny St George's Day morning the Duke and Duchess of Cambridge welcomed their third child, a son, at St Mary's Hospital. 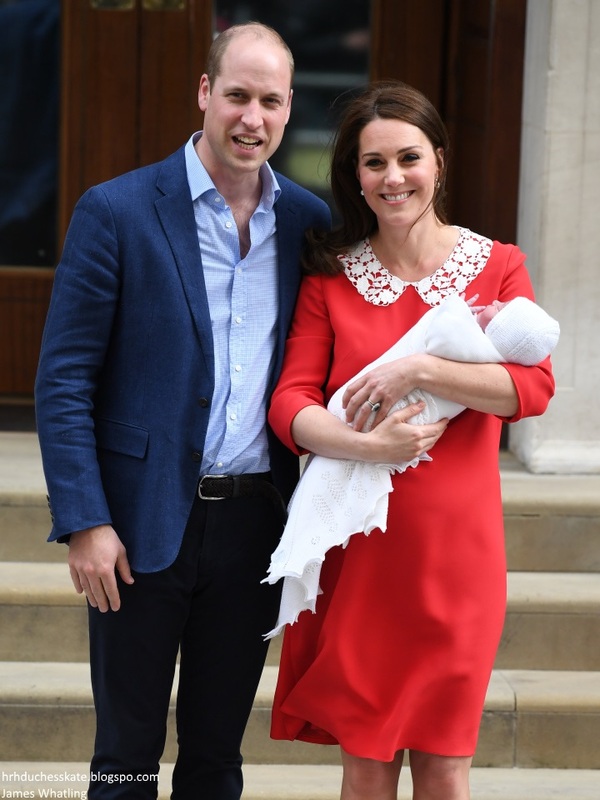 It all began shortly after 8 am when Kensington Palace confirmed the Duchess had been admitted to the Lindo Wing at 6 am in "the early stages of labour". Kate travelled from the Palace by car with William. At 1.05 pm, the Palace confirmed the Duchess had been safely delivered of a son weighing 8 lbs 7 oz at 11.01 am. Mother and baby were doing very well and the Palace added that members of both families were "delighted". 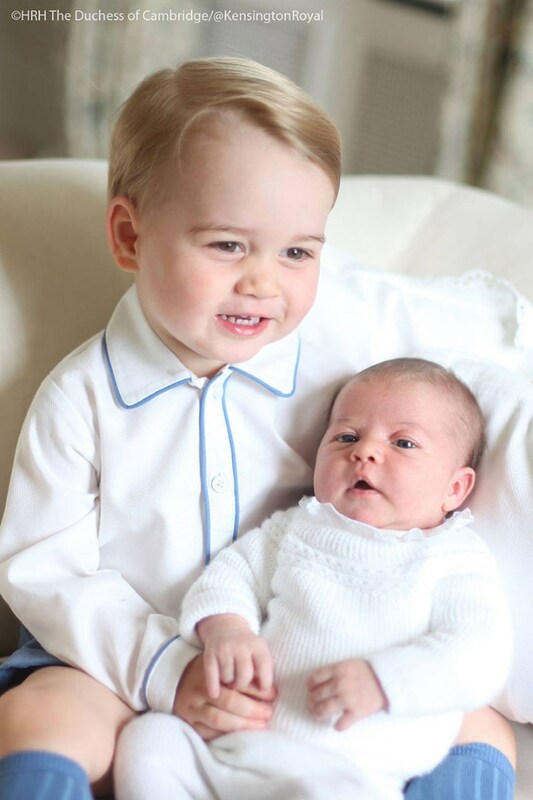 Just hours later George and Charlotte paid a special visit to meet their little brother. 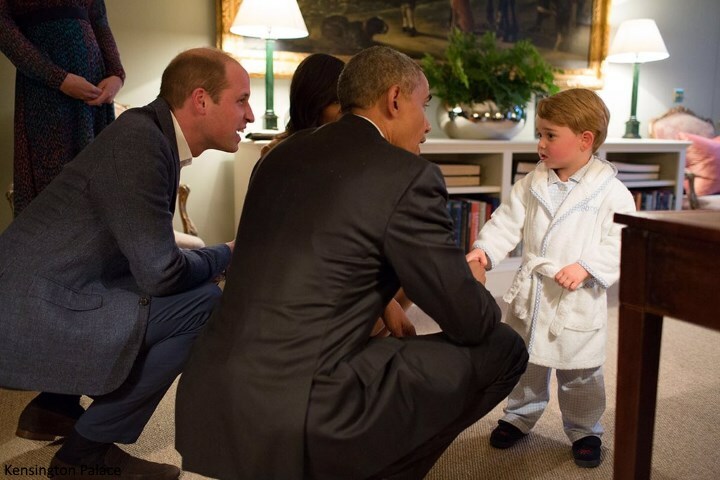 Prince George wore his school uniform. 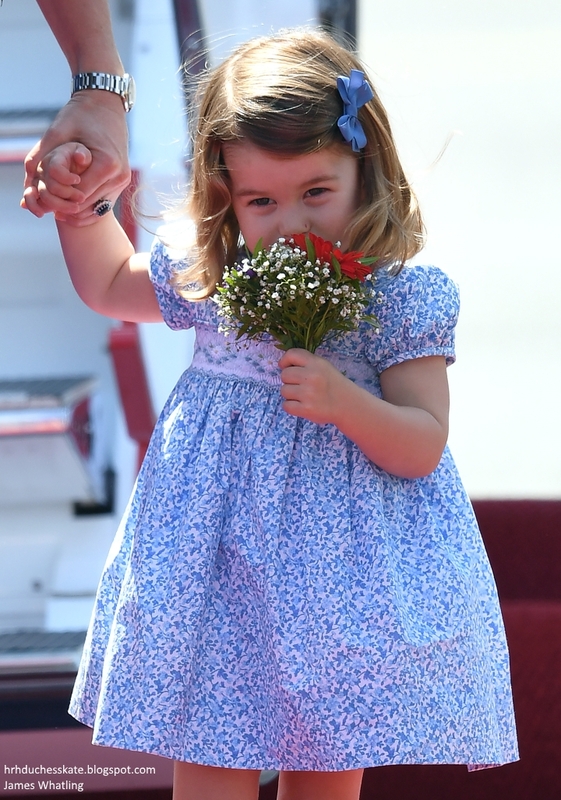 Charlotte was cute as a button in a periwinkle dress from Little Alice London. The brand is owned by Alice Avenel, a friend of Kate's from Marlborough College. 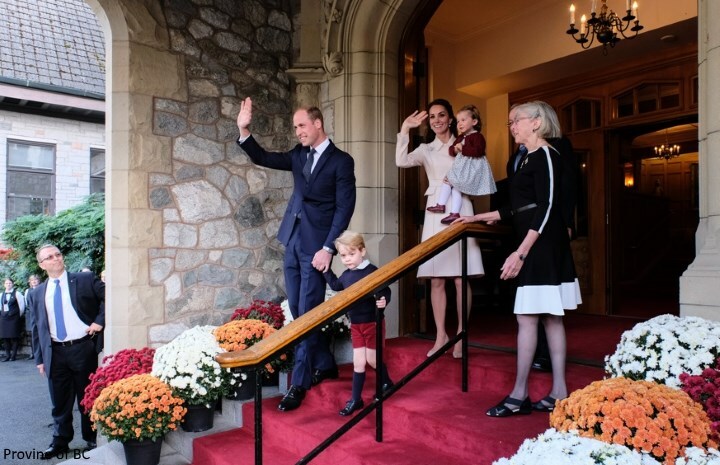 In a statement, the Palace said: "The Duke and Duchess of Cambridge and their son will travel home to Kensington Palace. Their Royal Highnesses would like to thank all staff at the hospital for the care and treatment they have received. They would also like to thank everyone for their warm wishes." 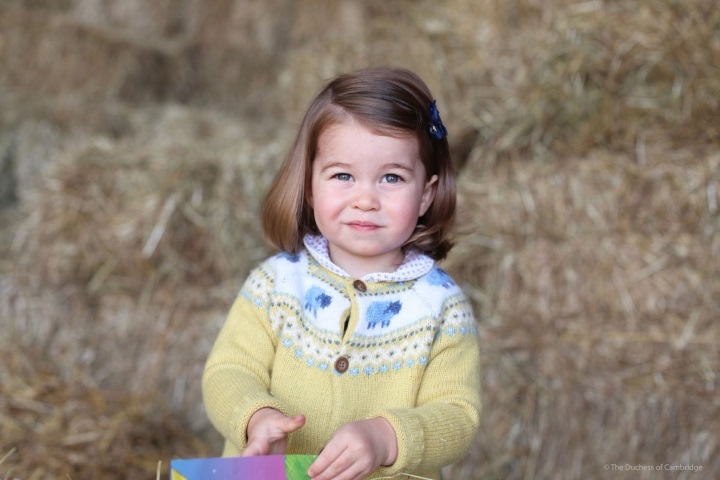 Princess Charlotte marked an important milestone today, attending her first day at Willcocks Nursery School. 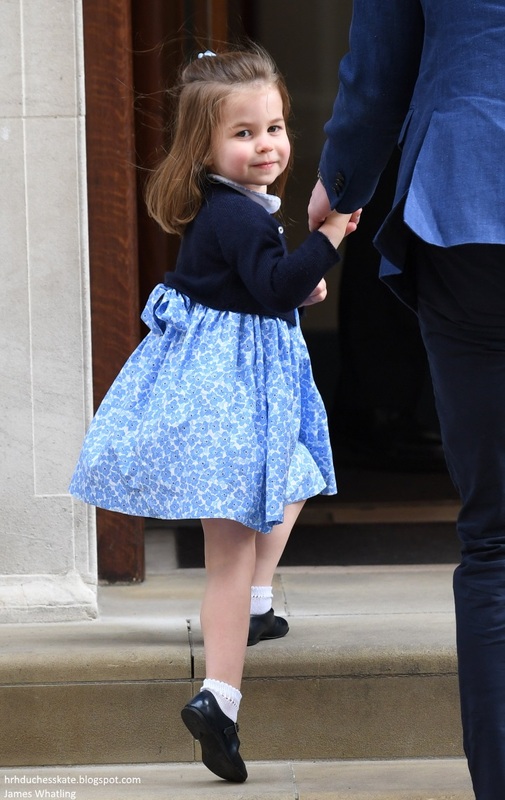 The adorable images were taken by Kate this morning at Kensington Palace before she and William dropped their daughter off for her first day. They are gorgeous shots and capture Charlotte's personality wonderfully. 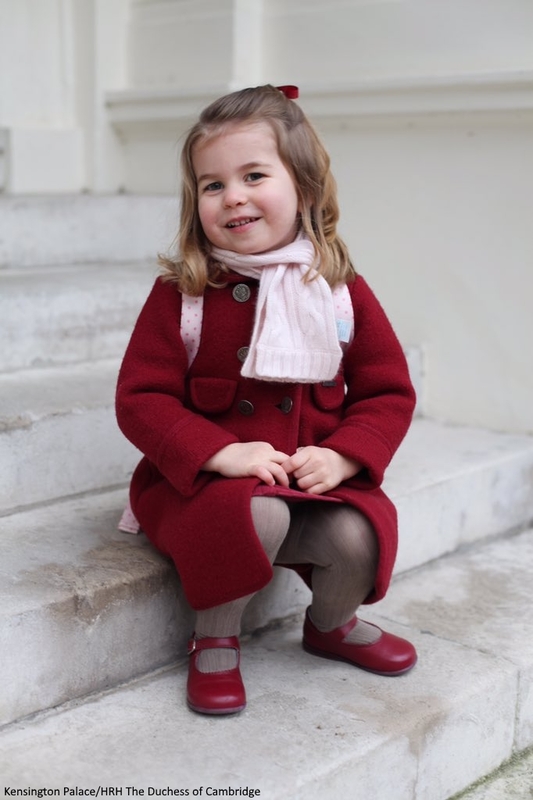 The Princess looked cute as a button in her burgundy coat and shoes. Royal reporter for The Mirror, Victoria Murphy was told William and Kate thought Willcocks was an ideal first step for their daughter's education and were impressed with the staff there. 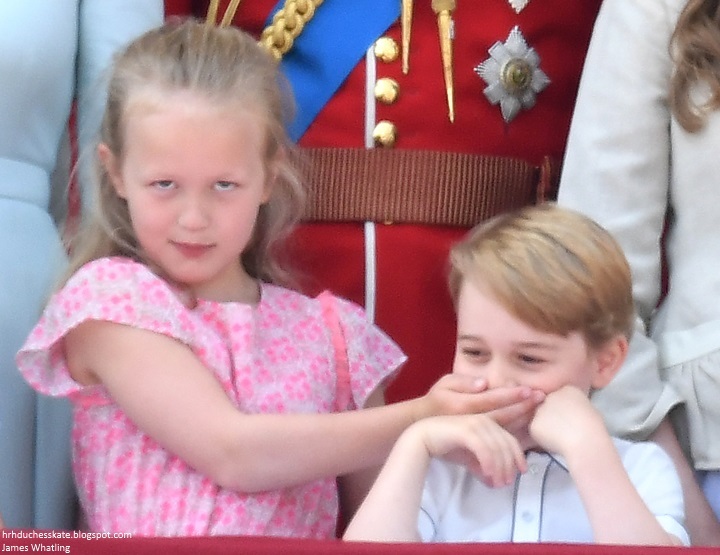 Victoria added: "Unlike Prince George who started nursery in Norfolk part time, Princess Charlotte will be attending her London nursery full-time." Morning classes run five days per week, with afternoon classes held on three days. We hope Charlotte had a wonderful first day! 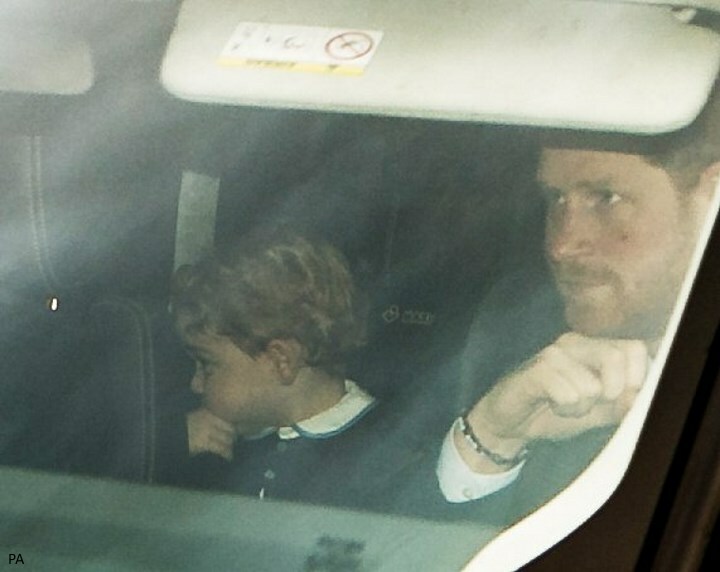 Prince George and Princess Charlotte were photographed arriving with their parents for the Queen's Pre-Christmas luncheon. 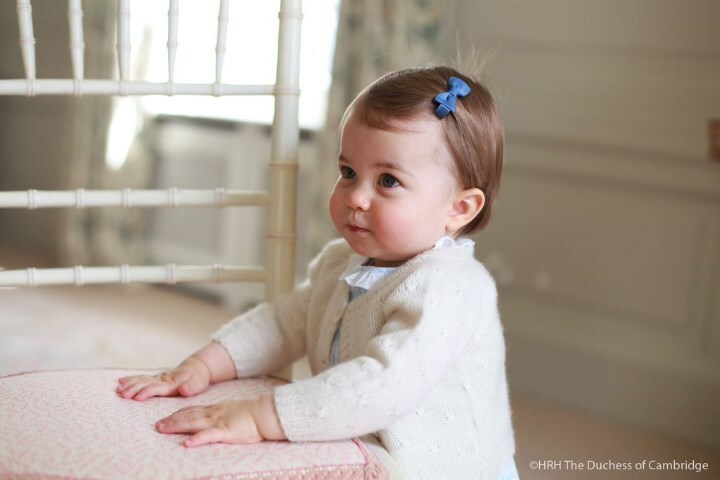 Princess Charlotte wearing one of her signature bows. 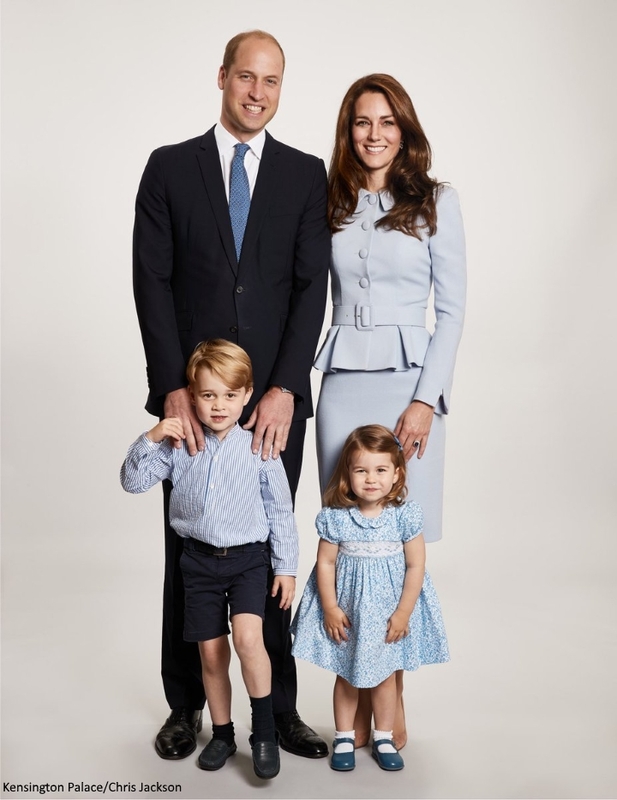 The Duke and Duchess of Cambridge released a new photograph of their family to mark the festive season. 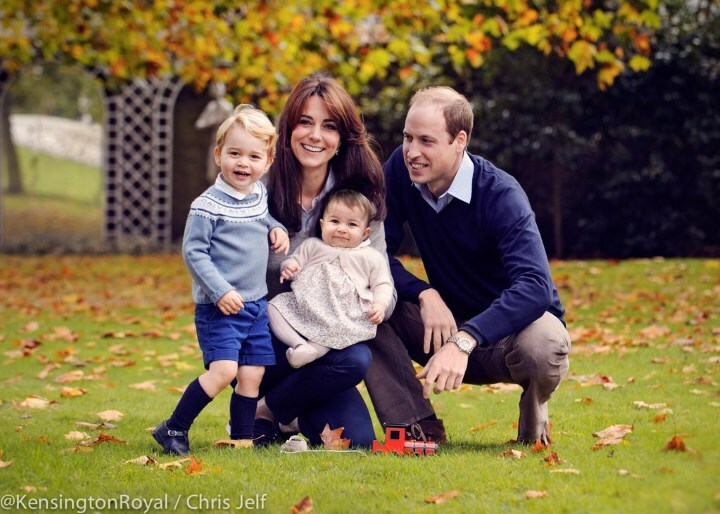 The image of William, Kate, George and Charlotte features on their Christmas card this year. The photo was taken by Chris Jackson at Kensington Palace earlier this year. 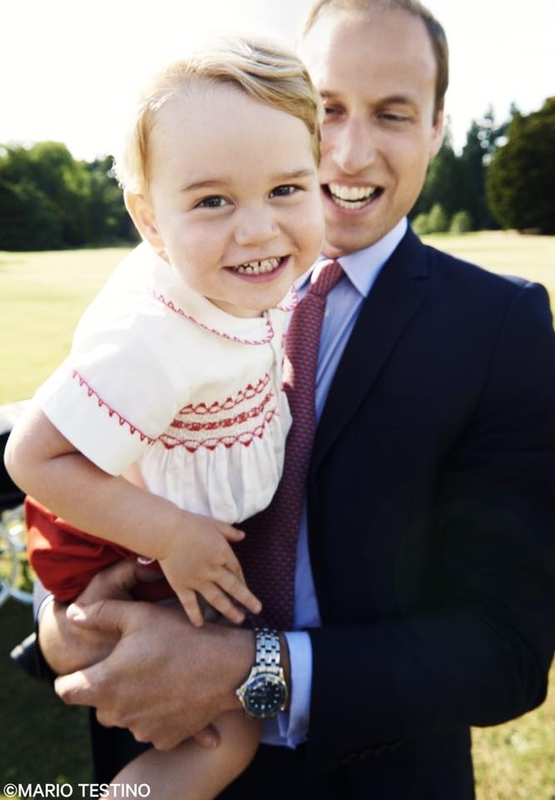 I expect at the same time as Prince George's birthday portrait, as he's wearing the same outfit. Jackson wrote on Instagram "Delighted that the Duke and Duchess of Cambridge have chosen to use this family portrait I shot as their Christmas Card this year, Merry Christmas." On Thurday, 7 September, 2017, Prince George marked a major milestone - his first day of school. 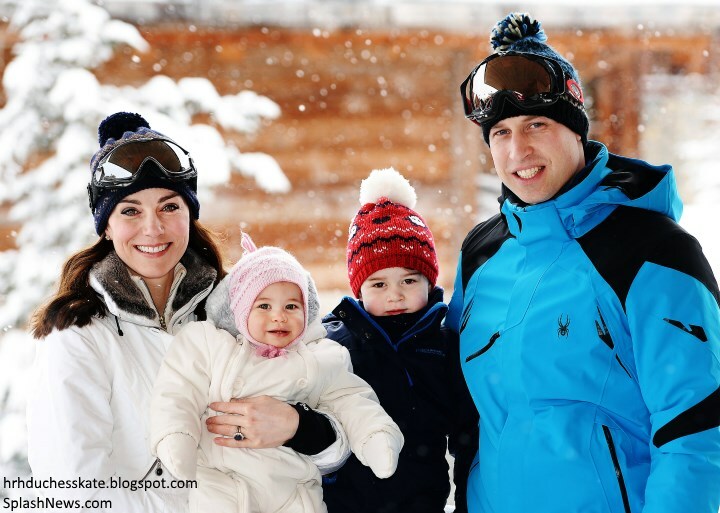 Earlier this week, it was announced, Kate is expecting her third child, and suffering with Hyperemesis gravidarum. The acute sickness meant she had to cancel two engagements, with William confirming at an engagement on Tuesday: "There's not much sleep going on." It was very much a touch-and-go situation. 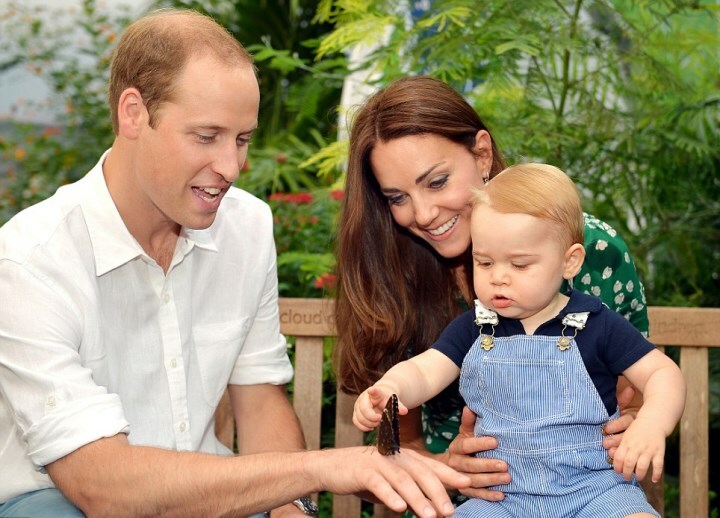 This morning KP confirmed that fact "The Duchess remains unwell and will be unable to accompany Prince George. The little prince arrived hand in hand at Thomas's Battersea with his father. William and George were greeted by the Head of the Lower School, Helen Haslem, who escorted them to George's reception classroom. 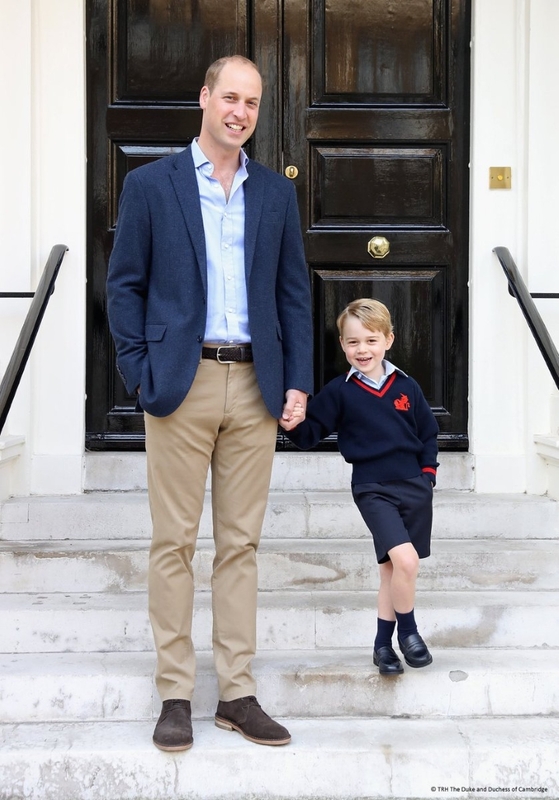 Afterwards, Kensington Palace shared this photo of William and George outside the Palace with the message "The image was taken shortly before Prince George left for his first day of school at Thomas's Battersea. 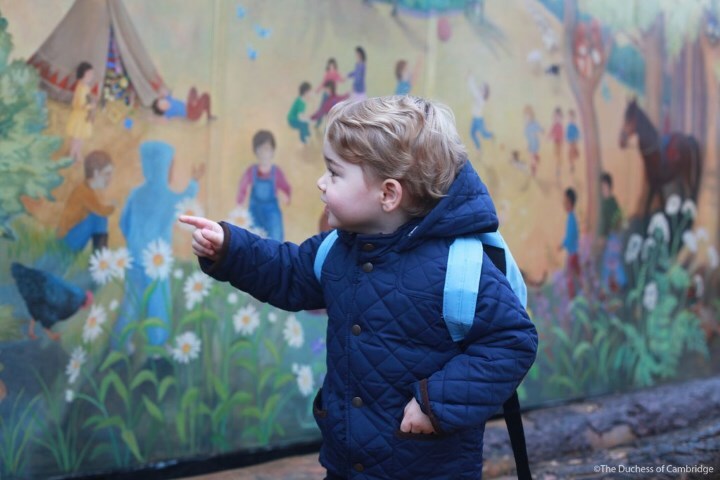 TRH would like to thank everyone for all of the kind messages they have received as Prince George starts school." To mark Prince George's fourth birthday, Kensington Palace released a darling new photograph of the Prince, taken by Chris Jackson at KP last month.The photographer wrote on Instagram "I'm thrilled and honoured that the Duke and Duchess of Cambridge have chosen to release this portrait I took to celebrate Prince George's 4th Birthday. He is such a happy little boy and certainly injects some fun into a photoshoot!" The photo was released with the message "TRH are very pleased to share this lovely picture, and would like to thank everyone for all of the kind messages they have received". 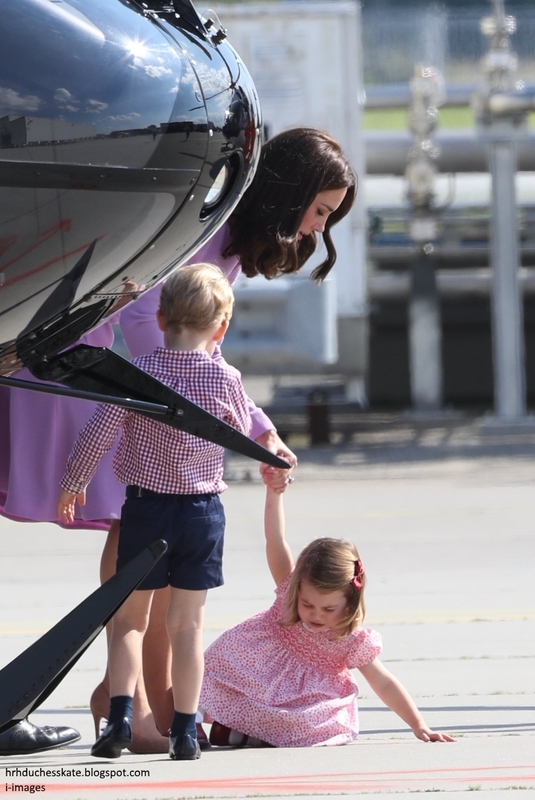 Memorable scenes as the Cambridges departed Berlin to return to London following a whirlwind five day tour. Back in Kate's arms, Charlotte was back to herself. George and Charlotte joined in to explore an EC145 helicopter - the same one William flies with the East Anglian Air Ambulance. George was particularly eager to take a look round. 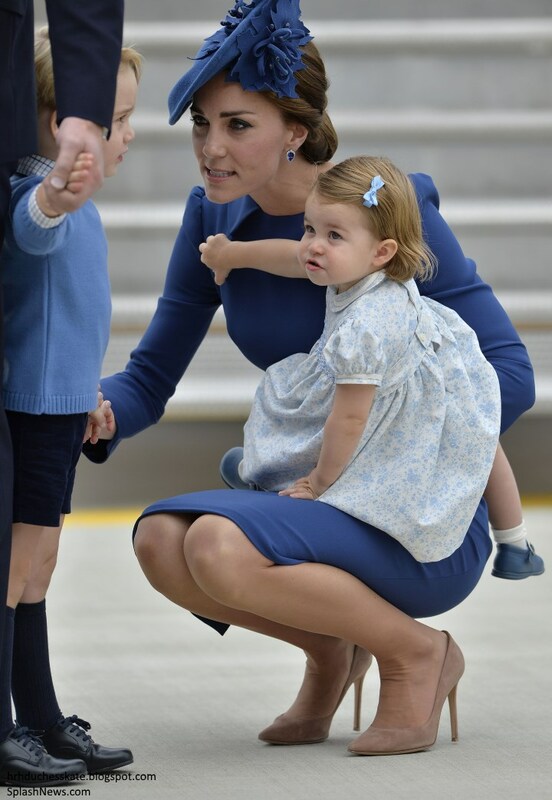 The Cambridge family donned blue for their arrival in Berlin. Matching bouquets for Kate and Charlotte. 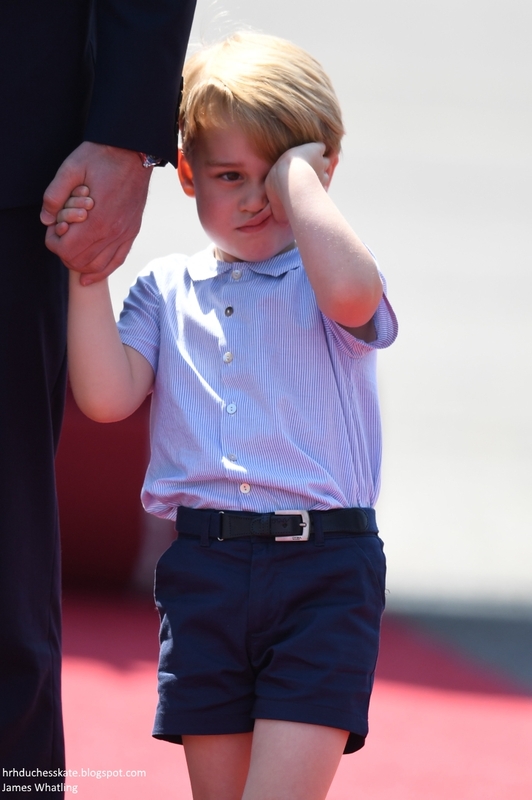 Prince George looked like he had just woken up from a nap upon arrival, he held William's hand as they made their way to the car. 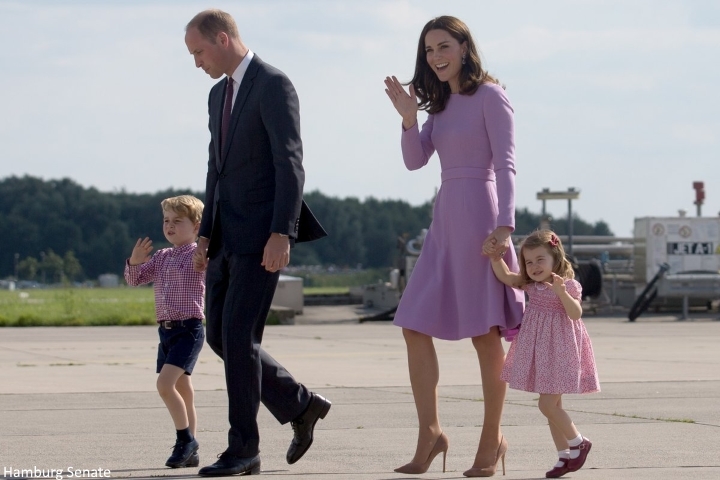 The Cambridges' long awaited royal tour of Poland and Germany kicked off in style as they arrived in Warsaw with Prince George and Princess Charlotte. Charlotte looked cute as a button in a red print dress. 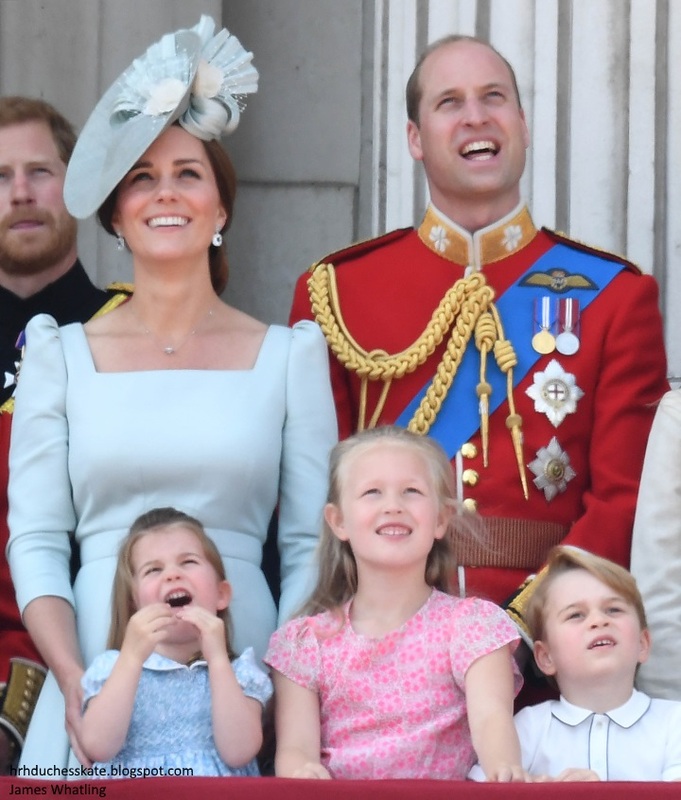 The Cambridges made their second appearance as a family of four on the balcony at Buckingham Palace for Trooping The Colour. The pair enjoyed the flypast immensely and waved as it flew past. 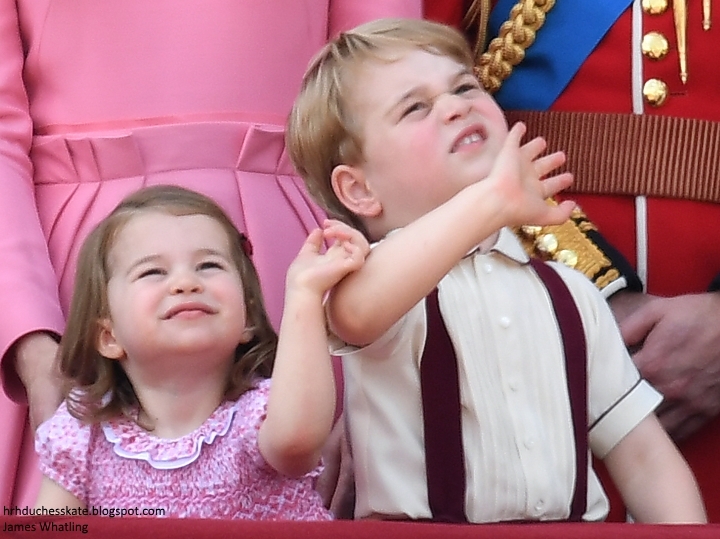 Charlotte was in a pretty pink dress and George donned burgundy suspenders, shorts and a cream shirt for the day. As part of the ongoing Heads Together campaign, Prince William was interviewed by Alastair Campbell for British GQ. 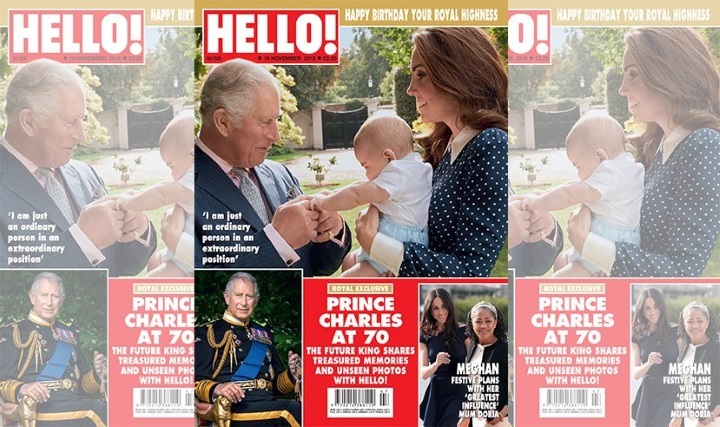 The spread featured a new black and white photograph of the Cambridges relaxing at Kensington Palace as they watch George, Charlotte and Lupo play. The photo was taken in April by Norman Jean Roy. 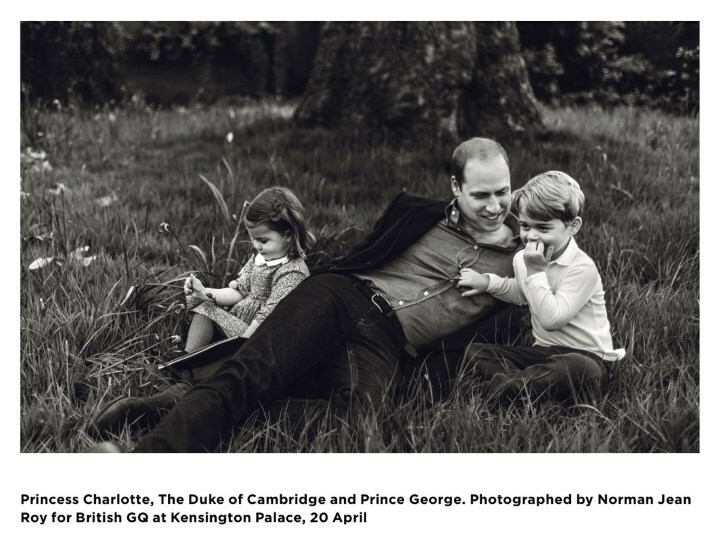 This very sweet image of William with George and Charlotte was also included. 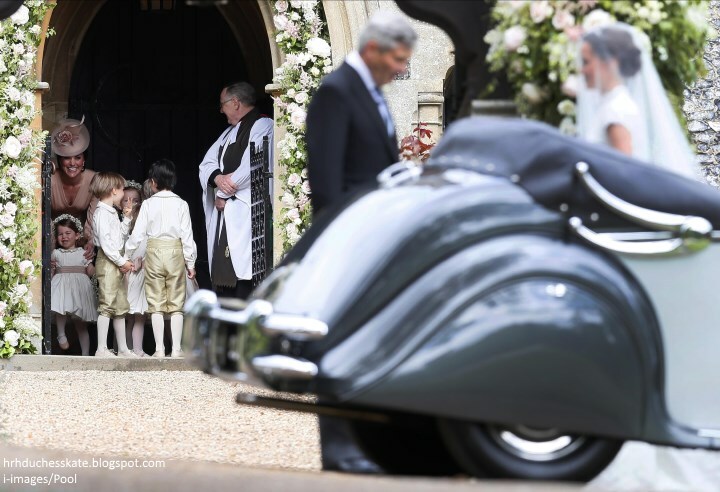 George and Charlotte simply stole the show at the wedding of their aunt Pippa Middleton and James Matthews at St Mark's Church, Englefield. It was wonderful to see the Prince and Princess in their roles as page boy and bridesmaid. They were joined by Countess Philippa Hoyos, Lily French, Avia Horner, Casimir Tatos, Edward Sebire and William Ward. 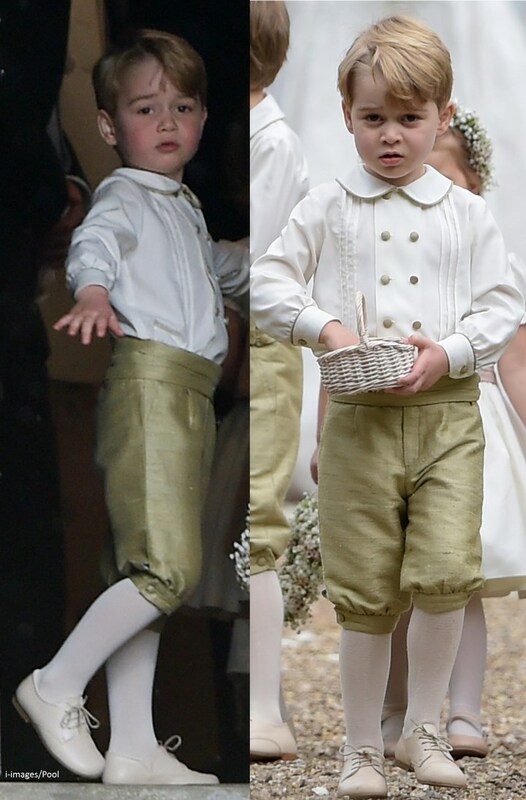 They were in adorable ensembles commissioned from Pepa & Co.
A closer look at page boy Prince George. 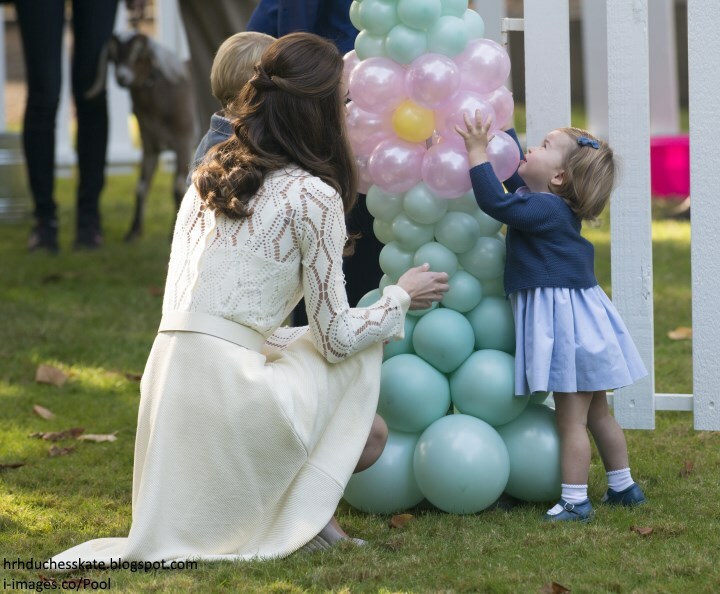 An adorable new photo taken by the Duchess of Cambridge at Anmer Hall were released to mark Princess Charlotte's 2nd birthday. The Palace said "The Duke and Duchess are delighted to share to share the photograph to mark their daughter's special day on Tuesday. 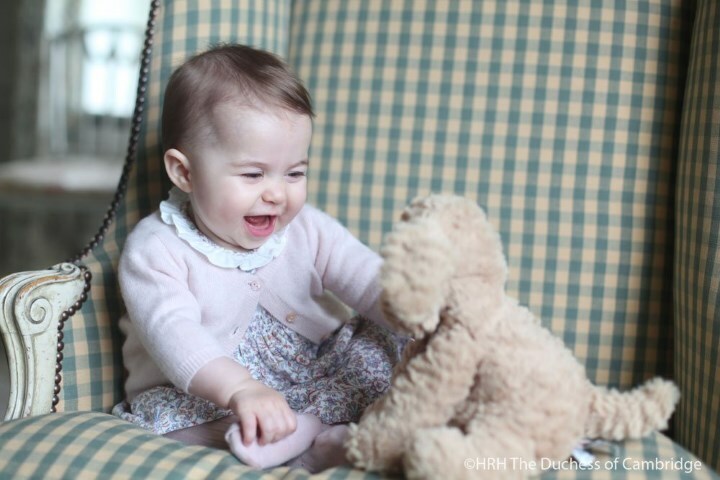 Their Royal Highnesses would like to thank everyone for all of the lovely messages they have received, and hope that everyone enjoys this photograph of Princess Charlotte as much as they do." 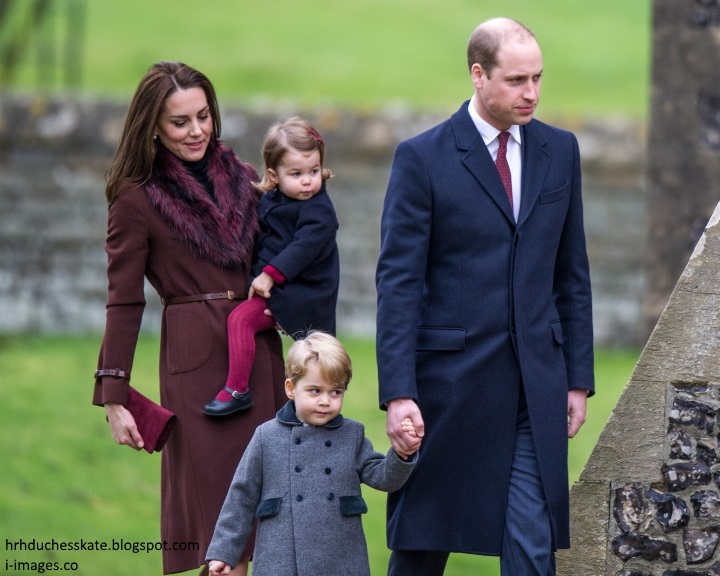 The Duke and Duchess of Cambridge took George and Charlotte to church on Christmas Day for the first time at St Mark's in Englefield. We may only see arrival photos through car windows - nonetheless Her Majesty's annual pre-Christmas luncheon at Buckingham Palace is one of my favourite staples on the royal calendar. It heralds Christmas, which just days away, and remains a constant and enduring tradition within the family. 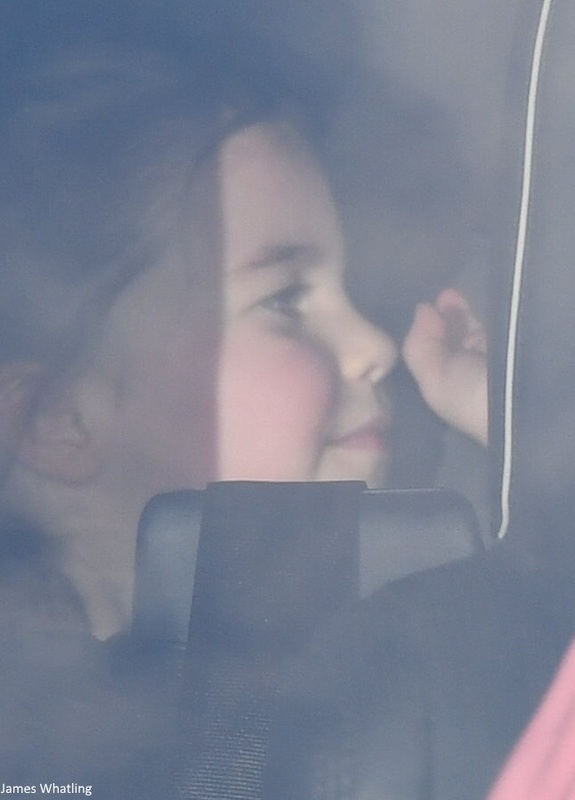 Below, we see William driving with Harry in the front seat; Kate sat in the back with George and Charlotte. We didn't see a clear photo of Charlotte unfortunately. 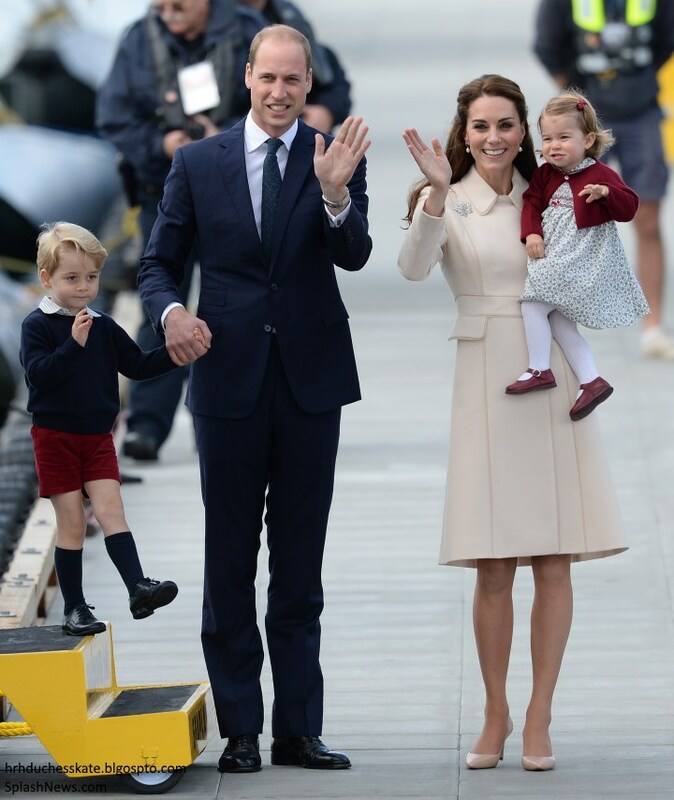 The Cambridges' eight-day tour of Canada concluded when the family arrived at Victoria Harbour seaplane terminal. Below, the Cambridges leaving Government House which served as their base throughout the week. When George stepped out of the car he couldn't resist giving a big wave to everyone. 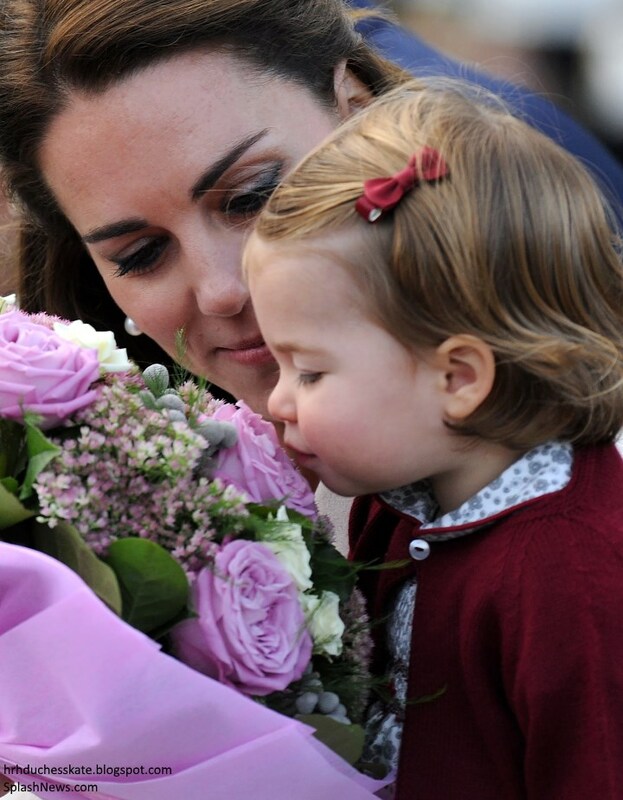 Charlotte smells a bunch of flowers given to Kate. 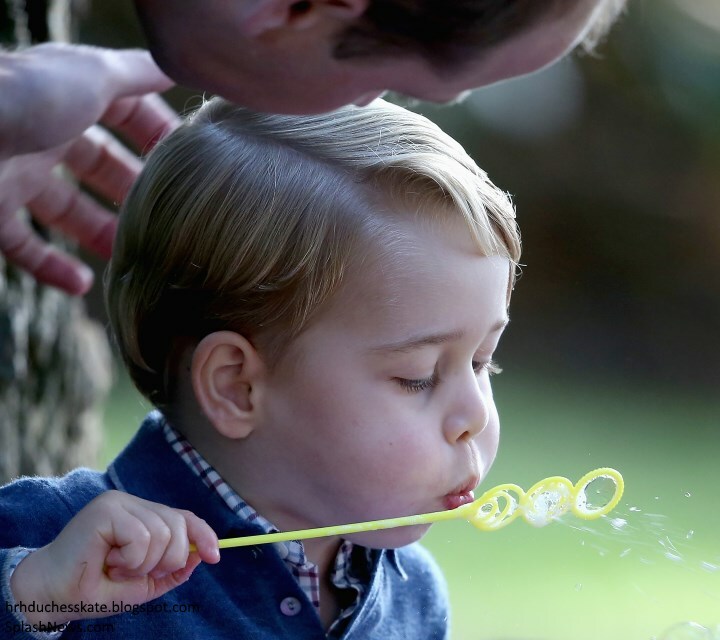 It was bubbles and balloons as George and Charlotte stole the show at a Government House children's party in Canada. It was one the most eagerly anticipated engagements of the tour and it certainly didn't disappoint. 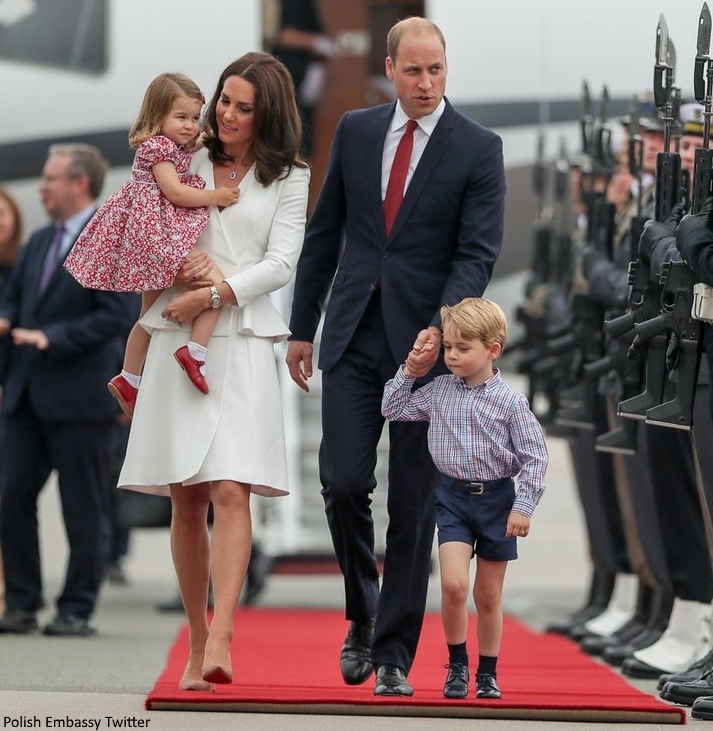 The Cambridges' royal tour of Canada began in style when the family arrived in Victoria on a Canadian Air Force plane. 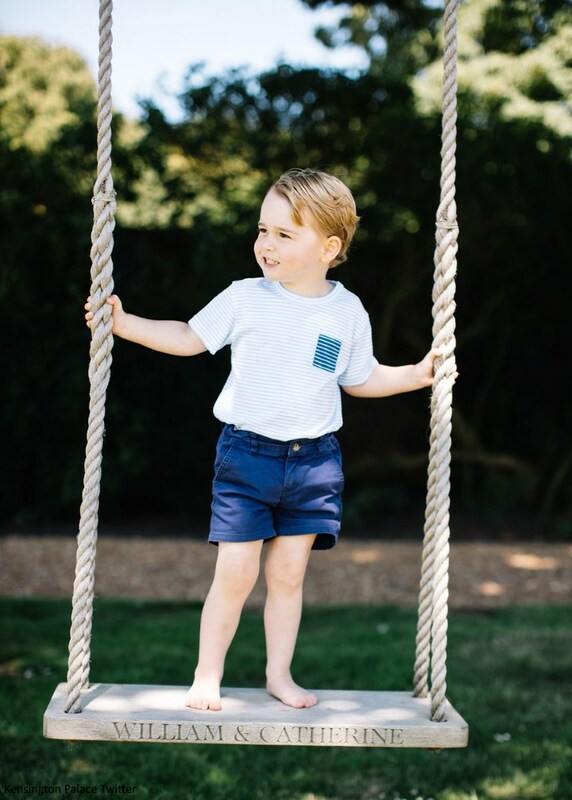 Our favourite little prince celebrated his third birthday today and to mark the special occasion Kensington Palace released four new photos. The Duke and Duchess of Cambridge visited the Royal International Air Tattoo at RAF Airford, Gloucestershire, with a very special guest! 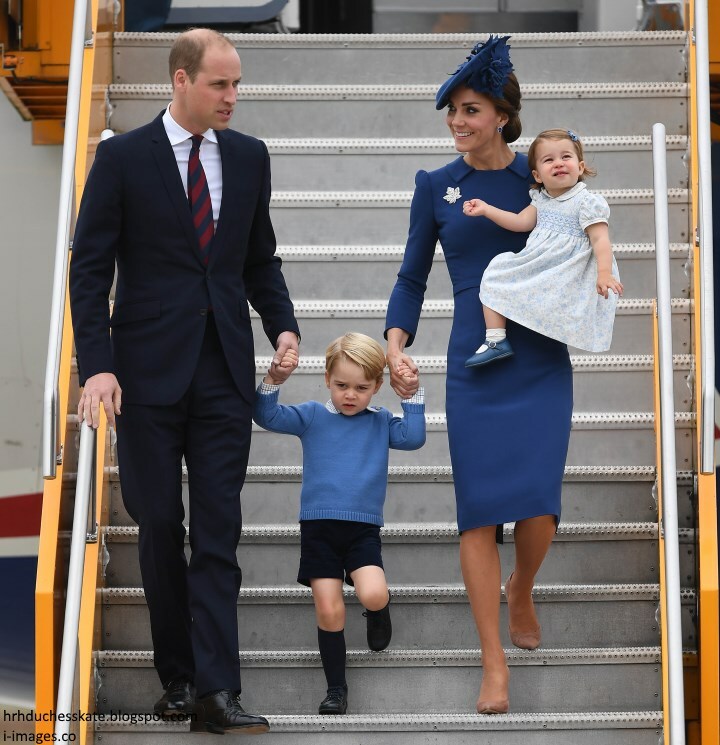 A spokesman for Kensington Palace said: "The Air Tatoo is a fantastic family-orientated event and the Duke and Duchess know that George will enjoy seeing the aircraft up close." 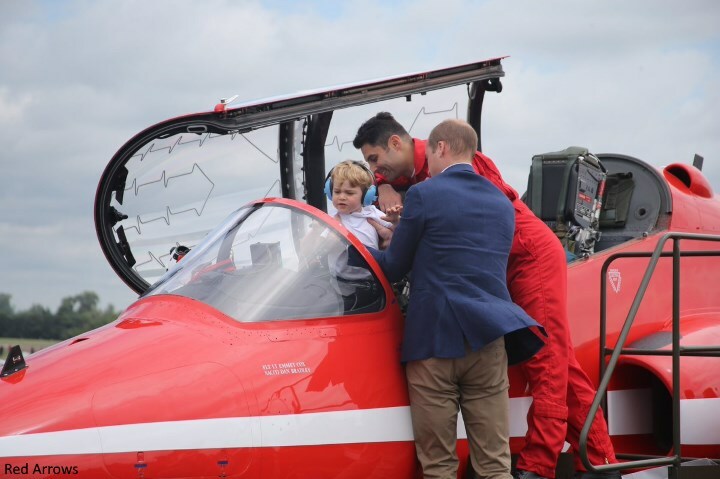 George had a wonderful time exploring the planes and taking a look inside. 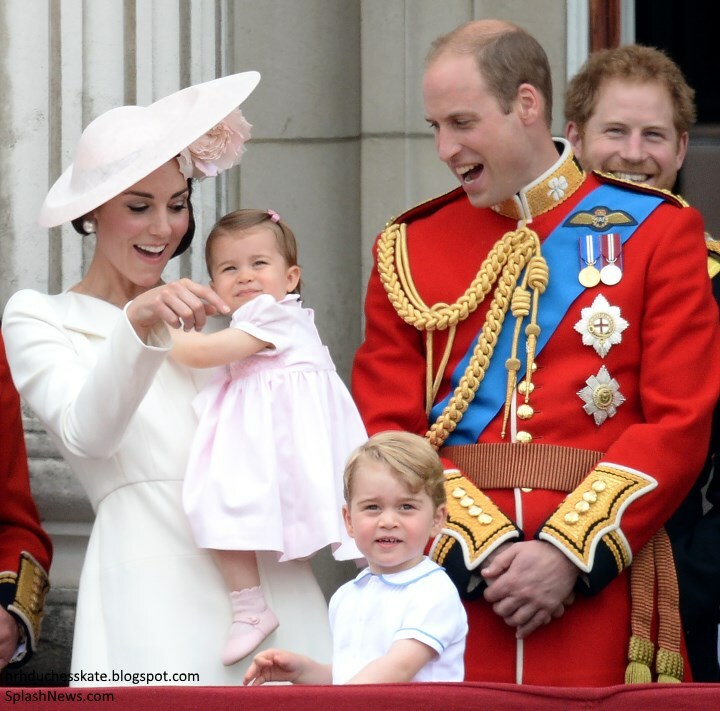 The Cambridge foursome made the first of many appearances together at Trooping The Colour, as Princess Charlotte made her debut. 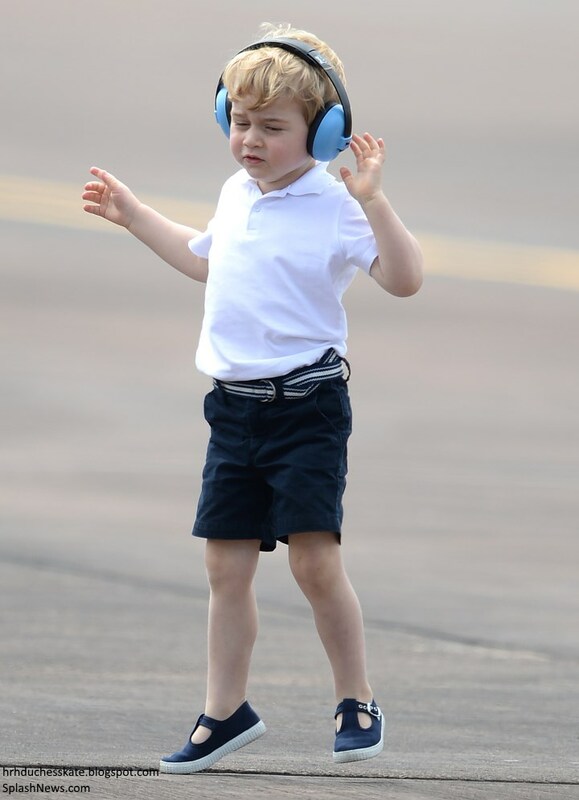 George, wearing the same outfit William wore to Harry's christening in 1984, enjoyed the flypast. 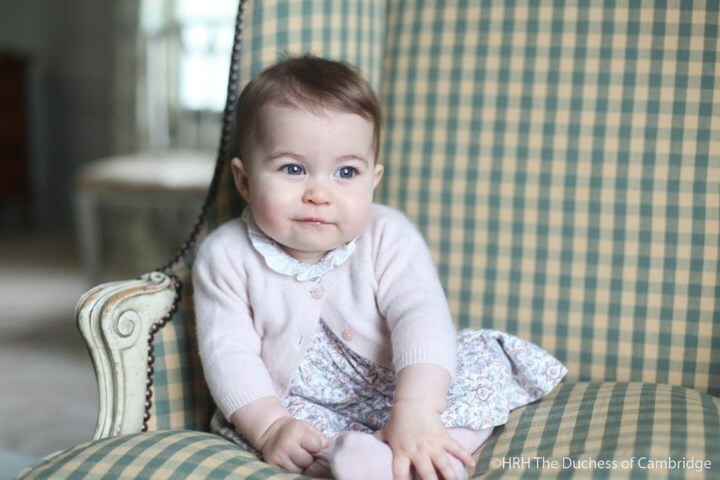 Four darling portraits were released to mark Princess Charlotte's first birthday. 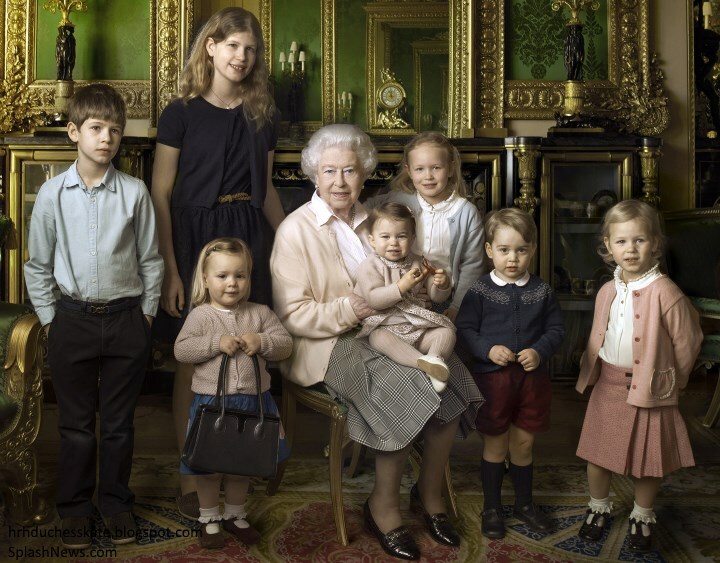 As her Majesty's 90th celebrations continued, a photo, taken on Easter Sunday at Windsor Castle by Annie Leibowitz, depicted the monarch with her five great-grandchildren and two youngest grandchildren. 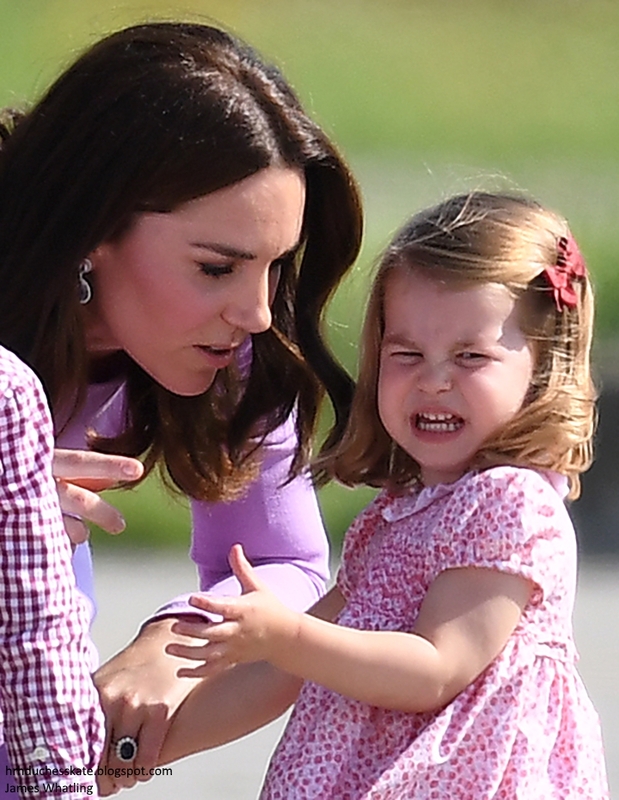 The children's parents were all there on the day, and Kate reportedly took photos of her own. 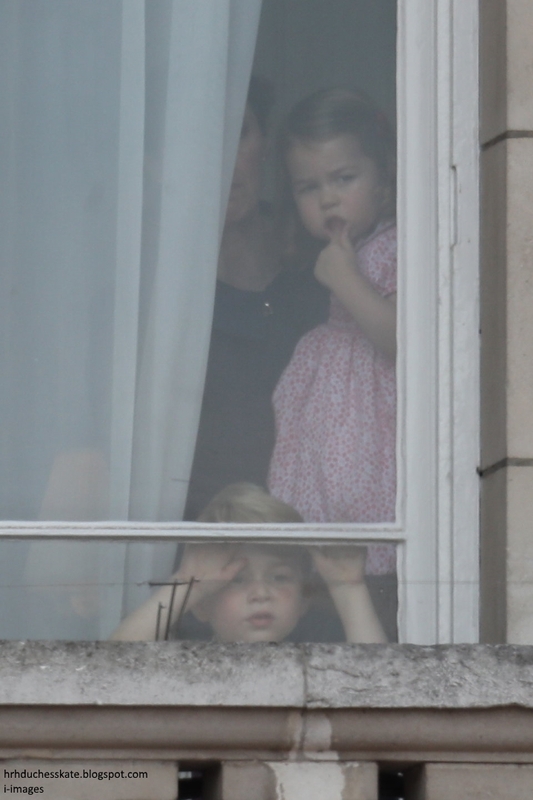 A closer look at George and Charlotte. 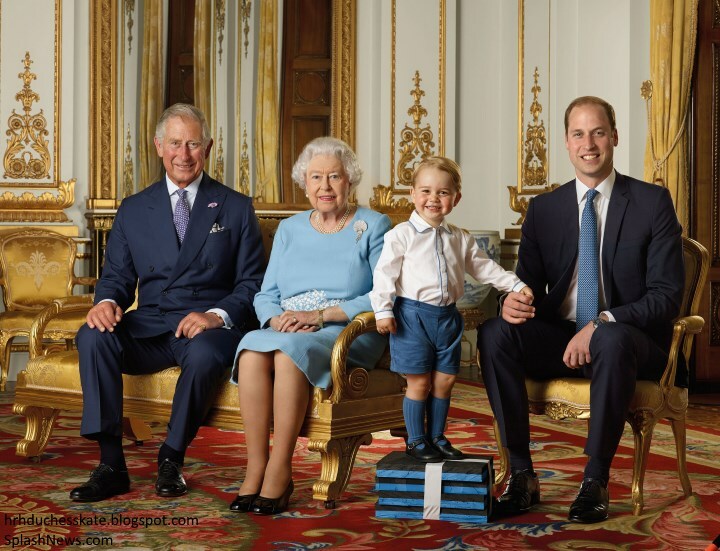 Prince Charles, Prince William, and the ever-adorable Prince George posed for a photo with The Queen for a new set of stamps by the Royal Mail to mark Her Majesty's 90th birthday on Thursday. The foursome are impeccably matched in shades of blue for the image taken in the White Drawing Room at Buckingham Palace. George beamed as he held his father's hand and stood on building blocks. The Duke and Duchess of Cambridge released a selection of photographs from their first holiday as a family of four. The photos were taken by press association photographer John Stillwell. The adorable photos share a candid look at the family of four as they enjoy their break in the snow. 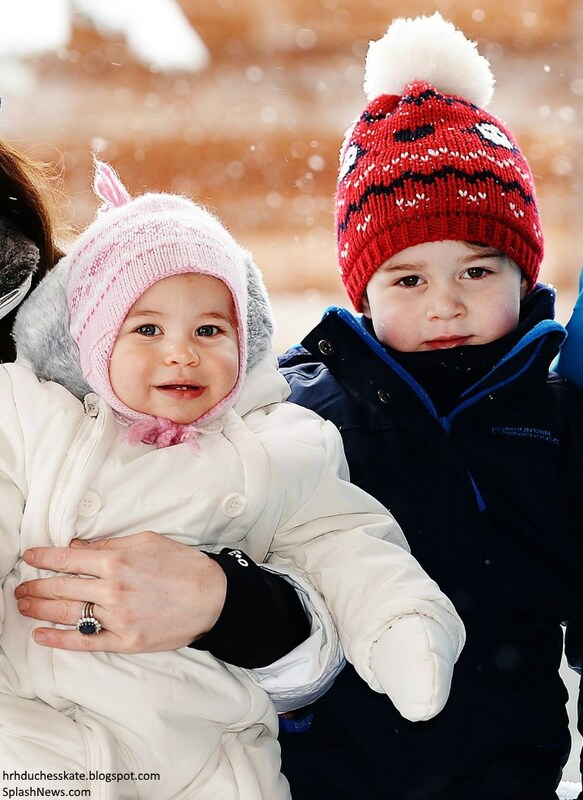 The Palace revealed it was the first time either George or Charlotte had played in the snow. 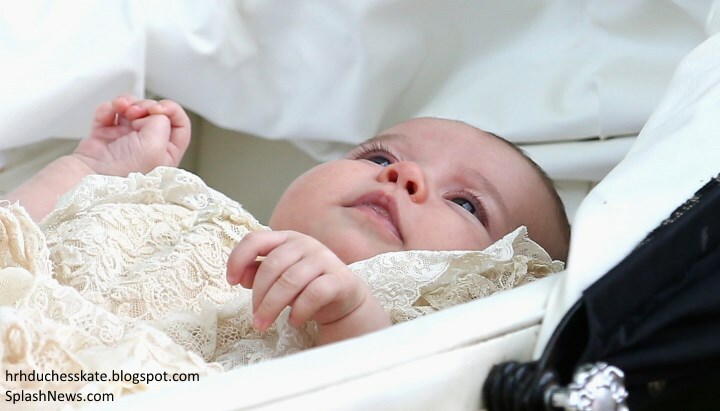 Princess Charlotte was cute as a button in white like her mother. 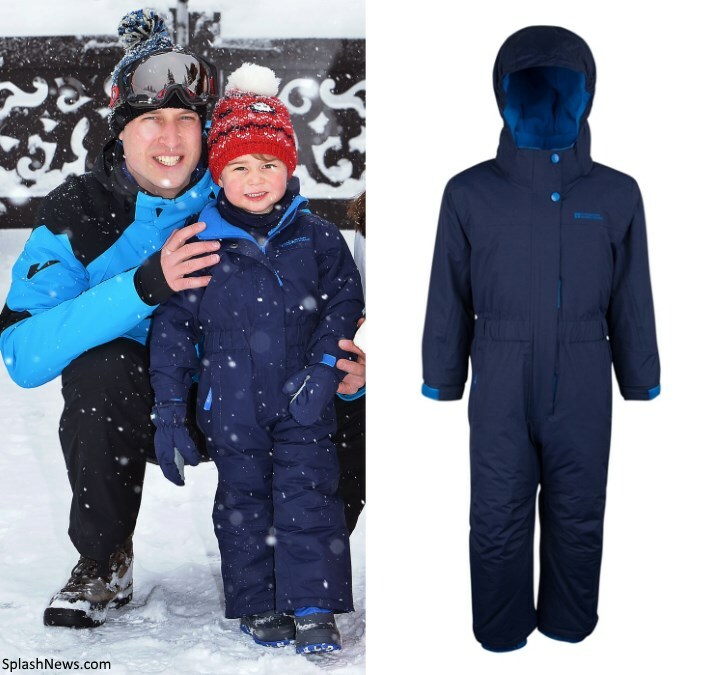 The Princess wore the £28 John Lewis Baby Wadded Snowsuit. It features cute ears on the hood and a cosy faux fur trim. Finished with a button through front for easy on and off. Charlotte wore a pretty pink hat and Emu Australia Platinum Baby Booties. 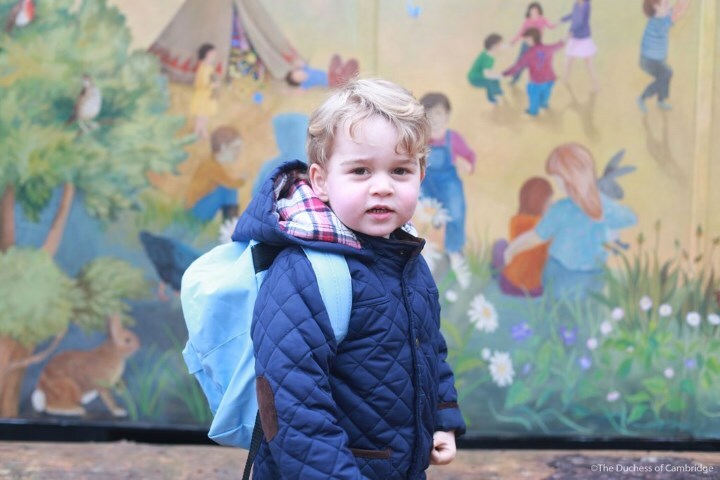 A very important milestone was marked on 6 January when two-year-old George completed his first day at his new Montessori nursery. The Prince was taken to school by both his parents. 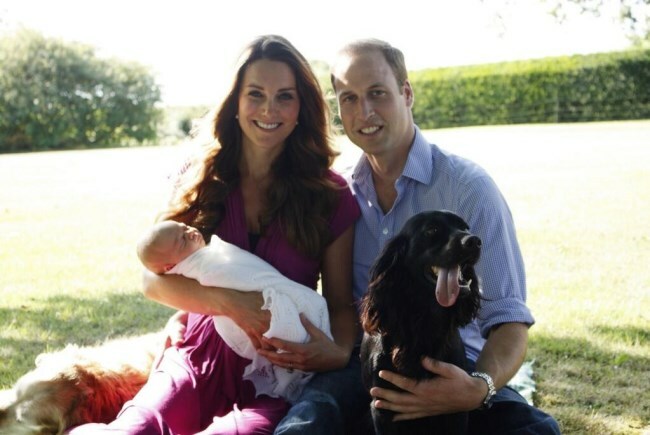 Keen photographer Kate took family snapshots which were released by Kensington Palace via their Twitter feed. The couple's choice of nursery? 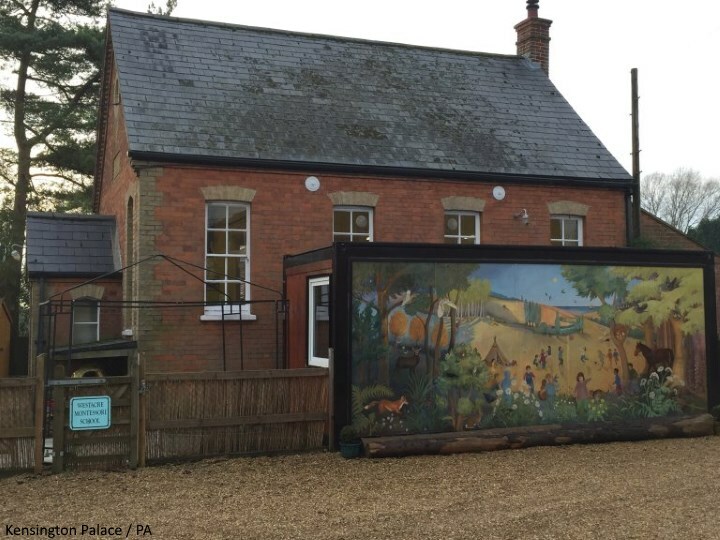 Westacre Montessori School in the village of East Walton, which is housed in an old chapel. It's a twenty-minute drive from their home, Anmer Hall, on the Queen's Sandringham estate. We had an unexpected festive treat when the Cambridges released a family photo to mark Christmas. 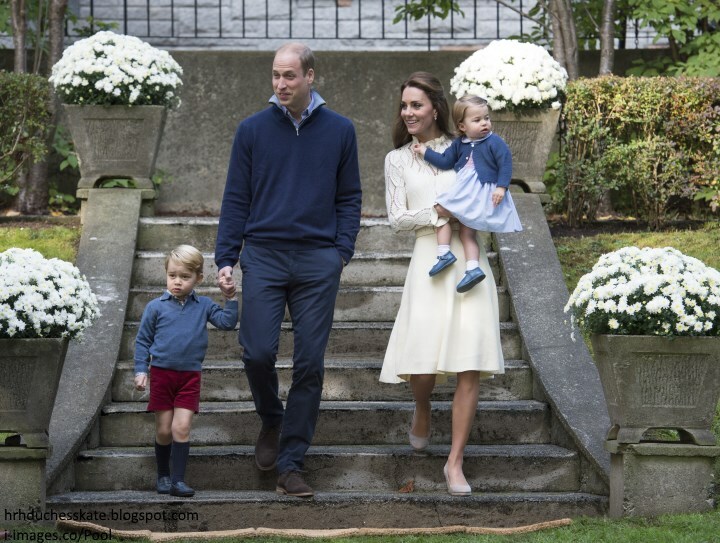 The photo showing the Duke and Duchess with their smiling children Prince George and Princess Charlotte was taken among the autumn leaves at Kensington Palace in late October. The Palace said the photograph was commissioned for their own use, but that the couple decided to make it public because they liked it so much. It was taken by Wiltshire-based photographer Chris Jelf. 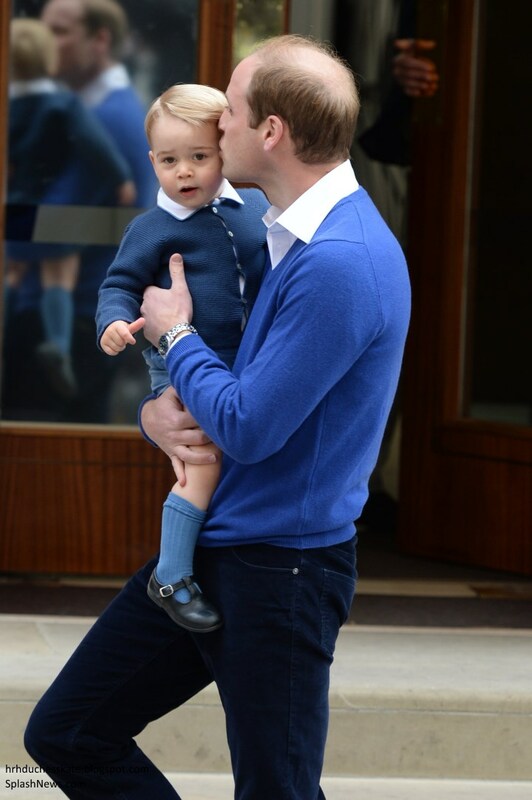 George looked festive in a blue jumper with fretwork by Spanish-based brand Fina Ejerique. The jacquard sweater is 70% acrylic and 30% wool. George also wore his Start-Rite Jo shoes, Amaia Kids socks and blue shorts. 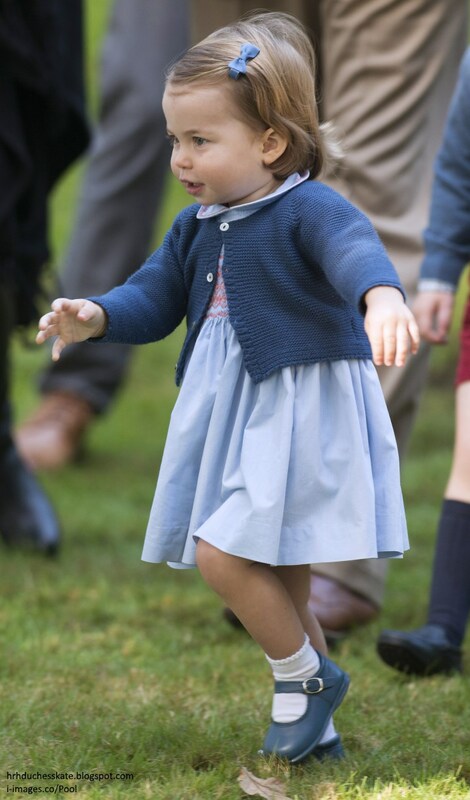 Charlotte wore the same dress and cardigan from the official portraits released in December. 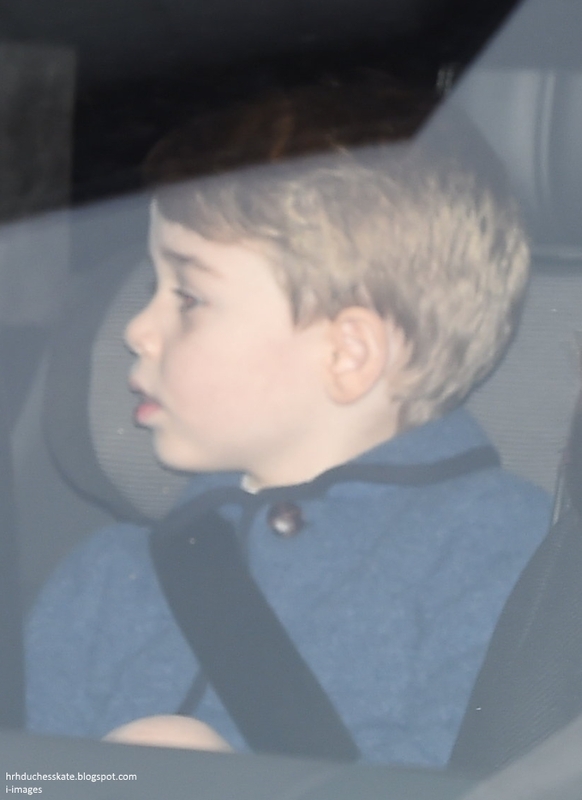 Prince George accompanied Kate and Harry as they made their way to the Queen's pre-Christmas luncheon. 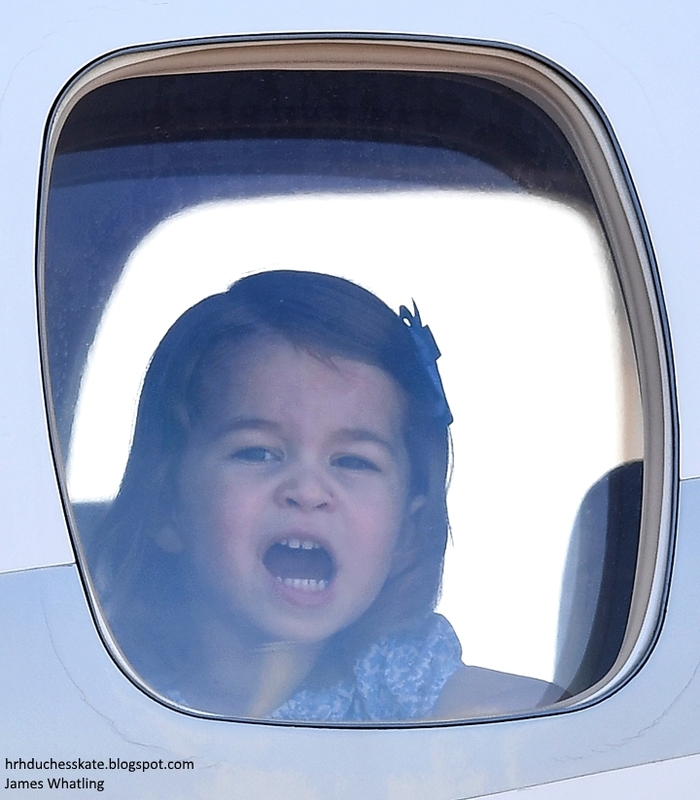 It is thought Princess Charlotte was also there. 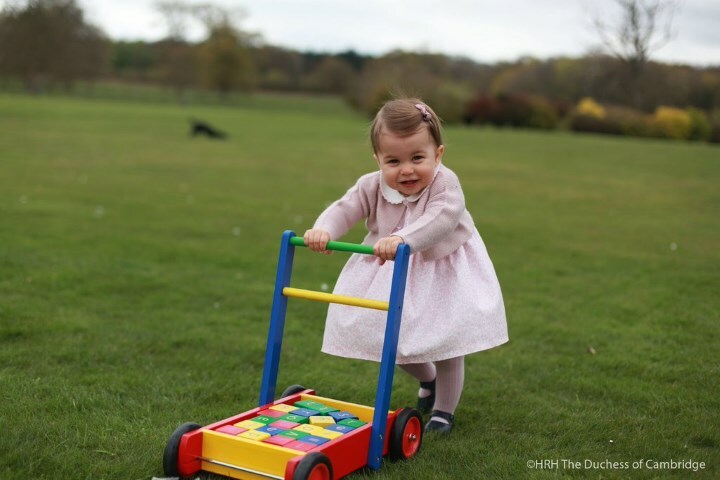 November brought our first proper look at the adorably cute Princess Charlotte. 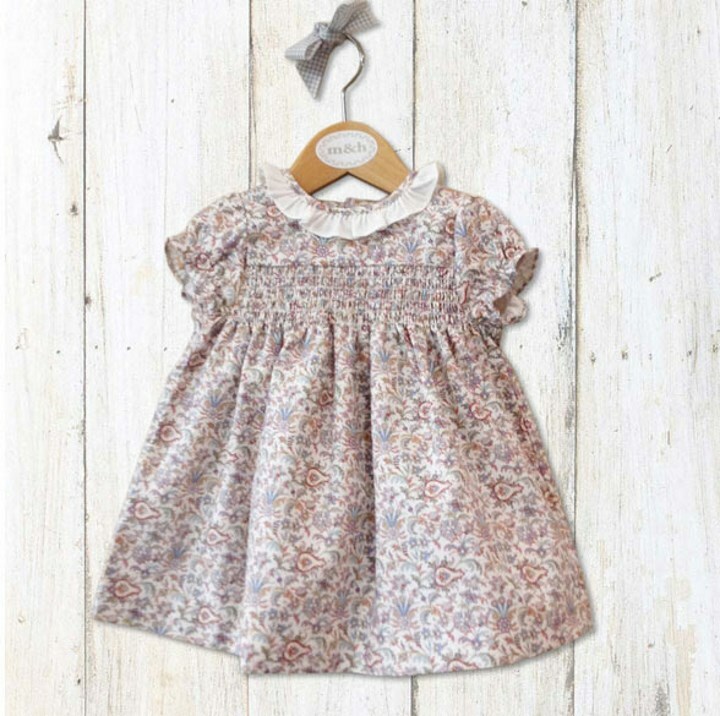 Charlotte's very pretty liberty print dress is by Spanish brand M & H. It originally retailed for £21. It is thought the piece was a gift from Nanny Maria Teresa. 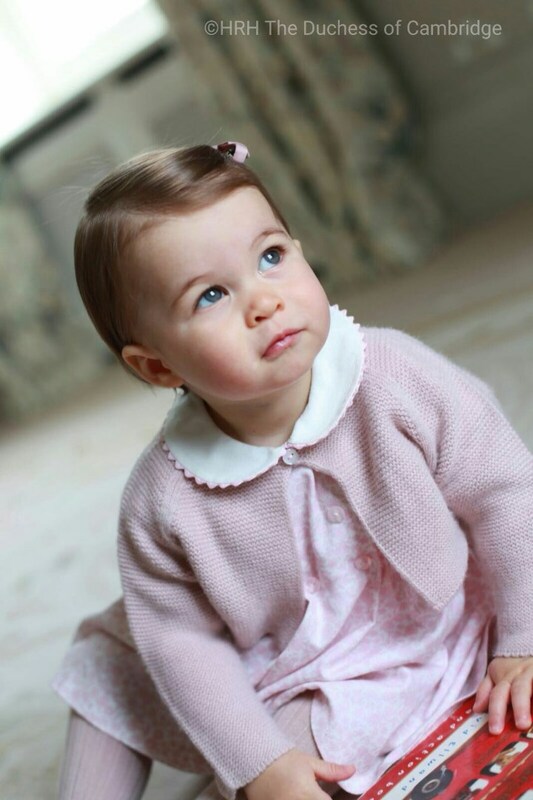 Charlotte also wore a soft pink cardigan, pink tights by Amaia Kids and carried a JellyCat Fuddlewuddle Puppy. 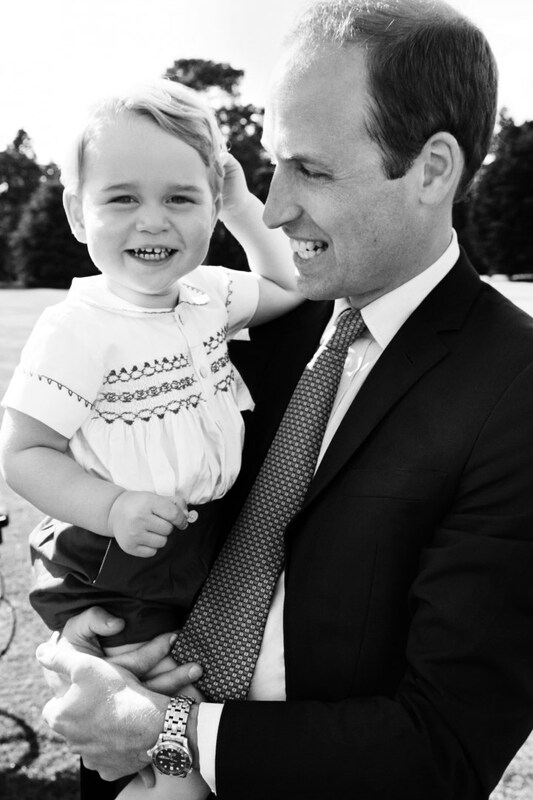 To mark Prince George's second birthday Kensington Palace released a new photo via their Twitter feed. The photo was taken at Princess Charlotte's christening earlier this month, and shows the prince in his father's arms, smiling and leaning towards the camera. 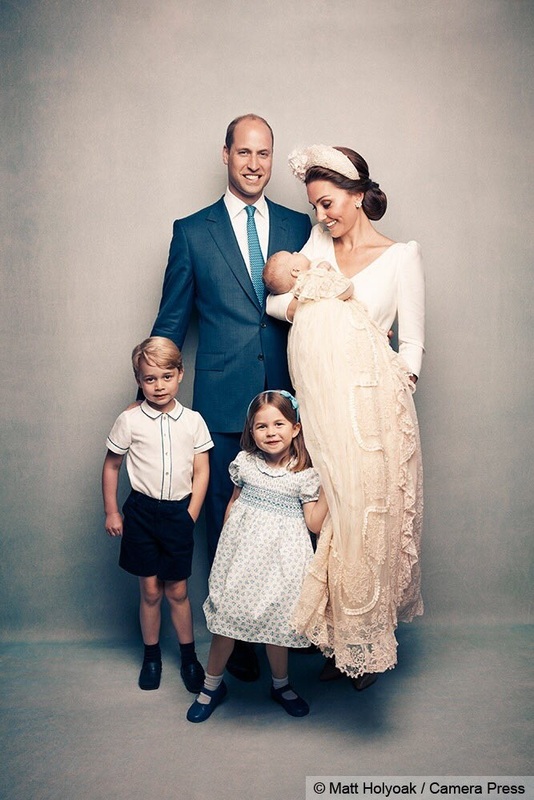 Four memorable portraits were released following Princess Charlotte's christening. 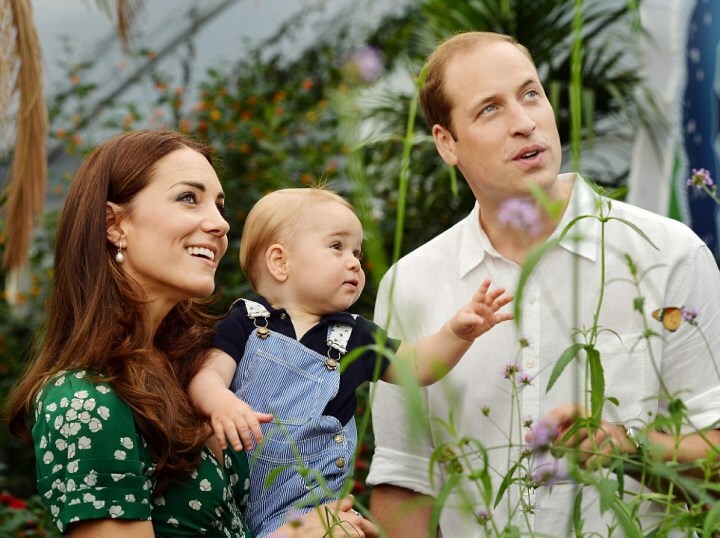 A darling shot of William and George in the garden. Princess Charlotte Elizabeth Diana of Cambridge was baptised at St Mary Magdalene Church on the Sandringham estate in Norfolk on 5 July. 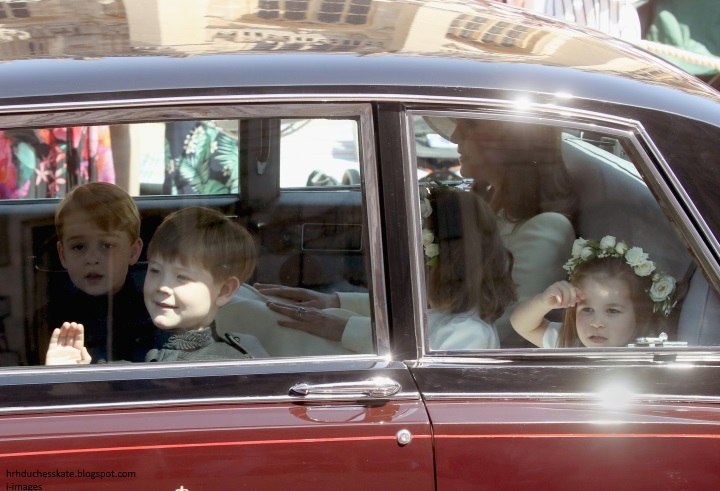 It was the first time we have seen the Cambridges together publicly as a family of four - and what a joyous day for it! 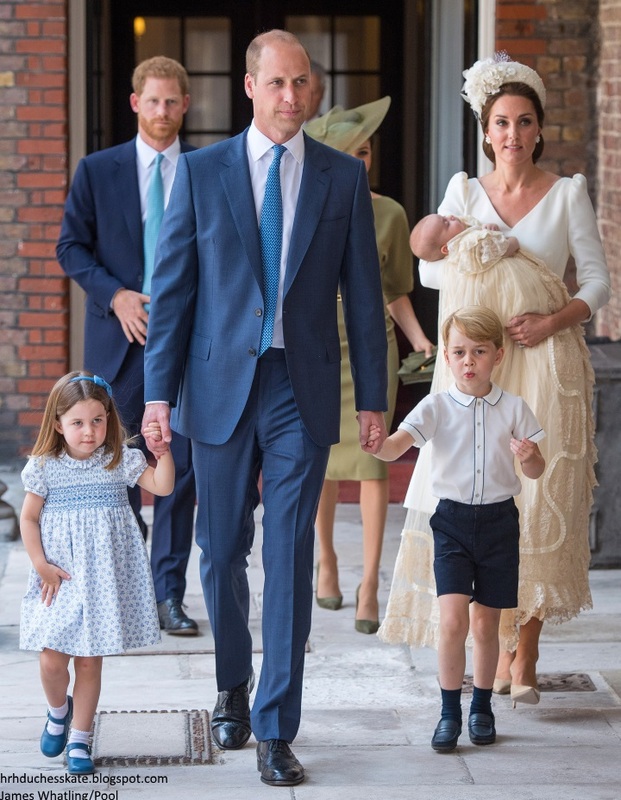 The family made the quarter-mile walk from Sandringham House to the church. Interestingly the large traditional silver-wheeled Millson pram Charlotte travelled in has a family history of its own - it was once used for the Duke of York and the Earl of Wessex. Sophie Carter - A friend of Kate's for years. Sophie isn't someone we've seen photographed much over the years, but she has been described as a "discreet and loyal" friend. Interestingly, Ms Carter and fellow godparent Thomas van Straubenzee used to be an item. 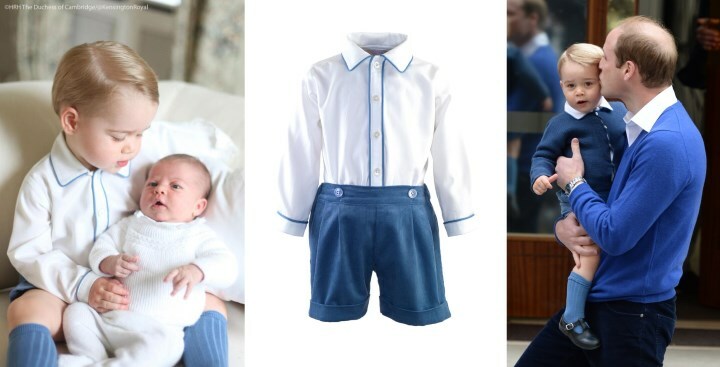 Prince George's smocked set by Rachel Riley was incredibly similar to the outfit William wore to meet Harry for the first time in 1984. 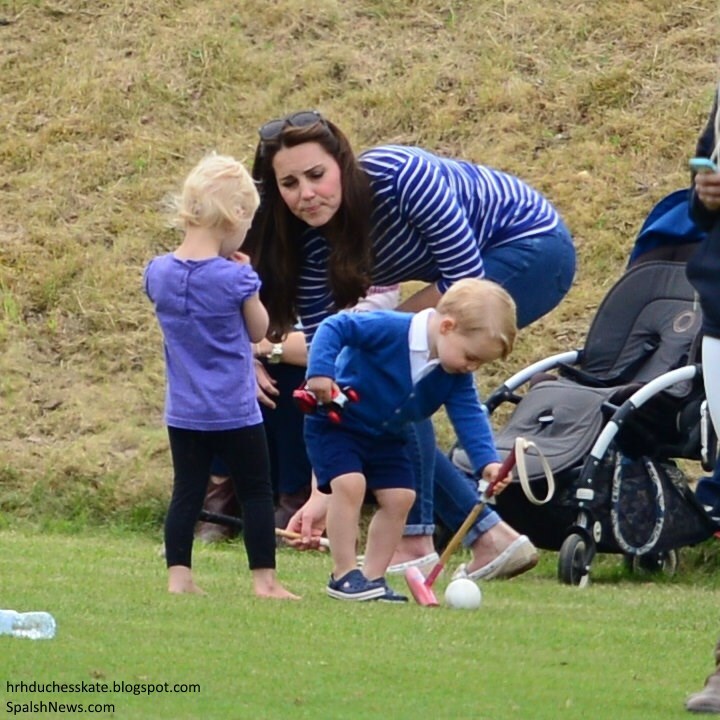 Prince George enjoyed a day out with Kate as they watched Prince William play polo. 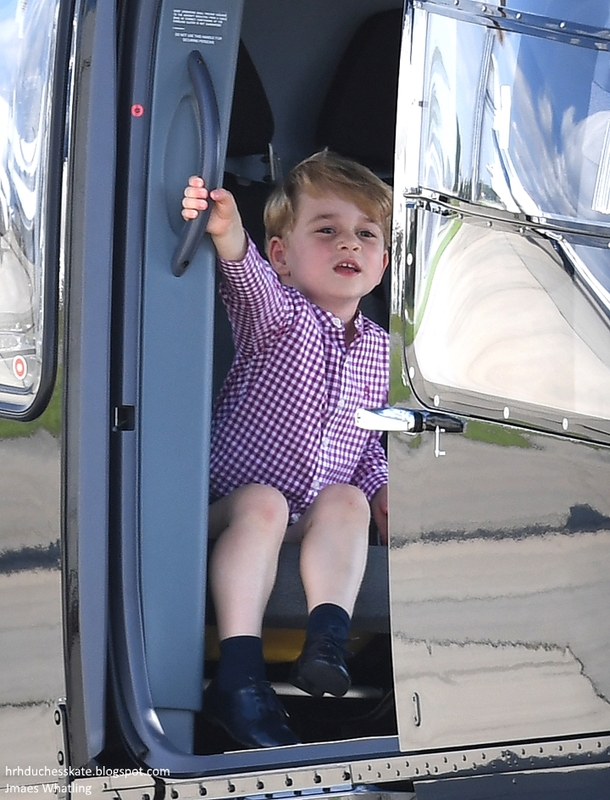 What did Prince George wear today? 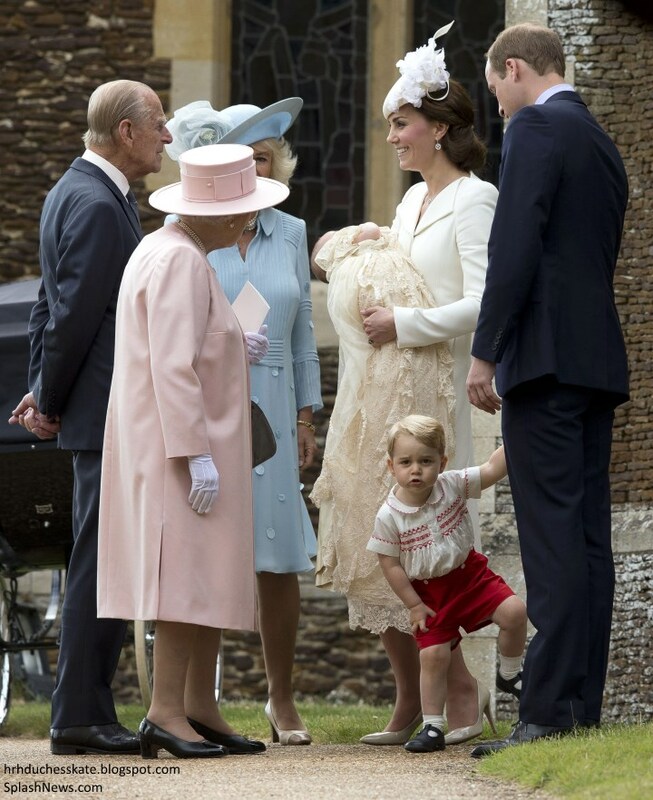 The talented ladies at Prince George Pieces quickly identified his outfit. 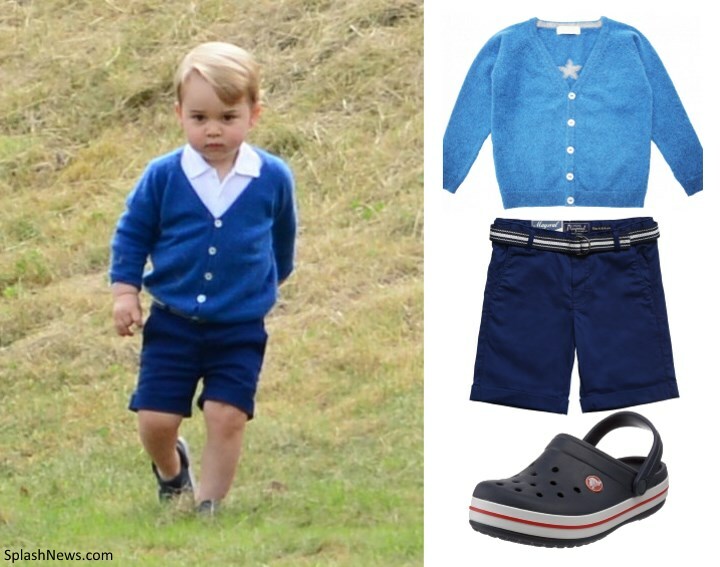 George looked as cute as ever in the Oliver Baby and Kids Cashmere Cardigan, the £26 Mayoral Navy Blue Shorts, and a pair of adorable Crocs. A very special little boy was spotted at Buckingham Palace on the morning of Trooping the Colour. 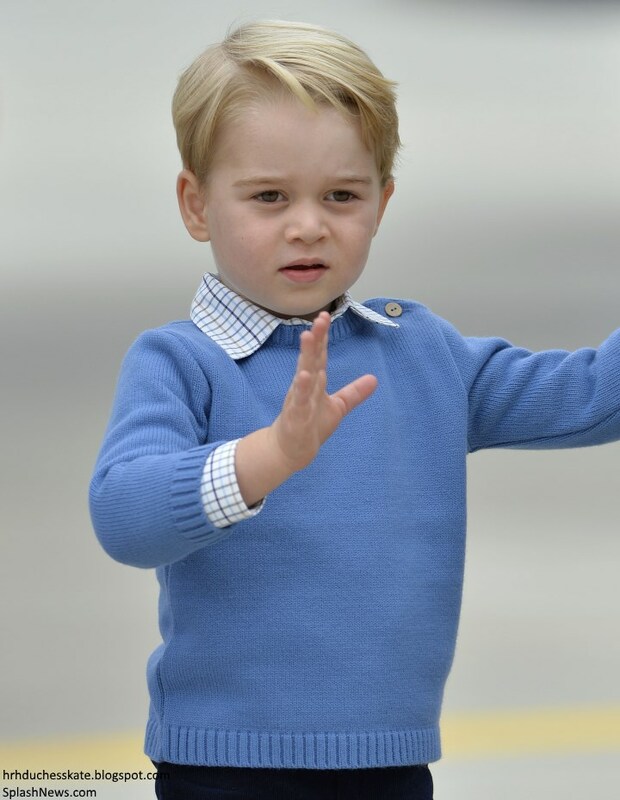 For George's first Trooping appearance, he wore the same blue outfit with cream lace worn by Prince William for his first Trooping appearance in 1984. The Duke and Duchess of Cambridge released four photographs of Prince George and Princess Charlotte. 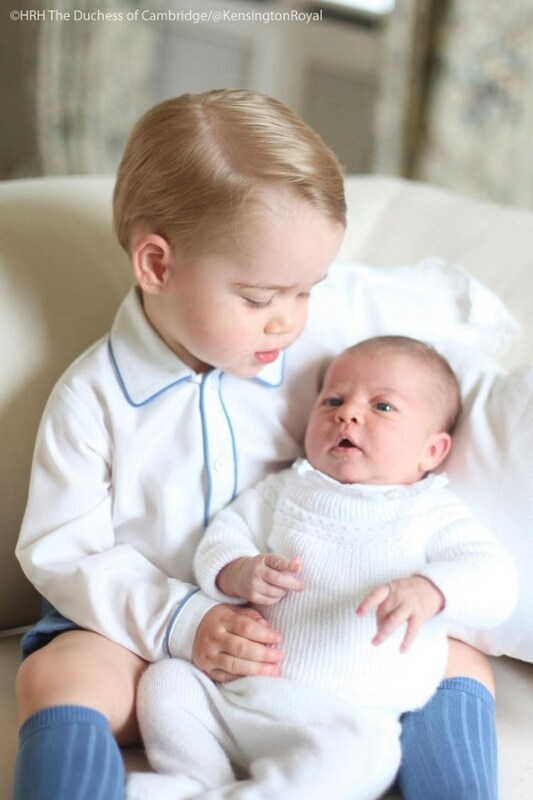 An adorable shot of big brother George with his little sister. The Duchess took the photos of her children in mid-May at Anmer Hall, when Charlotte would have been around two weeks old. Kate used a Canon EOS 5D Mark II camera. 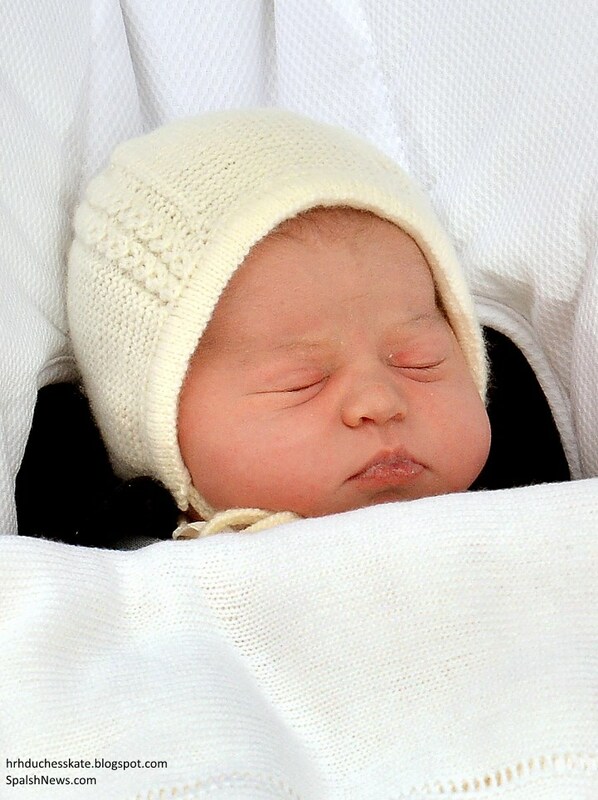 On 2 May 2015 Princess Charlotte Elizabeth Diana of Cambridge was born. The Duchess was admitted to St Mary's Hospital in the early stages of labour at 6 am. 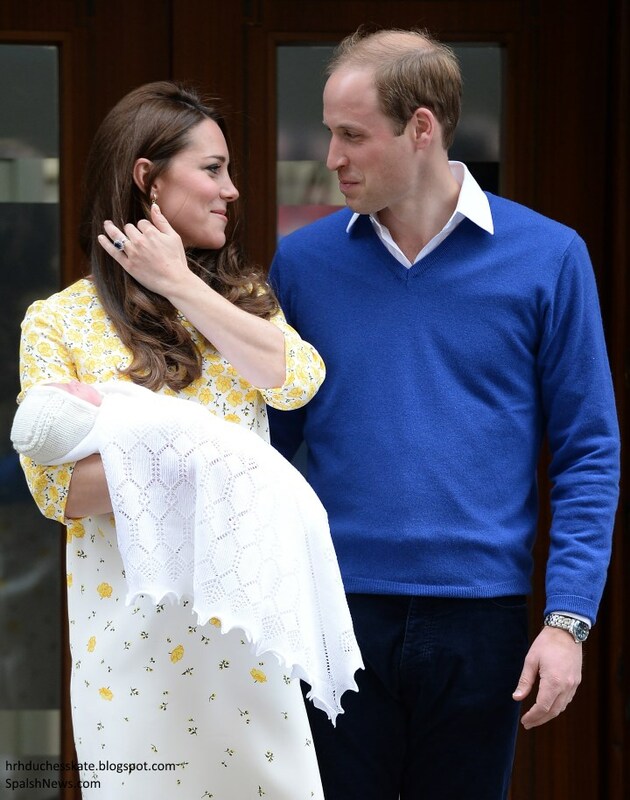 With Prince William by her side she was safely delivered of a baby girl weighing 8 lbs 3 oz at 8.34 am. Prince George arrived to meet his baby sister. The photos were taken on the steps of Kensington Palace by Prince Harry's private secretary Ed Lane Fox who used to work as a freelance photographer. 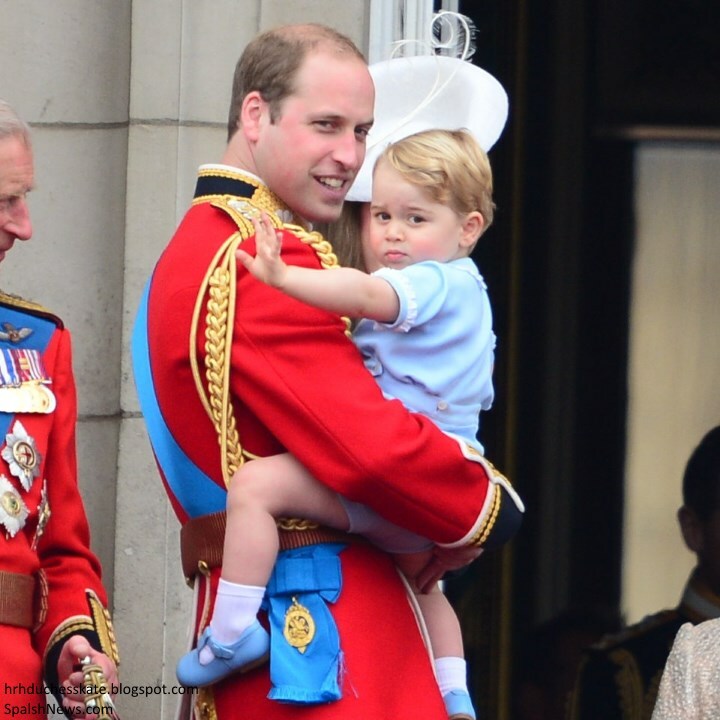 George has certainly grown since the last time we saw him and looks very much like his grandfather Mike Middleton. Another look at the smiling Prince. 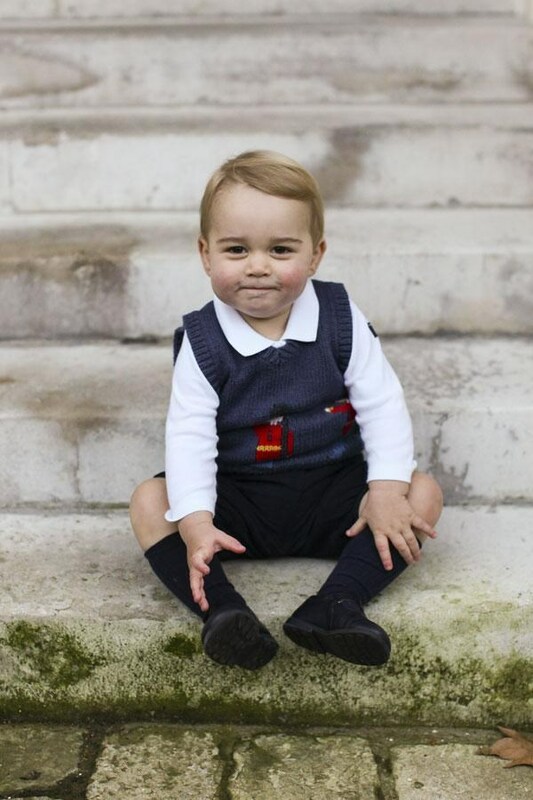 George looked incredibly cute in the Cath Kidston Guards vest and Polarn O. Pyret organic cotton bodysuit. 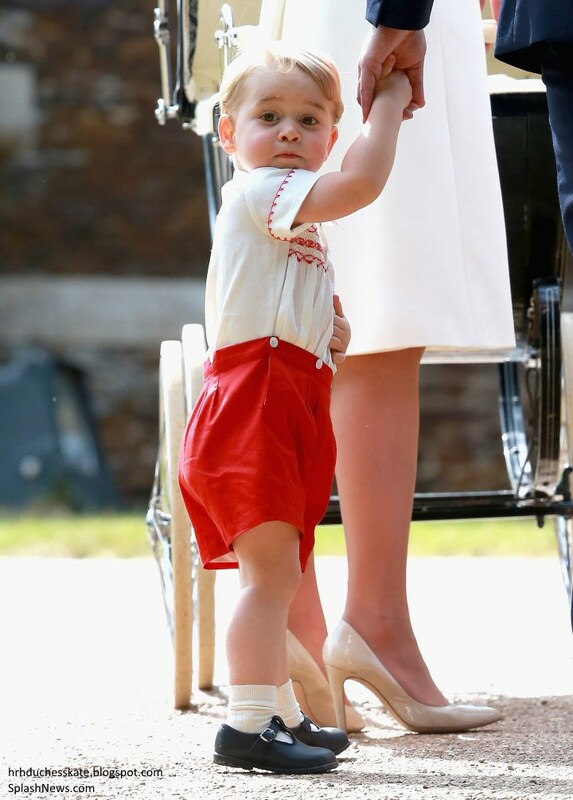 The Prince has grown out of his pre-walkers and is now sporting the Jo by Start Rite Shoes. Prince George's first birthday portraits were taken at the Natural History Museum's 'Sensational Butterflies' exhibition. The venue was chosen because his mother is patron of the museum. They were taken by Press Association photographer John Stillwell, who also took official photographs of Prince Harry in Afghanistan. Speaking about George, Mr Stillwell described him as "very lively and very sure of himself and confident - a very determined young boy. I'd have to say he looks like his dad". A beautiful shot of the family. 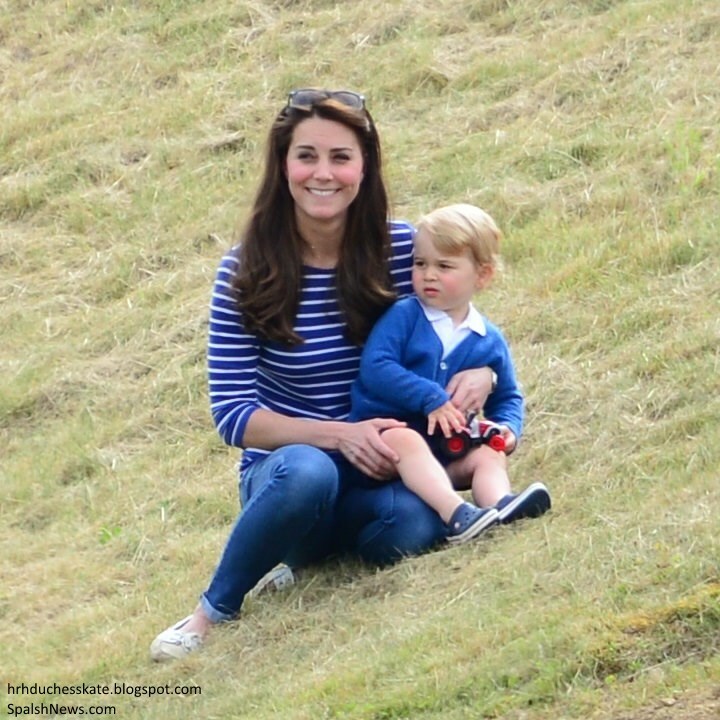 George looked very cute in a navy polo shirt and blue and white stripe overalls by Petit Bateau with reverse straps (with thanks to Prince George Pieces). 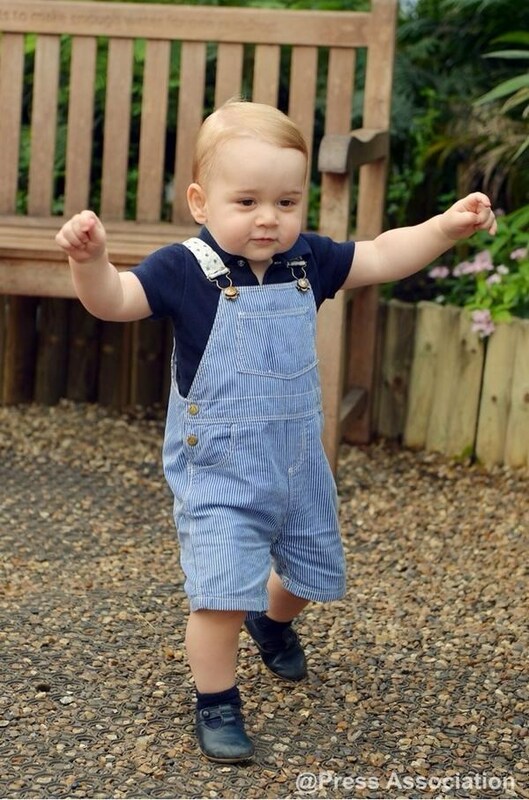 It appears George wore the brand's Short-Sleeved Cotton Bodysuit underneath his overalls. The little Prince also wore his Early Days 'Alex' Pre-Walker Shoes. 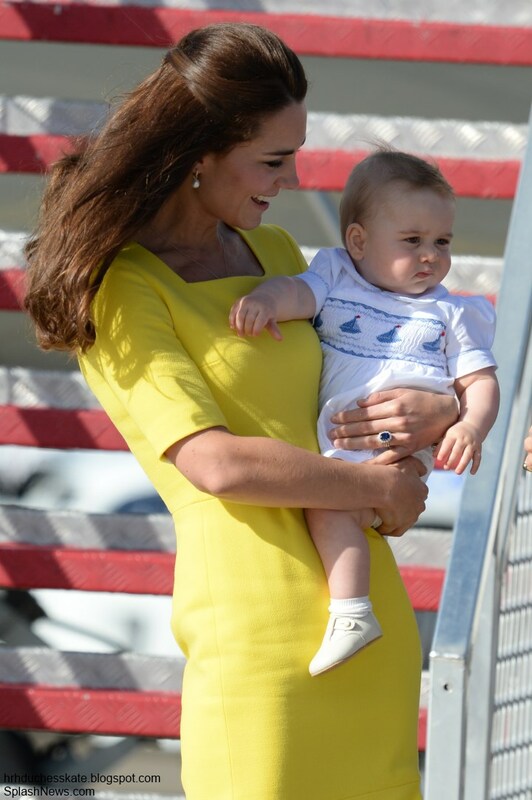 George attended his first polo match on 15 June, Father's Day. The boisterous ten-month-old joined Kate to support William and Harry at a charity game. The little prince had a wonderful team exploring the grounds and playing with a mallet. George looked adorable in his red stripe Neck and Neck overall, a white shirt and his Early Days pre-walker shoes. 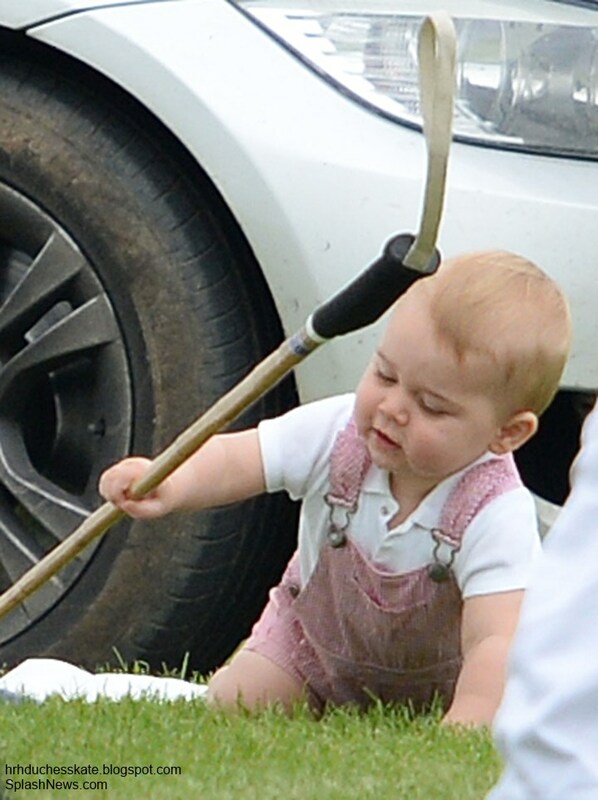 George's overalls are by Neck and Neck (with thanks to What Prince George Wore). The brand has a store at Duke of York Square and it's quite likely Kate purchased it there. It's available for $51. 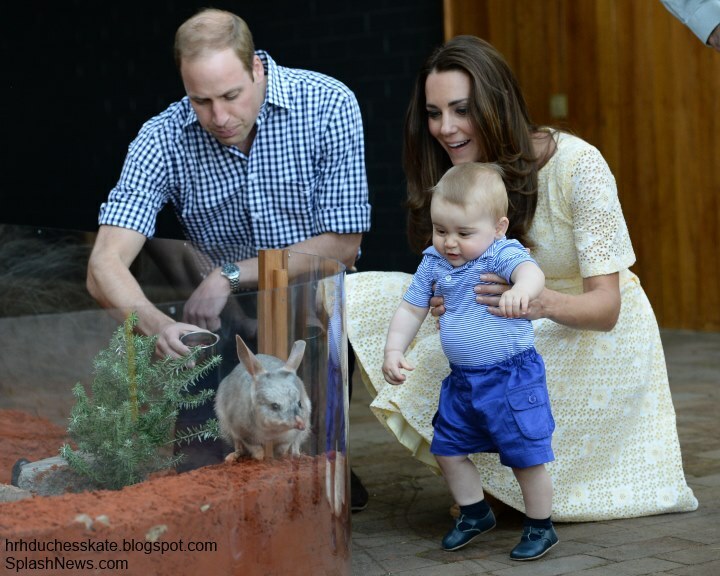 Prince George joined his parents at Taronga Zoo in Sydney to view the bilby enclosure named after him. The little prince was very excited. 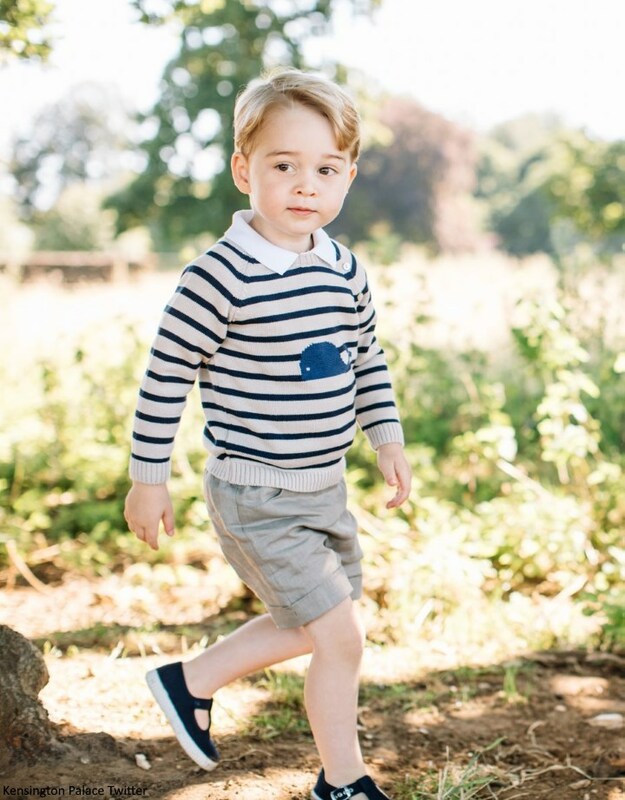 George looked adorable in the Rachel Riley Striped Jersey Polo and the navy Pocket Shorts. They're available for $69 and $89 respectively. The prince also wore his Early Days Alex Shoes (with thanks to HRH George Pieces). It was an incredibly cute look for George. 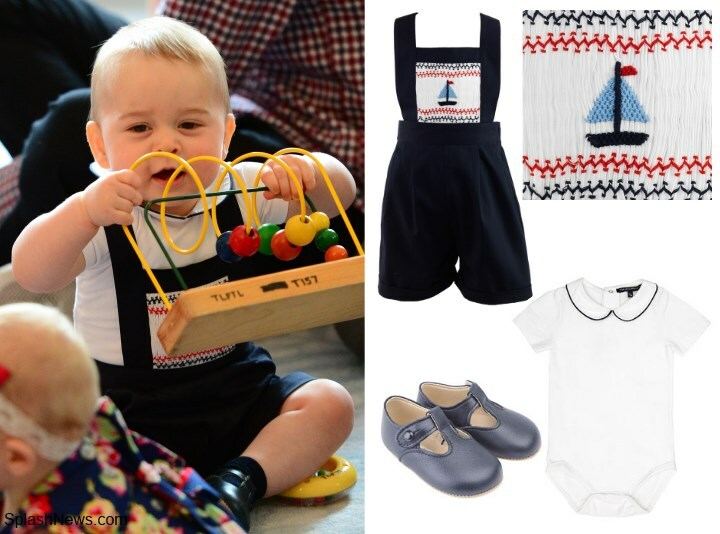 Prince George looked very cute in a white romper with sailing boats by Les Petites Abeilles for the royals arrival in Sydney. The hand smocked and embroidered design retails for £60. 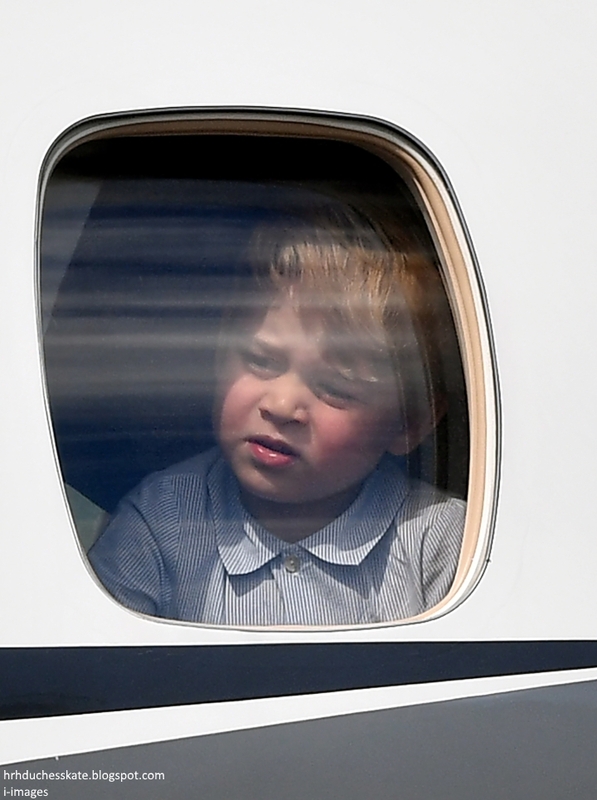 A very sleepy Prince George departed Wellington, New Zealand with his parents on April 16 looking adorable in his Rachel Riley Dungarees, Trotters Onesie, Early Days Pre-Walkers Shoes and an ivory cardigan. 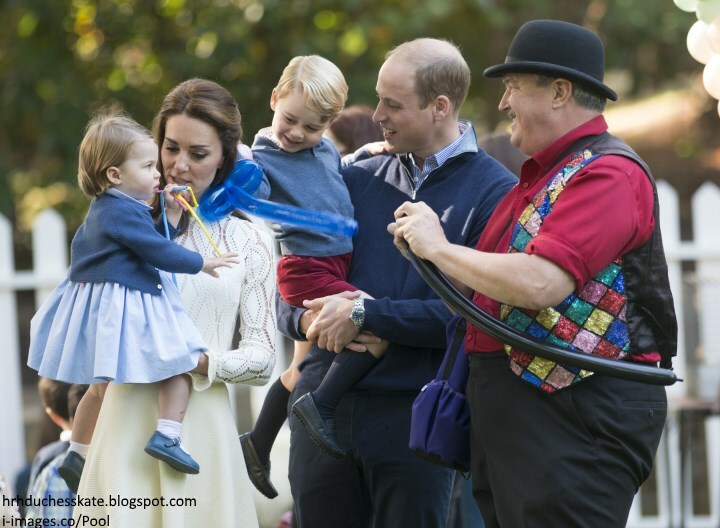 Prince George attended his first official engagement on April 9 2014 - a playdate at Government House for families who avail of the services of Plunket. The event will be something to look back on in years to come - the first of countless engagements George will undertake. 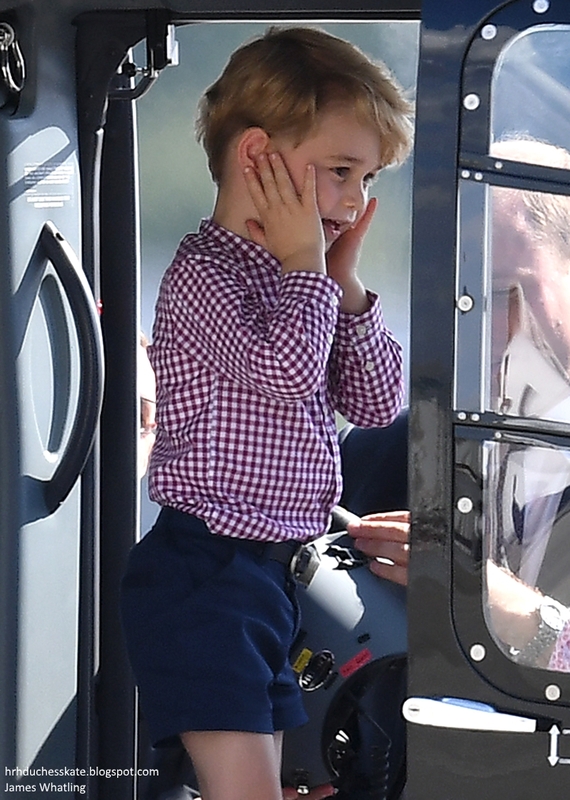 The little prince looked darling in the Rachel Riley Sailboat Smocked Dungarees. 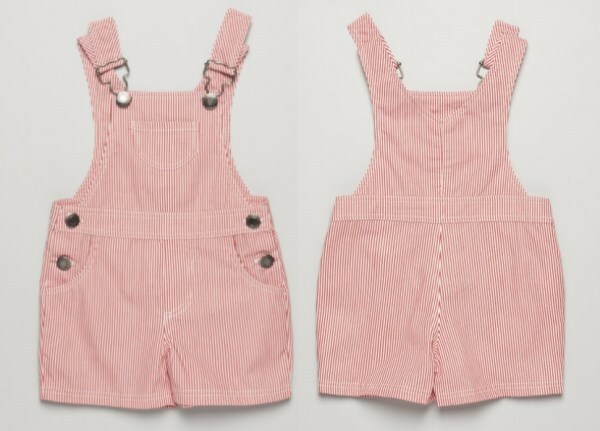 The navy and ivory cotton dungarees retail for $129 and feature an elasticated waist and adjustable straps which cross over at the back (Oh, the cuteness factor!). 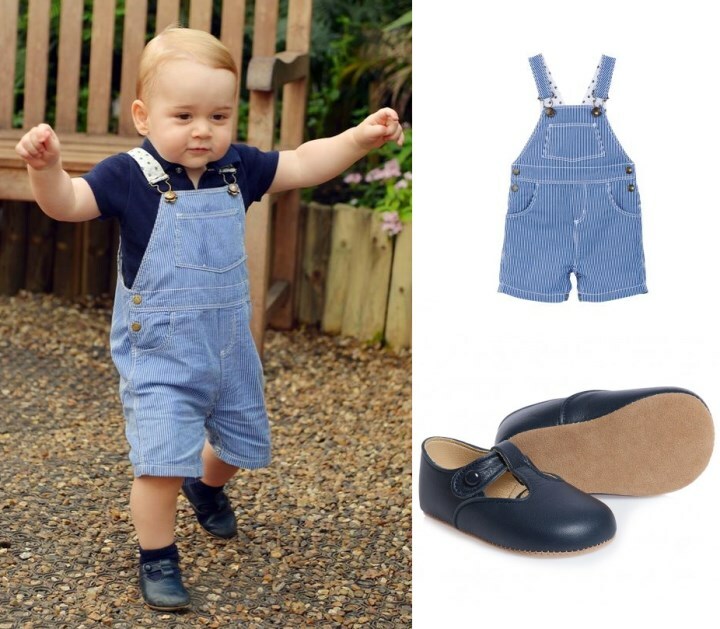 Prince George Pieces shared news George also wore the £15 Trotters Milo Body and a pair of £25.99 Early Days Pre-Walkers. 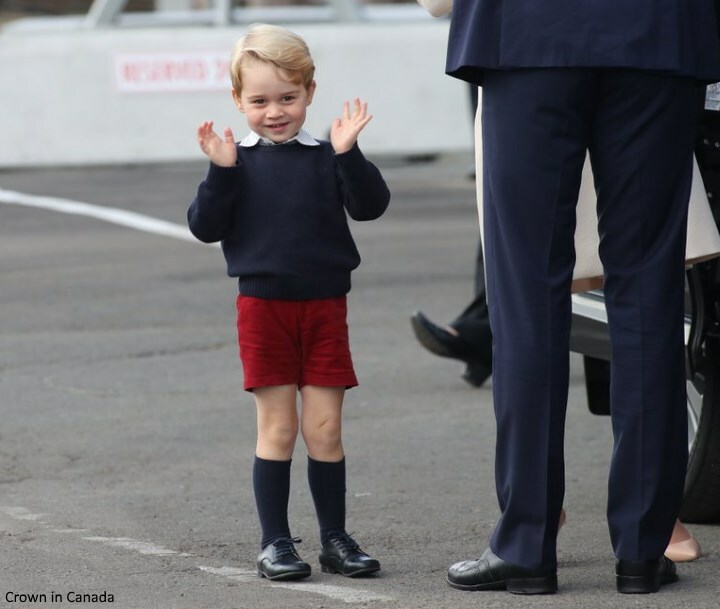 Prince George looked adorable upon arrival at Military Terminal, Wellington, New Zealand for the beginning of the royal tour. The eight-month-old was dressed in a cream jumper and shorts. Those cheeks! 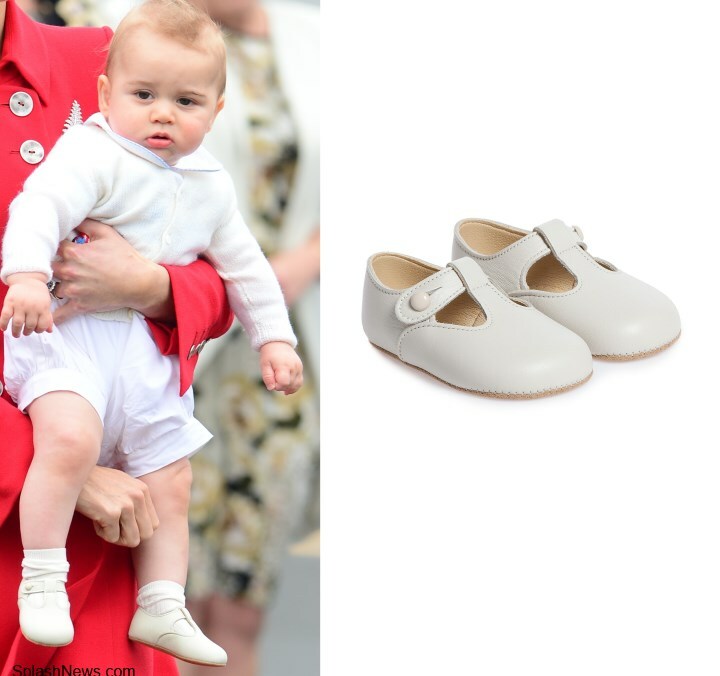 It was confirmed George wore the Early Days Ivory Pre-Walker Shoes. The £27 soft leather shoes feature a flexible sole and a comfortable lightly padded insole. 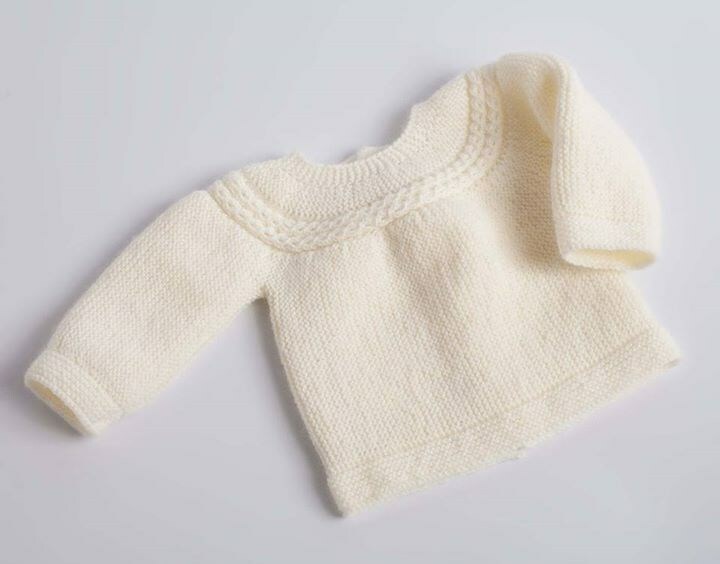 They're available in sizes ranging from 0-18 months. 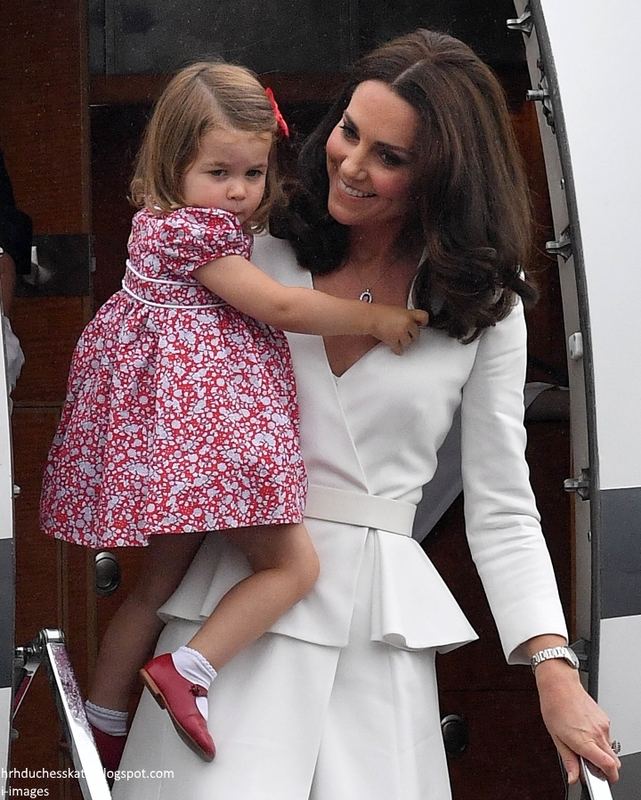 Before making their way to Wellington for the start of the royal tour, the Cambridges touched down at Sydney where we saw little George kicking and waving in his mother's arms. 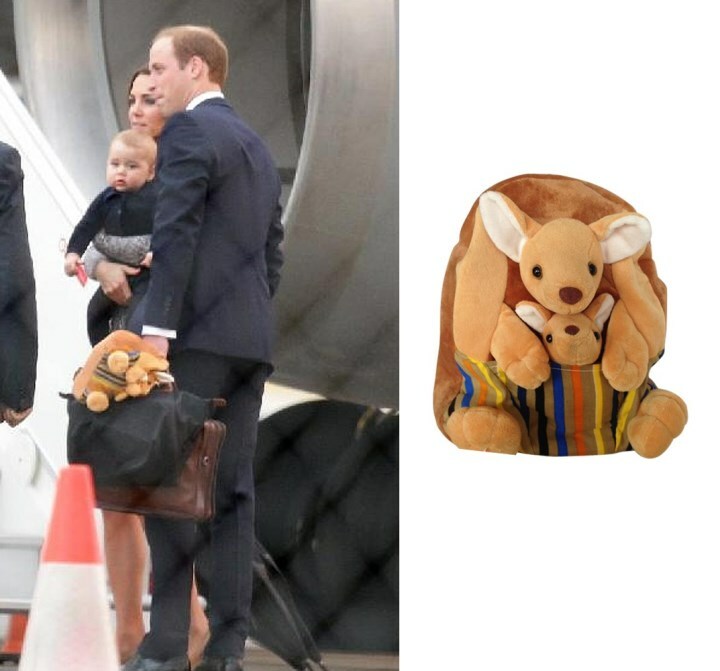 The little Prince wore a navy onesie and Prince William carried a kangaroo backpack for him. It's from the Save The Koalas Shop. The backpack is described as "perfect for 2-5 year olds, soft and cuddly, comes with its own little joey stitched on so he doesn't get lost". It retails for $12.50. Just days before the royal tour of New Zealand and Australia Kate stocked up on a number of casual items for Prince George. Her Royal Highness's purchases included the £14.95 Contrast-Trim Striped Footed One-Piece, the very cute £14.95 lush green Plaid Button-Up Bodysuit and the £6.27 grey and navy Stripe Pants. 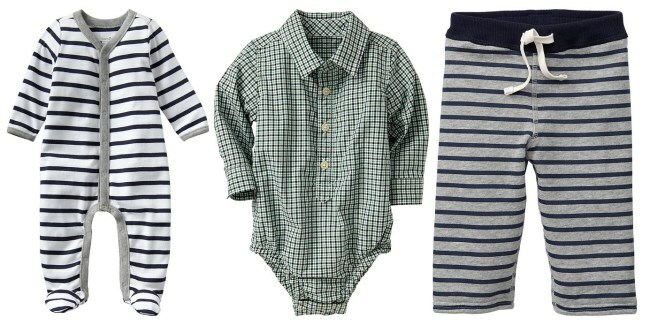 All very practical and wearable pieces for the little prince. To mark Mothering Sunday, March 30 2014, the Palace released a new portrait of The Duke and Duchess of Cambridge, Prince George and Lupo. 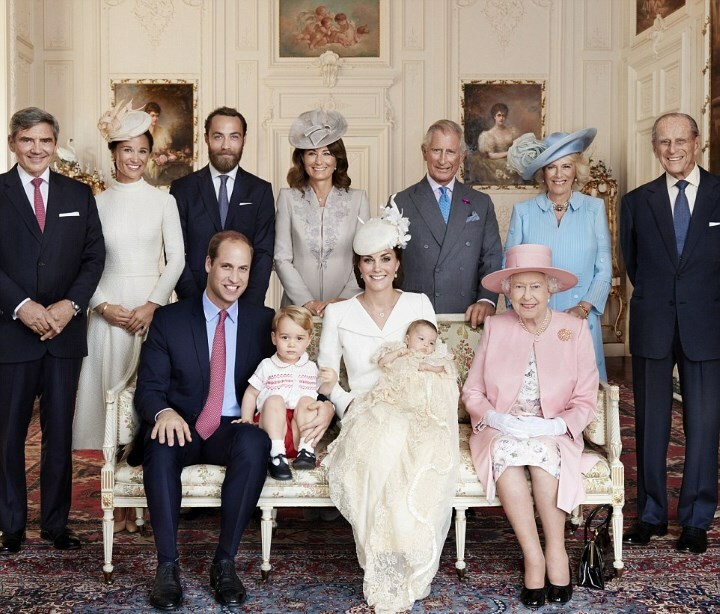 The informal family portrait was taken at a window in the family's home, Apartment 1A, Kensington Palace by award winning photographer Jason Bell. 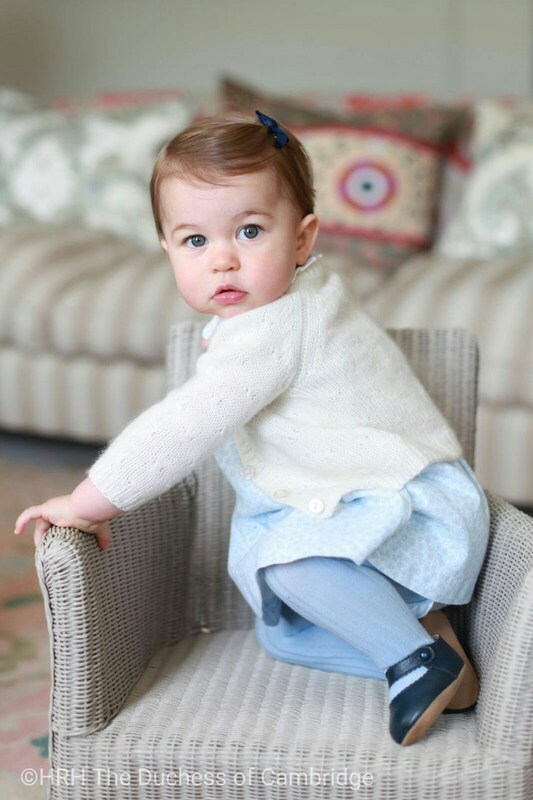 Eight-month-old George looked adorable in a baby blue cashmere jumper with his name embroidered on it. It was created by Royal Warrant holders Corgi Hoisery. The Carmarthenshire-based company gave it as a gift to Prince Charles to celebrate the birth of his first grandson, who then passed it on to William and Kate. 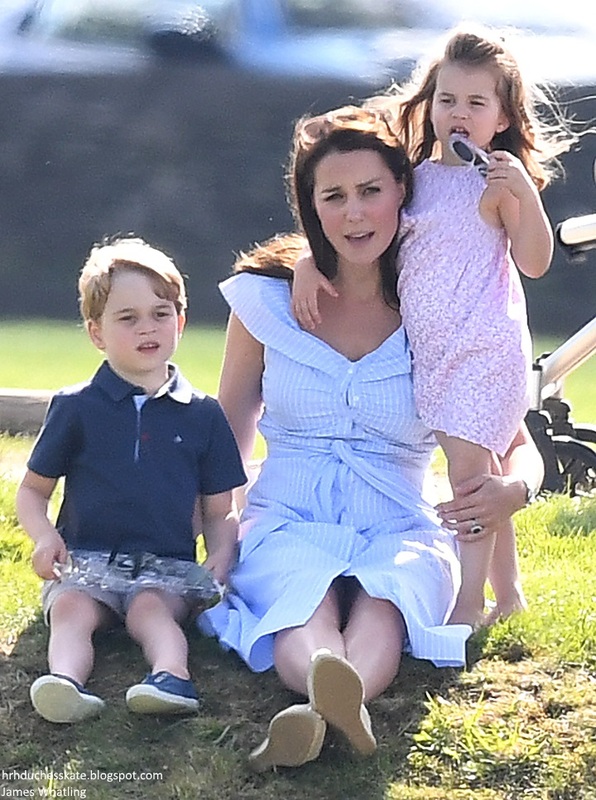 Prince George and Kate joined the Middleton family for their annual holiday in Mustique in February. Kate is regularly spotted with Prince George in Kensington Gardens. 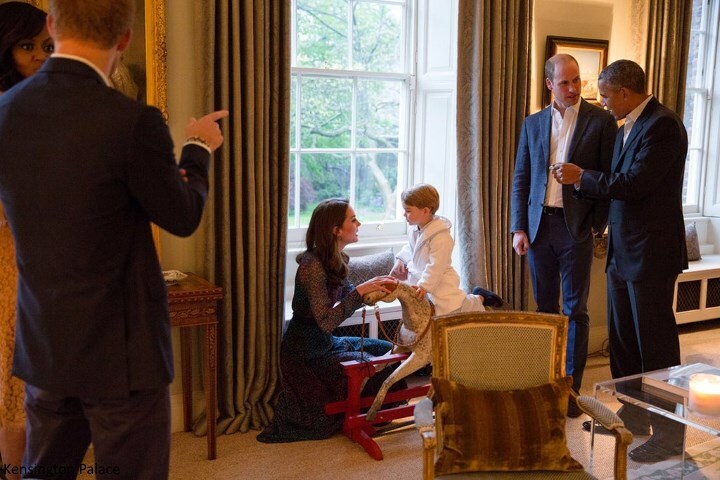 Which stroller does one choose for a prince? A royal favourite of course. George's stroller is by Silver Cross. 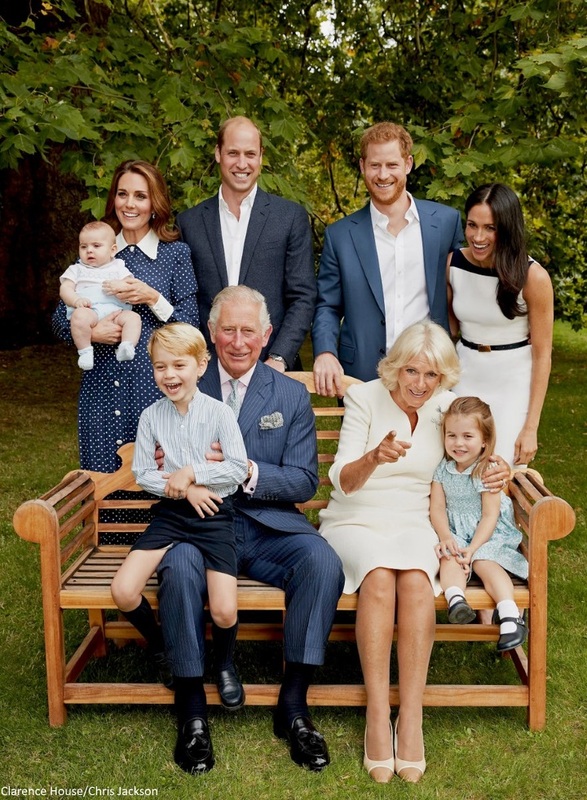 Considered the 'world's most exclusive pram' according to the Daily Mail, a Silver Cross has carried The Queen, her children, grandchildren and now her great-grandchild. 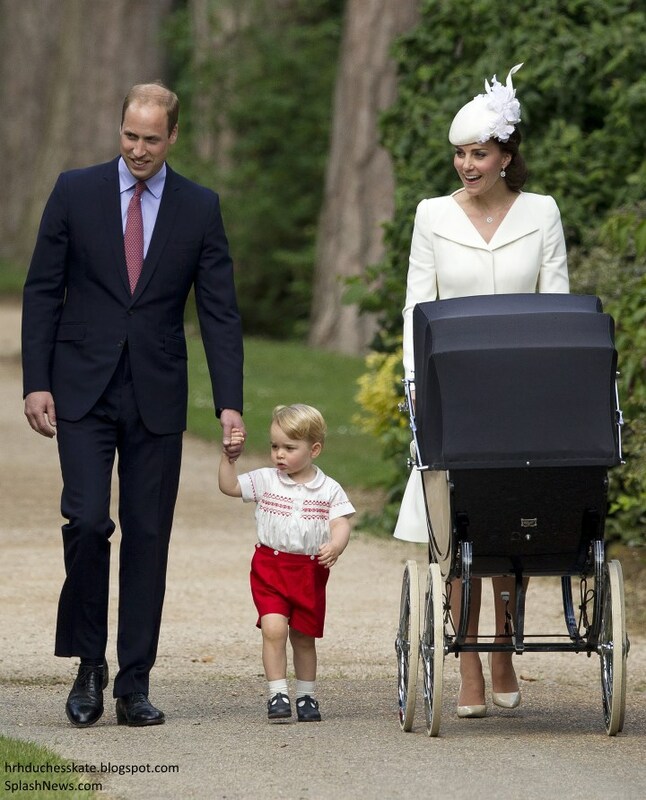 In fact the Cambridges are such fans of the pram they had it flown up to Scotland during their stay in Balmoral. The carriages were first created in 1877 by William Wilson and became hugely popular in the 1960s. 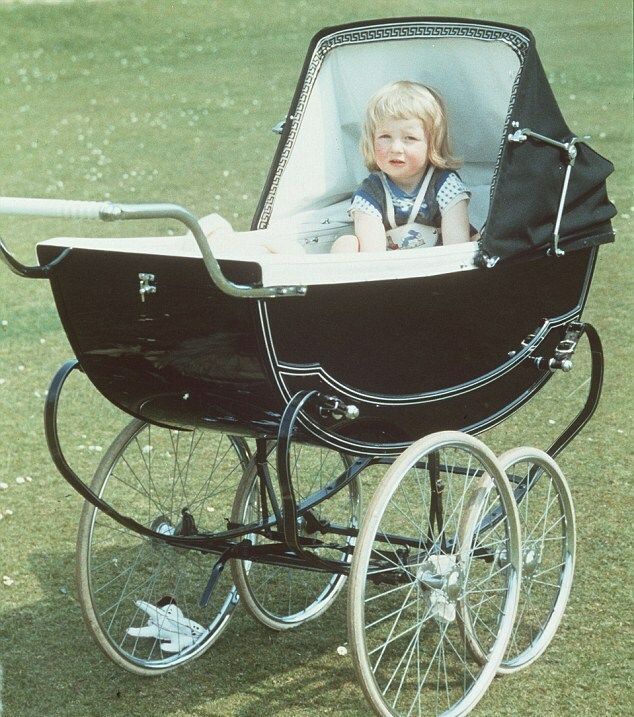 William's mother Diana spent her early days in the luxury buggy. 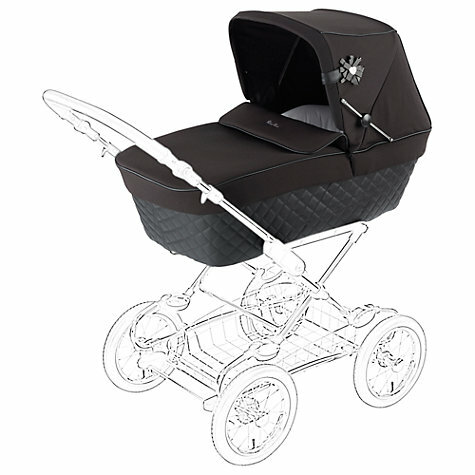 Let's take a closer look at George's stroller, the Silver Cross Sleepover Elegance Body in black. No doubt the brand will become even more popular following the royal sighting. 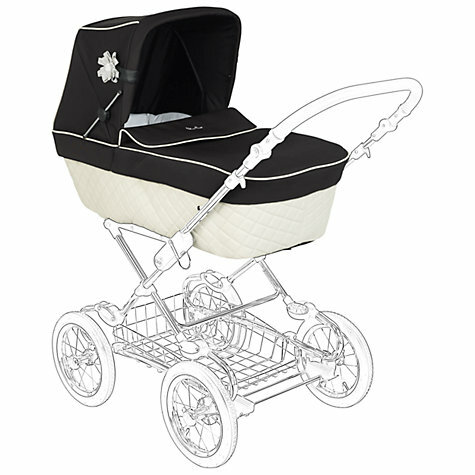 The £650 pram is available at John Lewis, a department store we know Kate frequents regularly. Below we see the stroller in black and cream. It is available at John Lewis. In December 2013, the Duchess purchased a couple of items fit for a king at the Chelsea branch of London chain Trotters. 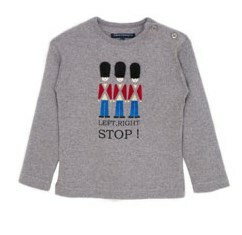 Kate picked up the aptly named 'George' jumper with a Union Jack on it. 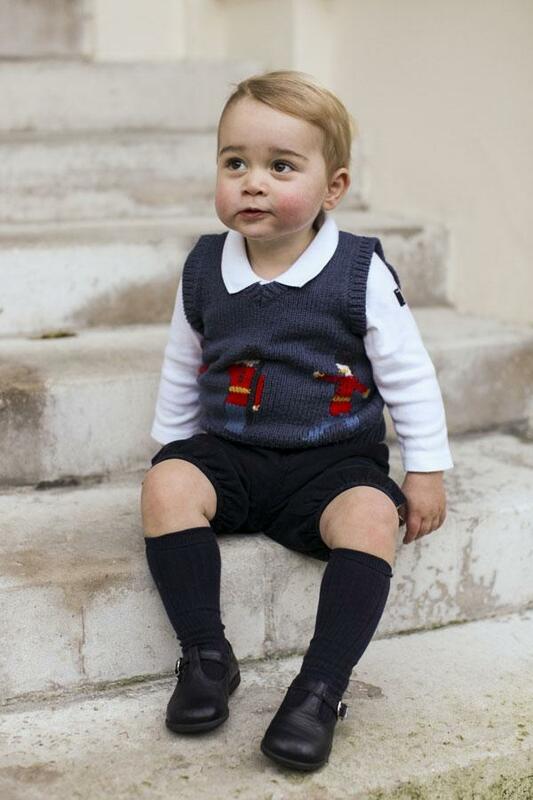 Prince George wore the 'George' jumper for a private press reception at Kensington Palace in March 2013. Apparently he was very well behaved and dribbled quite a bit. Kate also revealed he has "Middleton eyes". 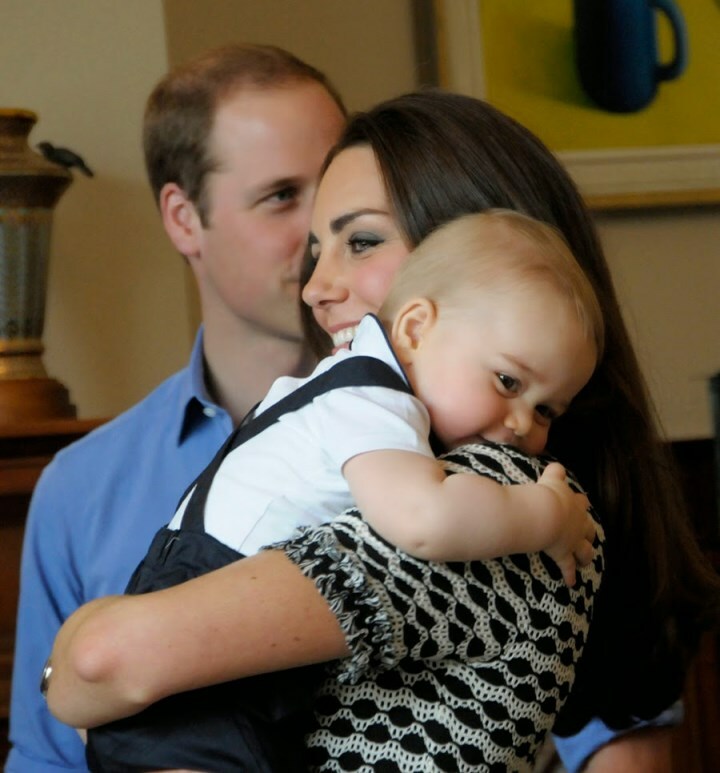 The Christening of Prince George took place on 23 October 2013 at The Chapel Royal, St James's Palace. 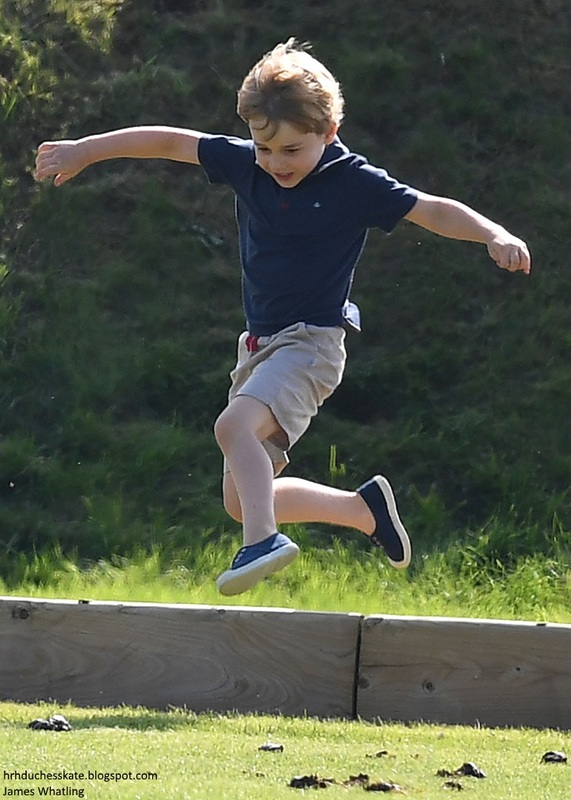 Twenty-two guests were invited including George's godparents, Jamie Lowther-Pinkerton, Emilia Jardine-Paterson, Oliver Baker, Zara Tindall, Julia Samuel, Hugh Grosvenor and William van Cutsem. 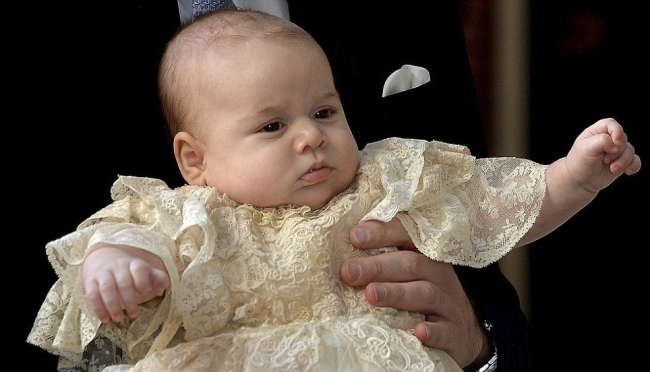 Prince George wore a hand-made replica of the royal christening robe, made by Angela Kelly, dressmaker to The Queen. 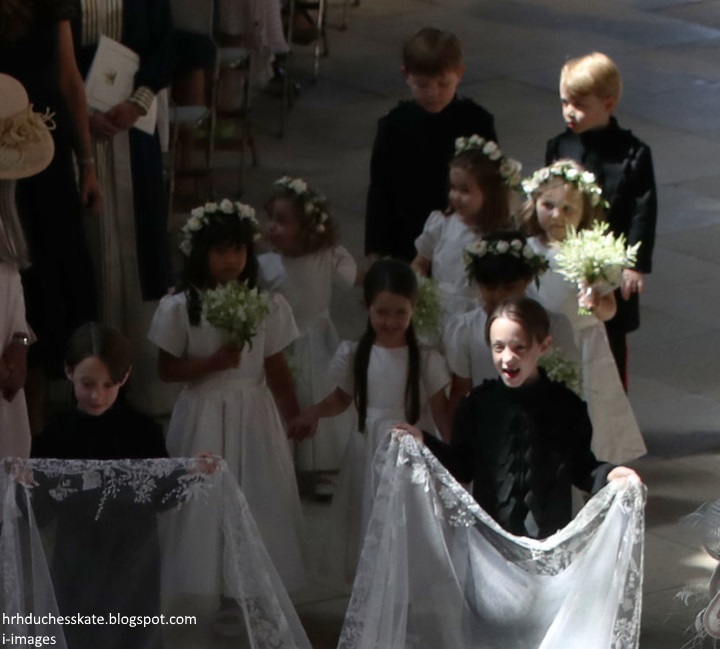 The original Honiton lace and satin robe, which is now 172 years old, was last used in 2004 with Lady Louise Windsor being the last royal baby to wear the piece. After years of wear it had become too fragile to use, so in 2008 The Queen commissioned a replica. It features the same length skirt, elaborate collars and bow as its predecessor. The first baby to wear it was was James, Viscount Severn, son of The Earl and Countess of Wessex. The Duke and Duchess of Cambridge released two informal family photographs taken by Michael Middleton as the first official photos of Prince George. The relaxed shots show William and Kate with their son and much-loved dog Lupo in the garden of the Middleton family home in Bucklebury, Berkshire. 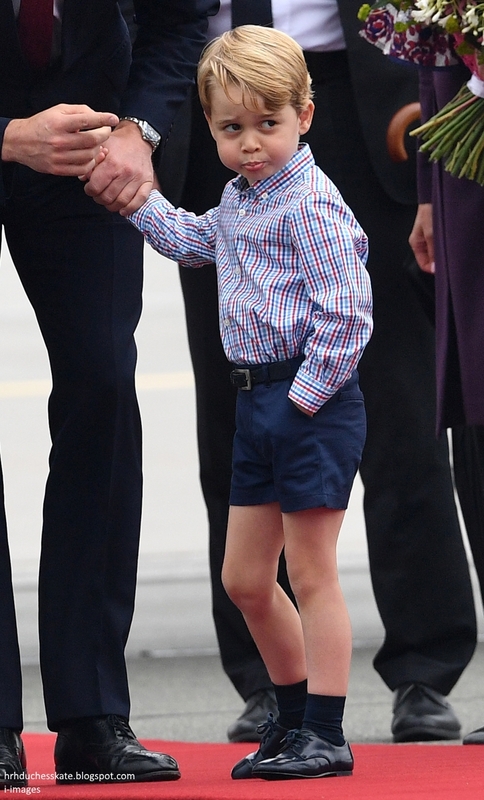 Once again Prince George wore his G.H. Hurt and Son Merino Wool Shawl. 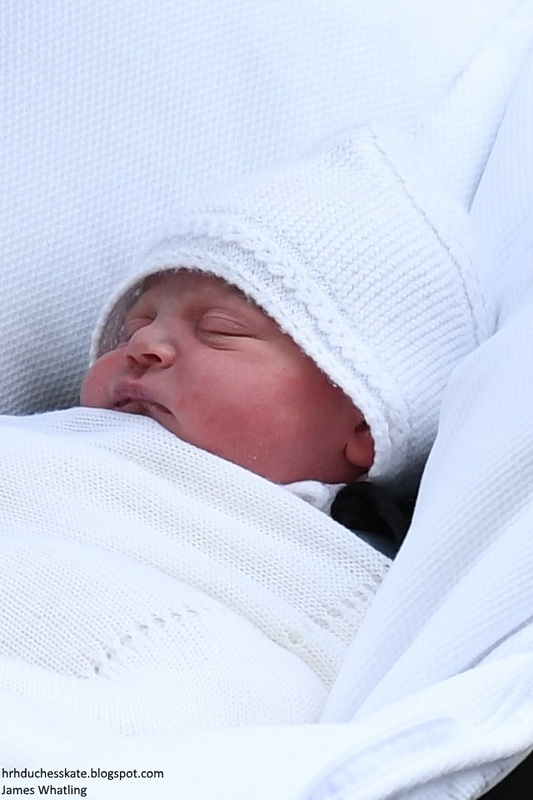 His Royal Highness Prince George Alexander Louis of Cambridge was born at 4.24 p.m. on 22 July 2013 weighing 8 pounds 6 ounces at The Lindo Wing, St Mary's Hospital, Paddington. Our posts on George's arrival can be found HERE, HERE and HERE. The Prince's first swaddle was the Jungle Jam Print by Australian brand Aden + Anais. The 100% cotton swaddles comes in a four pack for £50 and can also be used as a burp cloth, nursing and strolling cover. George's gorgeous shawl is the £45 Super-Fine Wool Merino Christening Shawl by G.H. Hurt & Son. The company made two dozen shawls for the birth of Prince Charles. 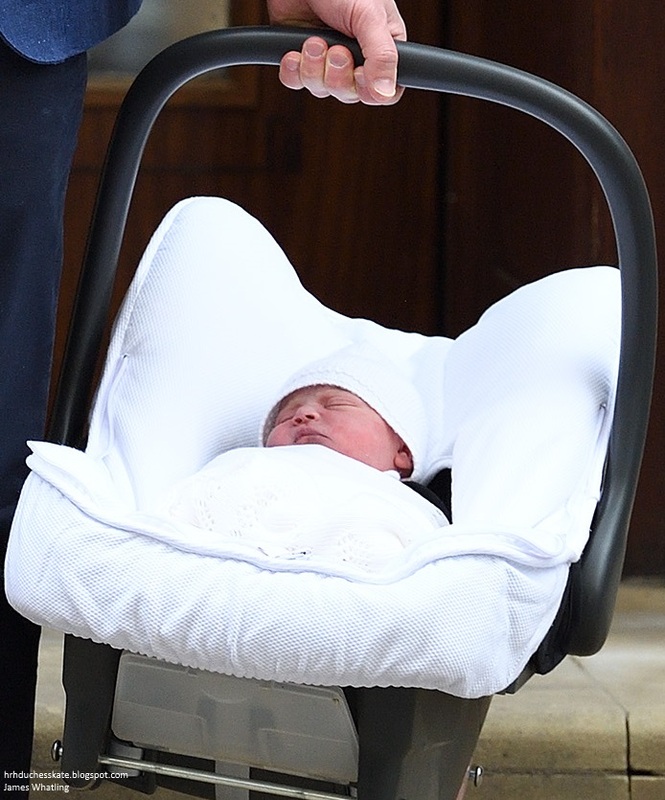 Prince George's car seat is a Britax B Safe. It is designed to be lightweight and travel-friendly yet engineered to the high safety standards of Britax. I loveeee those chubby cheeks! Thank you SO much for creating a Prince George page! Such a bright spot in my day! I'm glad you posted the Trotters George sweater. I love shopping at Trotters when I am in London. Such adorable clothes and I always buy my kiddos wonderful children's books there! 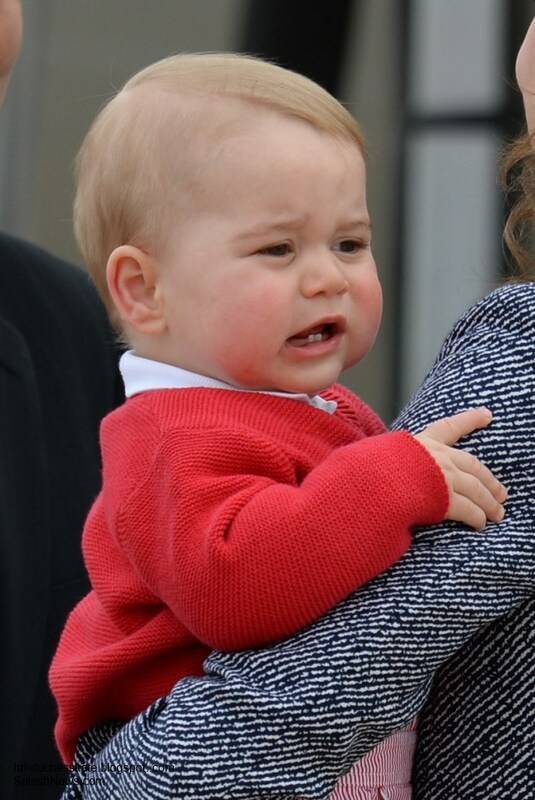 Prince George is an adorable baby. 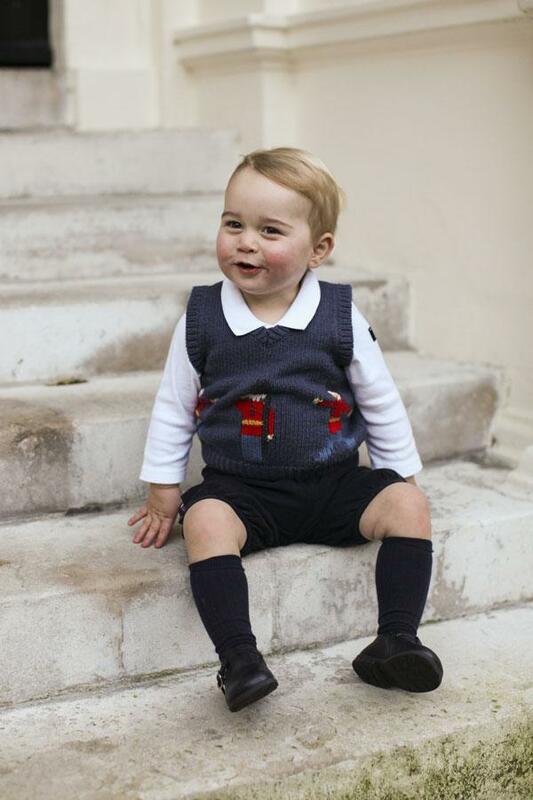 Please check the year of his wearing the George sweater at the Kensington Palace press conference in your post. I'm sure it must be 2014. I love your site. Keep up the amazing work you do on it. I truly appreciate your efforts. Thanks so much!! Thank you for creating this special page for Prince George. He is precious and we all enjoy hearing about him and what he wears and where he goes with his parents. Keep up the good work with the whole site. Well done, I'm sitting in front of my laptop and enjoy every sentence of your post. I think he is gorgeous little boy and particularly like the photo on him on his mums shoulder with a smile on his little face. He is quite the photogenic baby. He already steals the spotlight and it's nice to see that he's included for the experience and not just the photo op. He was clearly playing with the other children at the play date and looked to be enjoying himself. 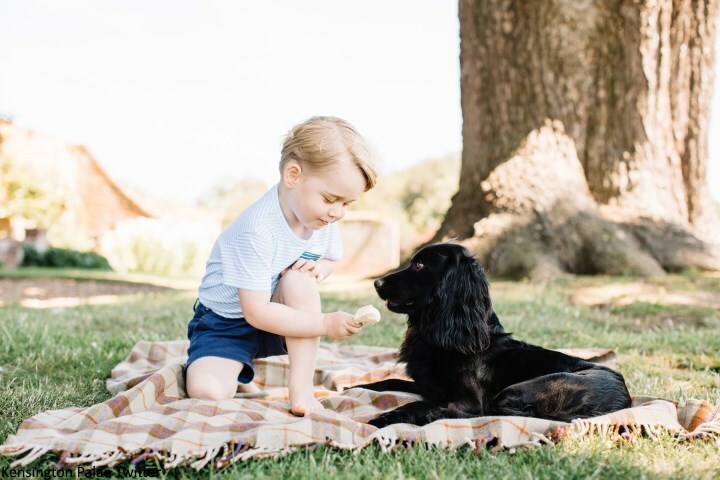 I love that in their family portraits (taken by Mr. Middleton and Jason Bell) they have included Lupo, and from the looks of the latest photo, Prince George and Lupo are well on their way to being best friends. 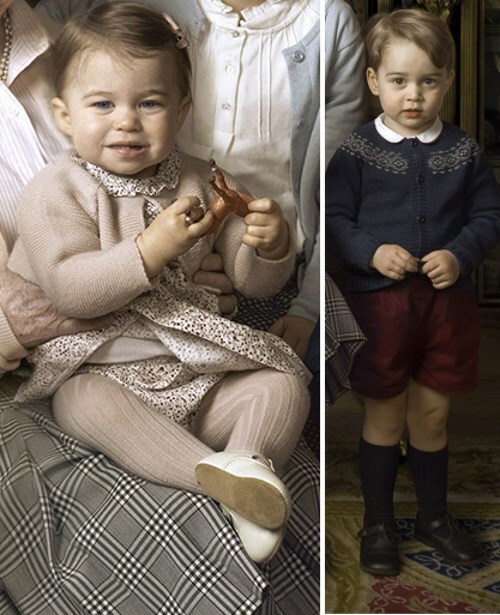 George does look like his late grandmother, Princess Diane when she was a tot. Those cheeks! He will forever be Cheeks Cambridge or Prince Cheeks to me. What a cutie. My heart really does choke with love,and emotion for Prince George, grandson of Princess Diana. 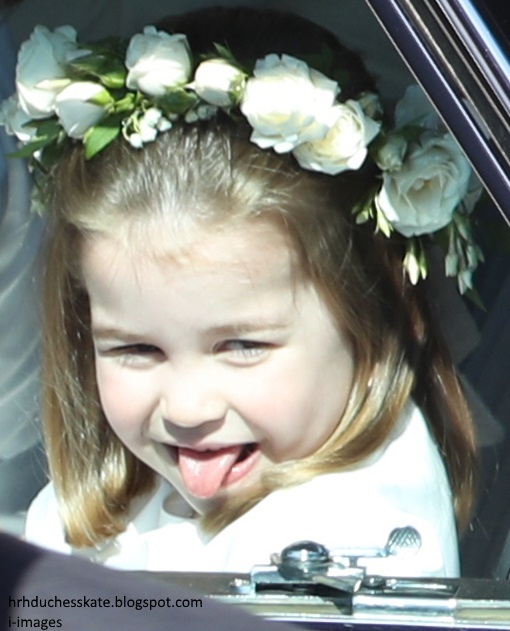 Cheeky, lovable, cute, and look Prince-Harry rascally in a good way. It is undoubtedly the Diana angle that bring's out the emotions in me too. He probably could have been born grumpy, and still exude such adoring qualities. How wonderful it would have been to see His future Royal 'Handsomeness' in Diana's arm. Recently, it was good to see Prince William regally flanking Her Majesty the Queen on one side, and his dad on the other... at the 'Order of The Garter, at Windsor Castle. When it come's to looks, Prince George is in good company, on Diana/father's side. 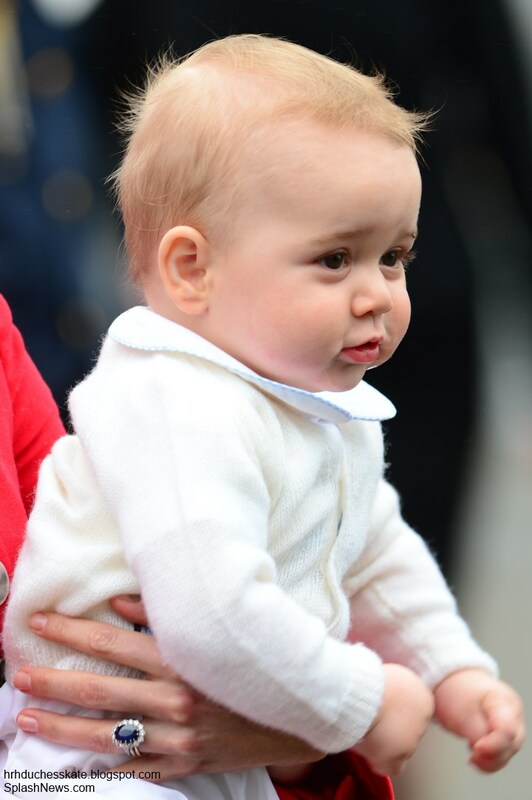 Happy First Birthday Prince George from across the pond (San Jose, CA). She just had a baby and a few hours later she had to be looking good, wearing makeup, nice dress and smiling no matter what and show off her new baby to the whole world. what a discipline she has to have. And the little baby George already 10 month old had to go for a long trip. Which parents would take their baby oversees and stay there for two weeks, going from place to place, engagement to engagement, everyday in a different city. Very exhausting. what was is it two weeks, going from place to place, flying an airplane for 14 hours straight. He is a strong baby like his parents. Such a trip, engagement like went they went to New Zealand, Australia had to be exhausting for everybody. I just noticed that the outfit under George's cream sweater when he landed in NZ is the smocked romper with the sailing boats on it. You can see a little bit of blue under his sweater and it has the same blue and white edging on the collar. Why hasn't this page been updated lately? Much has happened since George's first birthday. I agree! Where are Charlotte's pictures? Thank you for doing new page! Thank you for updating this site with Charlotte' s pictures. They are both adorably cute children. The Duke and Duchess seem to be doing a very good job with bringing them up. I am amazed at all the shades of blue George has worn with spots of red thrown in. He does look good in blue, but I am sure he looks good in other colors, also. I am sure we will see a bigger variety in time. Thank you for the great pictures and stories! Looking forward to the India pictures! I hope a third baby gets added to this page!!! It has been a long time between updates to this page. We know there are many photos thar could be added. Why the delay? I will update the page this week. I'm sorry for the delay, I just haven't had time to get it up to date. Thank you so much, I visit this page nearly every week. A nice summery!